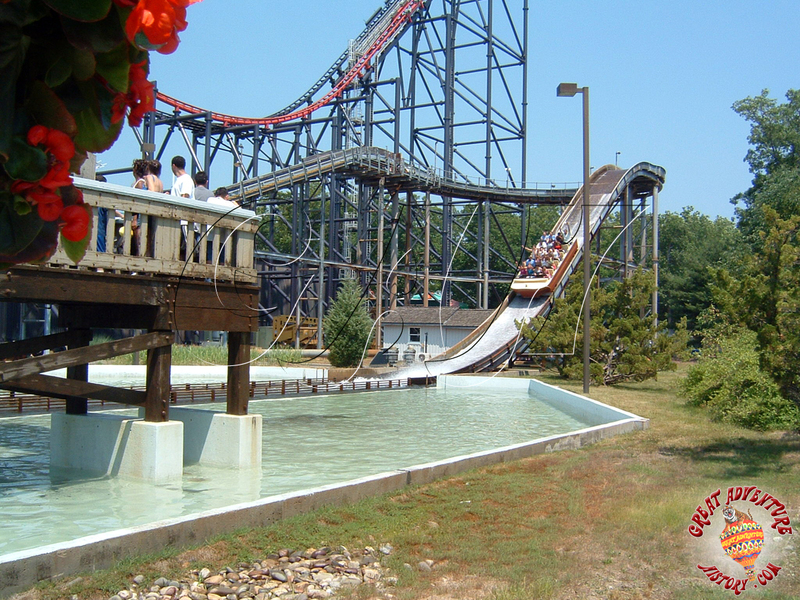 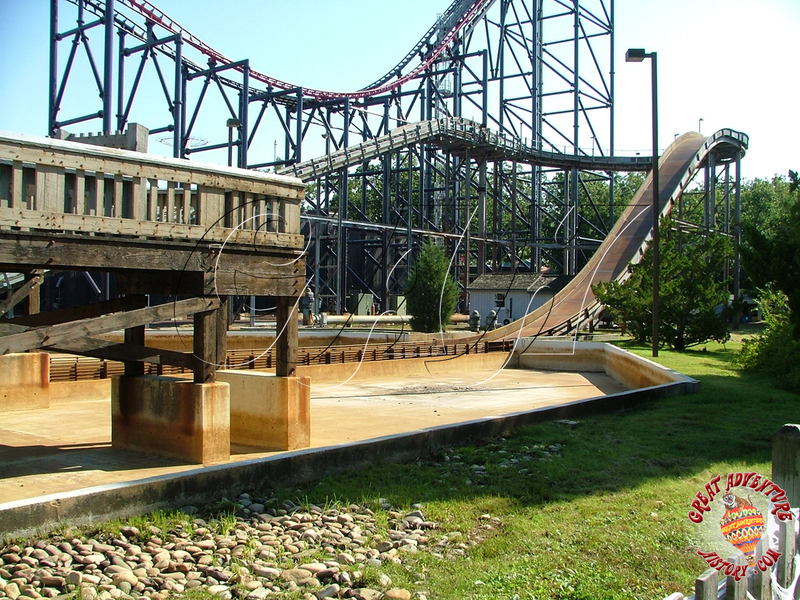 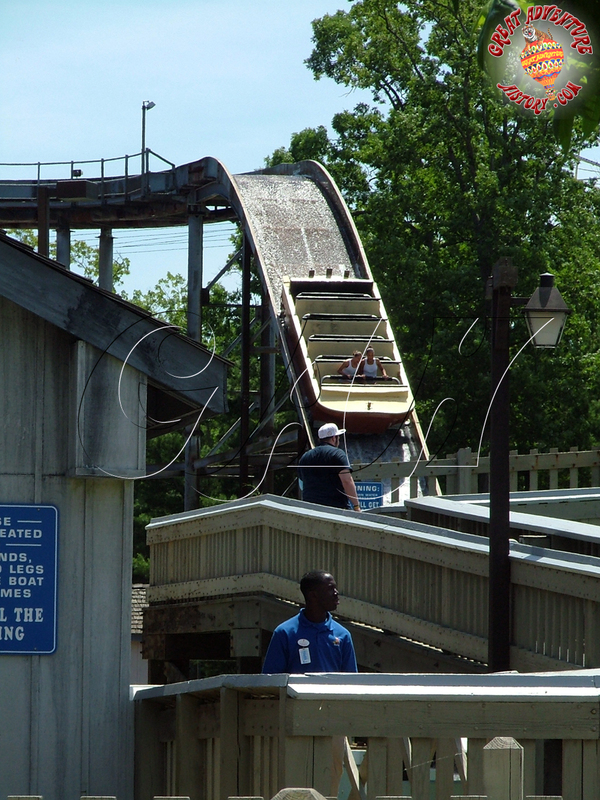 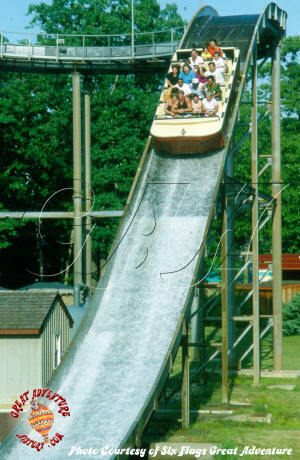 One of the oldest types of rides dating back to the rise of the first amusement parks is the "Shoot the Chutes" style attraction where boats careen down a long steep hill into a pool creating a large splash to wet the boat occupants. 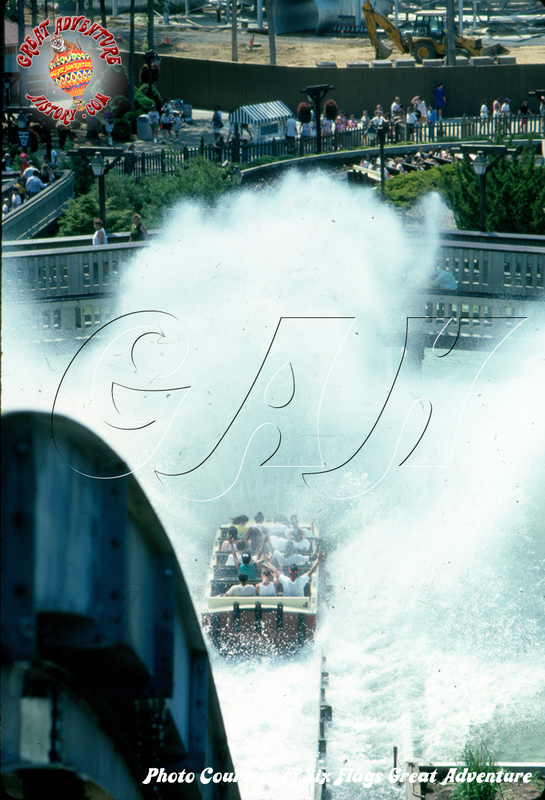 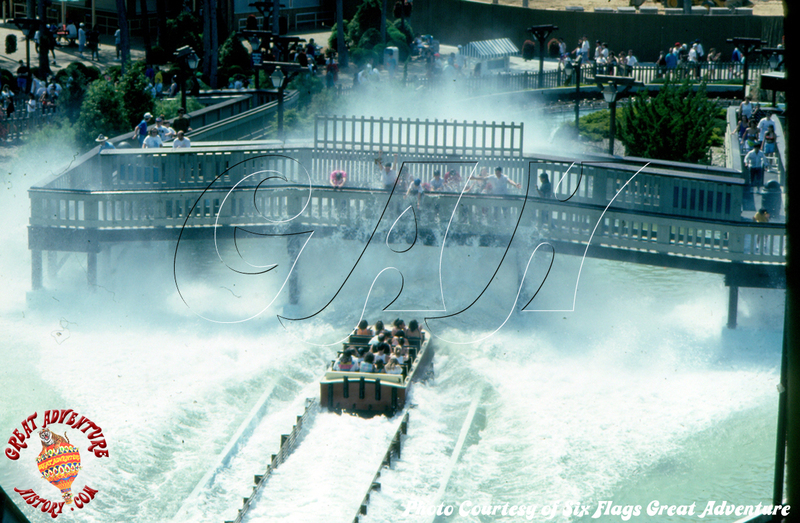 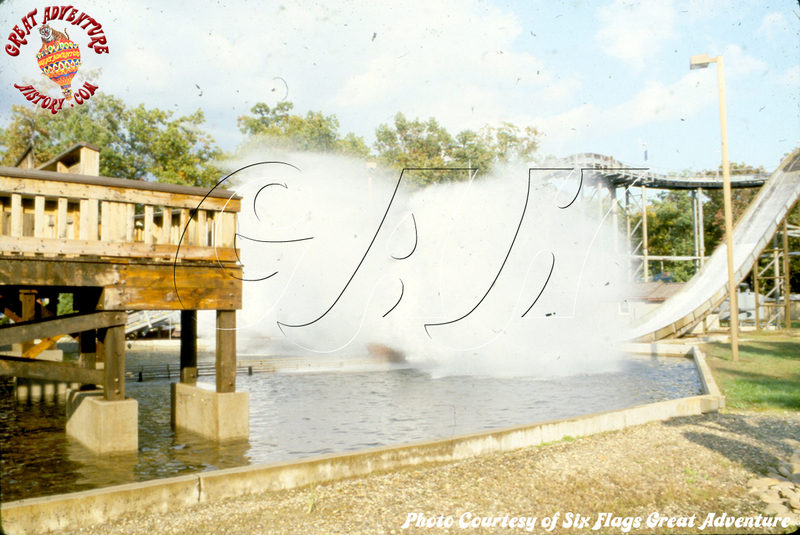 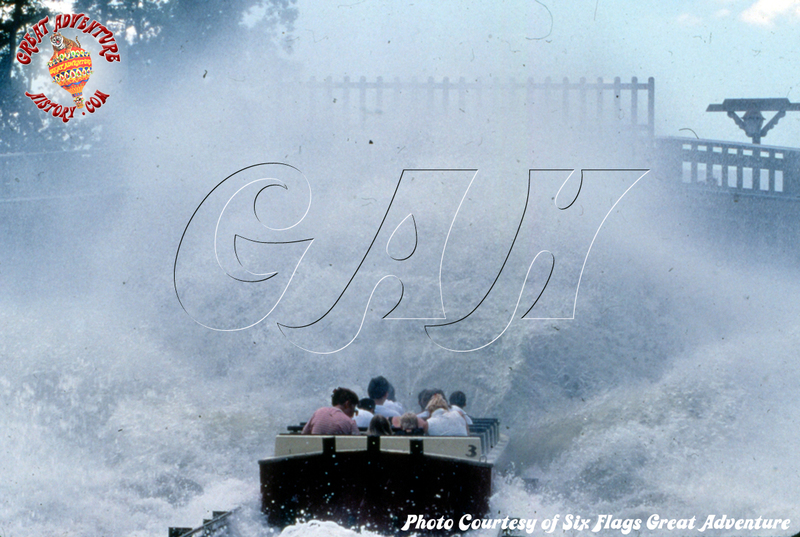 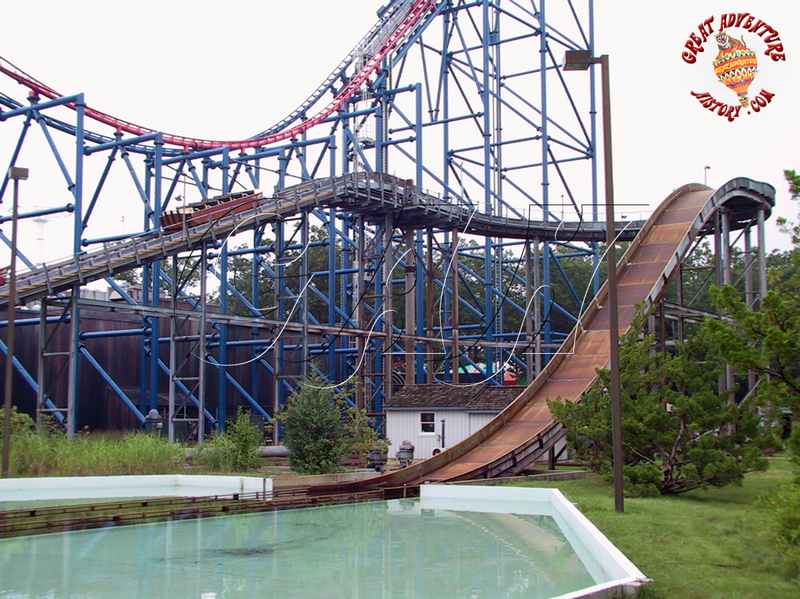 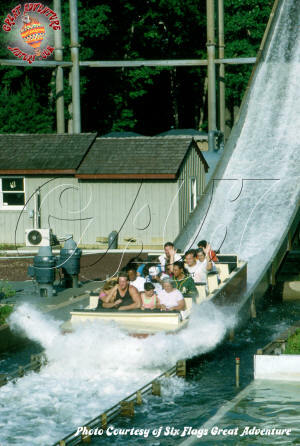 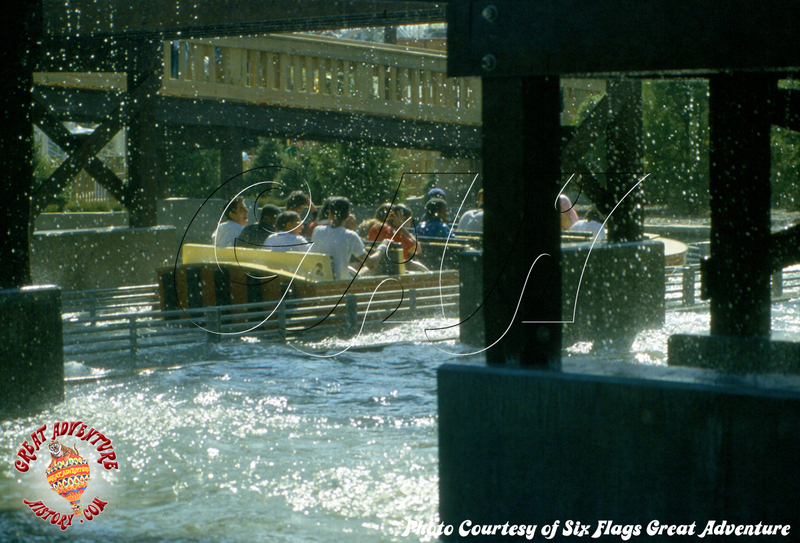 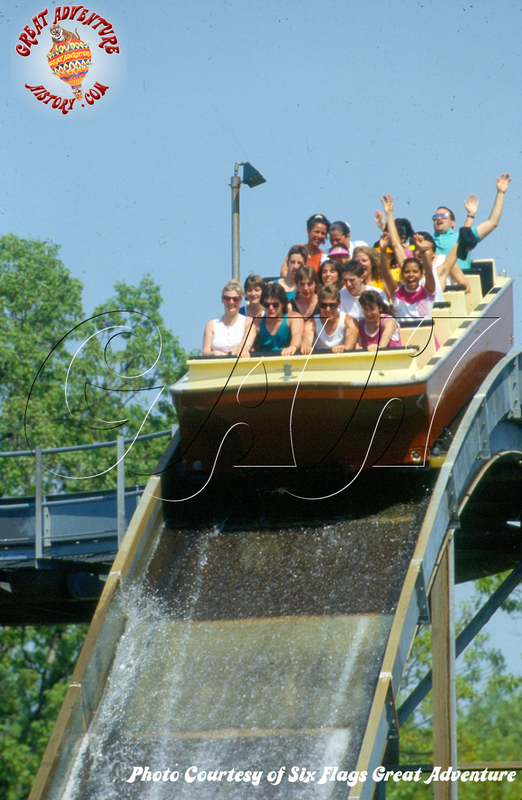 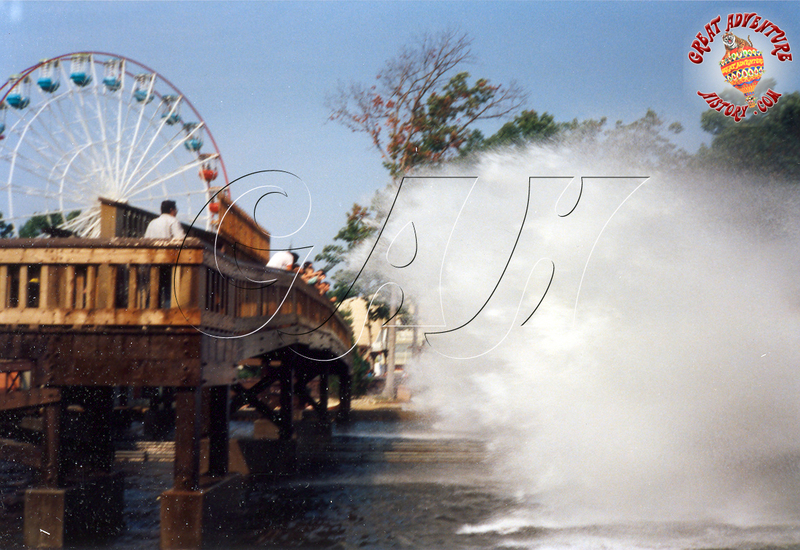 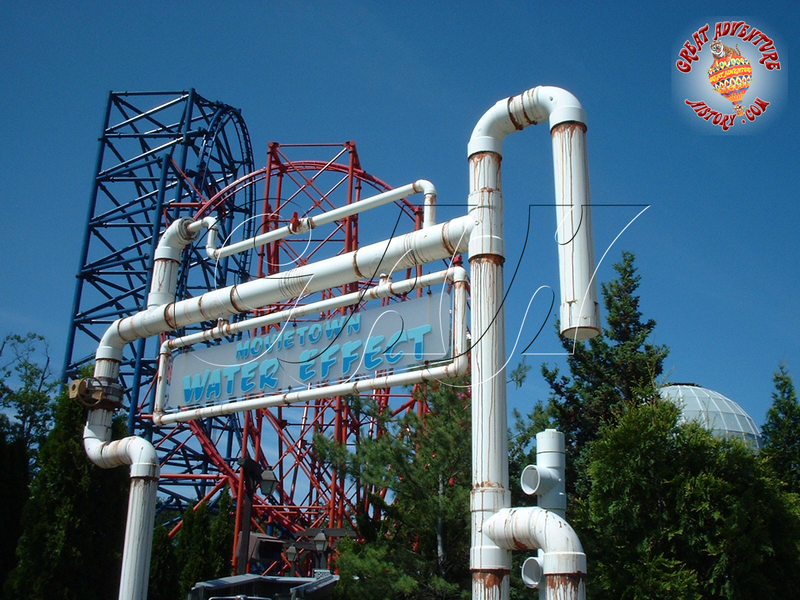 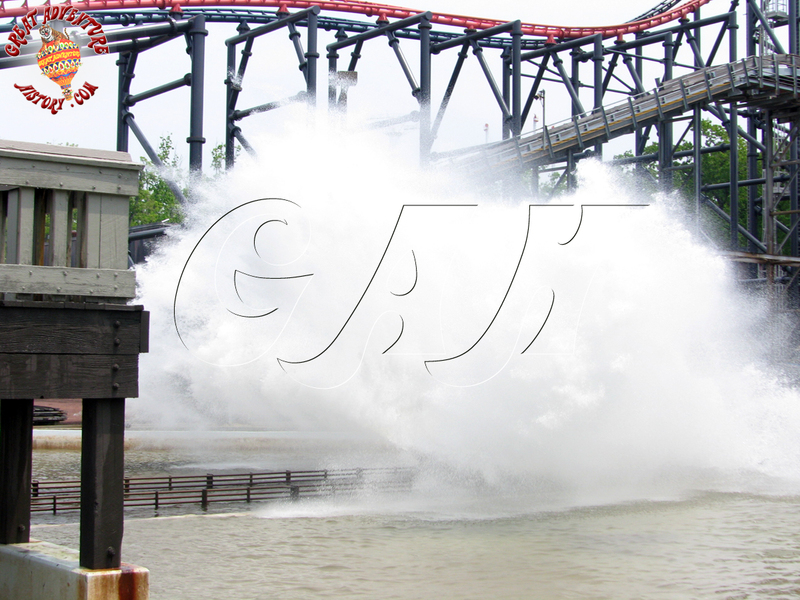 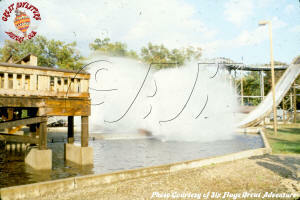 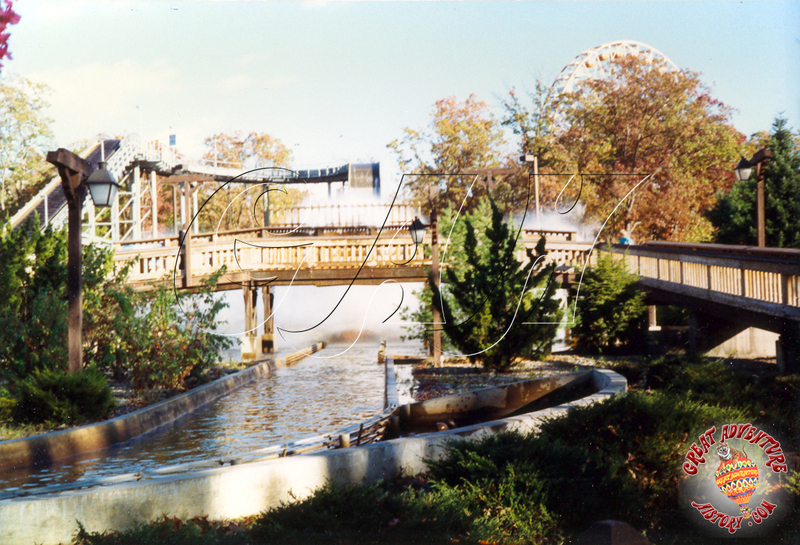 In the 1980's ride manufacturers revisited the concept and created a modern version of the ride which resulted in a full circuit water coaster, creating a larger splash designed to not just get riders and observers wet, but absolutely soaked by a wall of water. 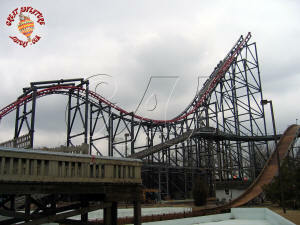 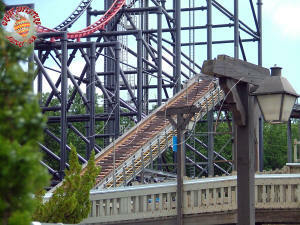 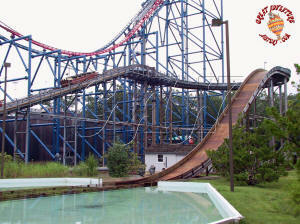 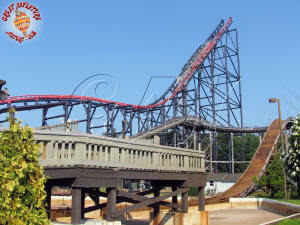 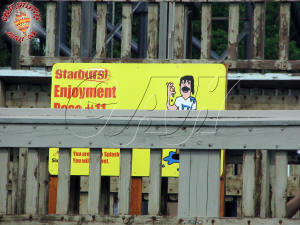 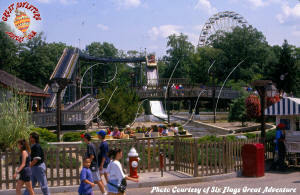 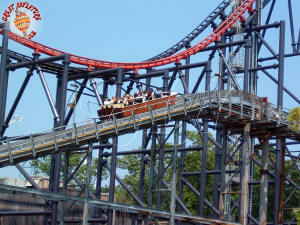 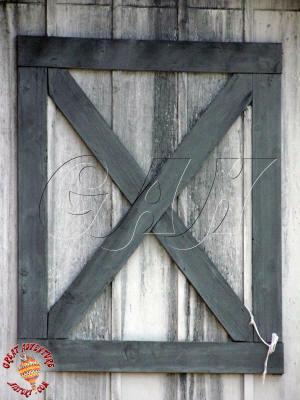 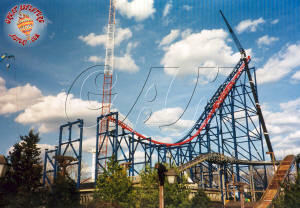 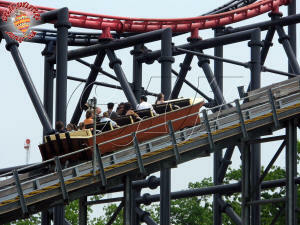 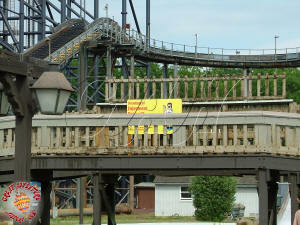 Six Flags has a long history of introducing the latest and greatest rides to their guests throughout the country. 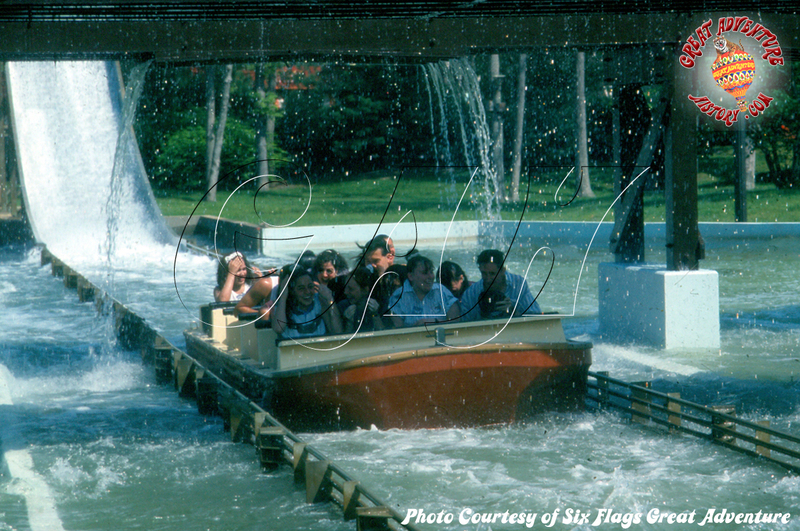 In the 1960's they pioneered the modern water ride with the introduction of log flume style rides which quickly became a standard for the entire theme park industry. 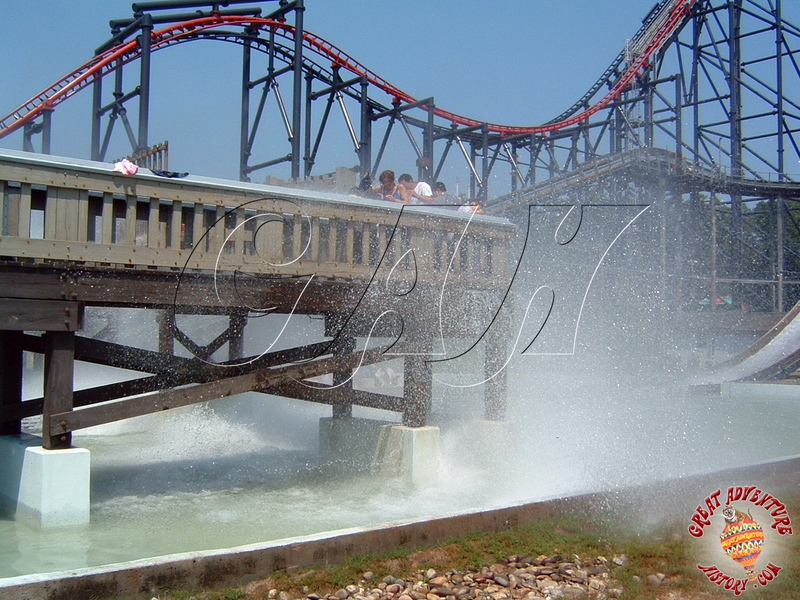 The park-going public loves water rides since they offer thrills and a great way to cool off from the heat of summer, and Six Flags responded with more ways to cool off and get wet. 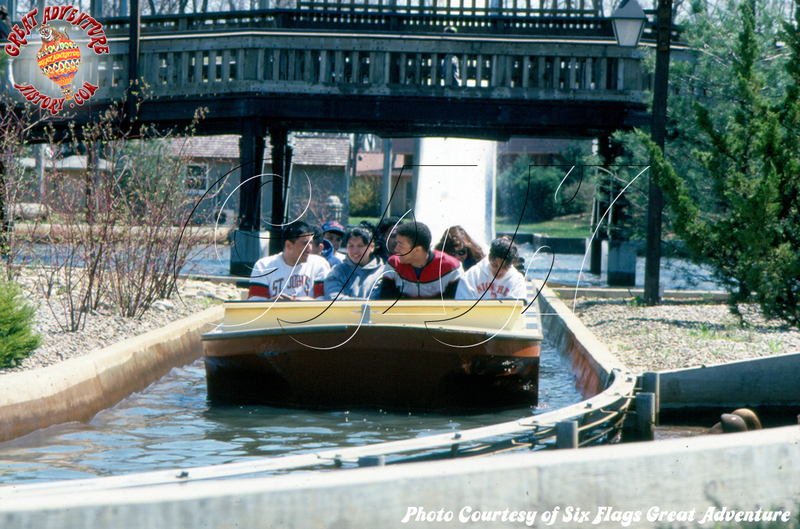 In the early 1980's they went to the next level with the introduction of the river rapids ride which also quickly became a staple of theme parks around the world. 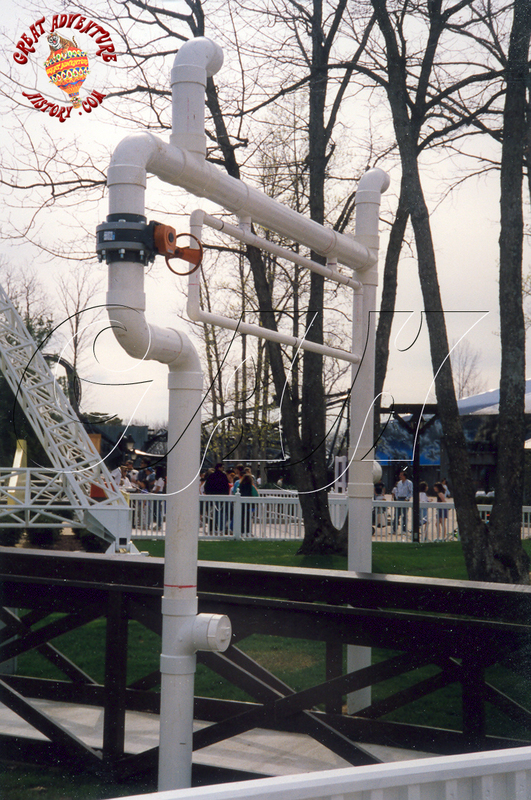 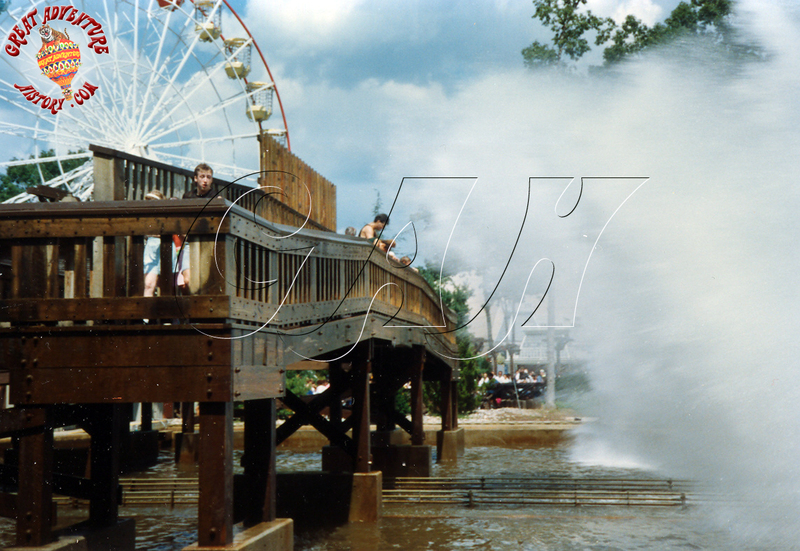 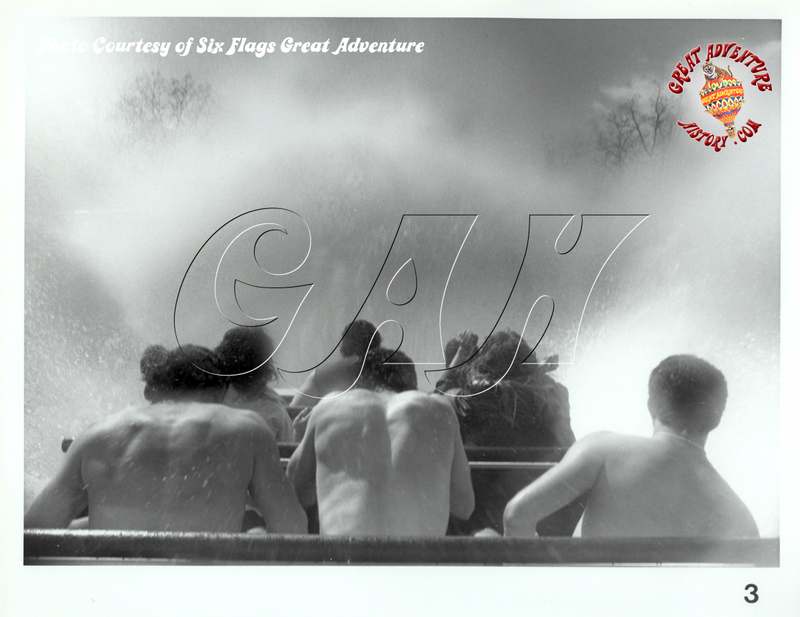 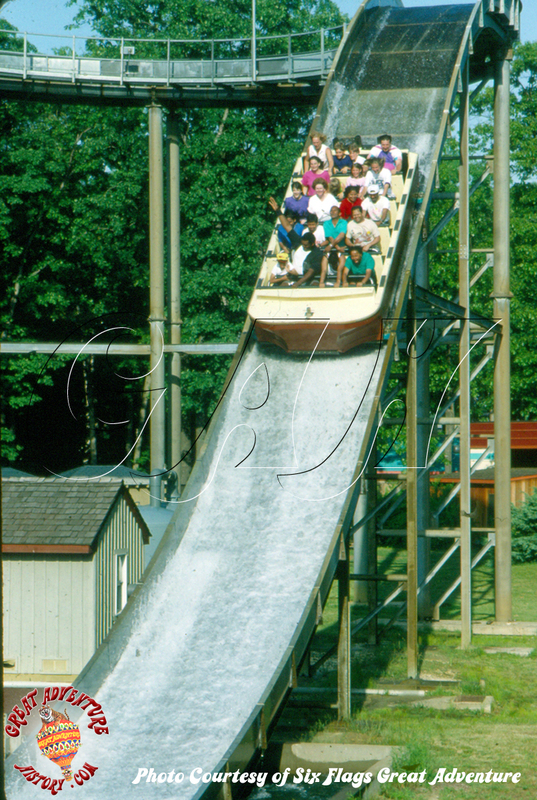 In the mid 80's manufacturers came up with the next big thing which really was one of the oldest amusements- they updated the "shoot the chutes" concept with the technology of the flume ride, and the splash boat was the result. 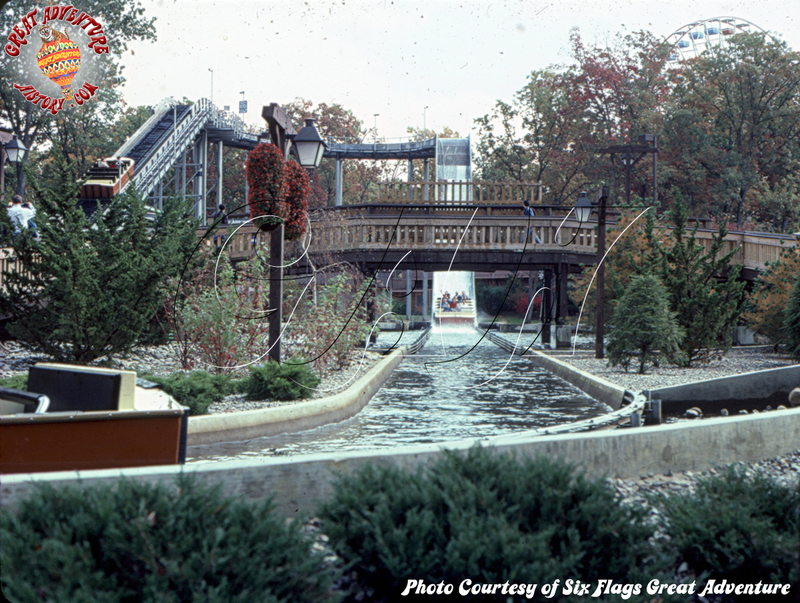 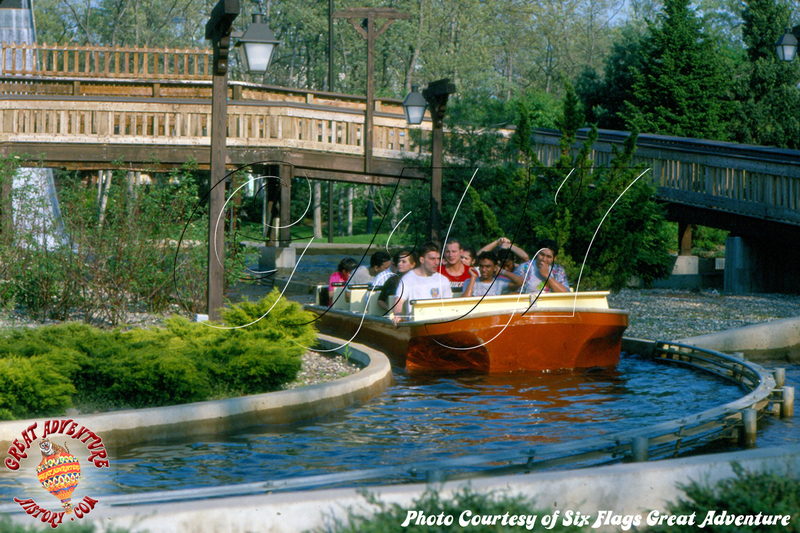 Six Flags introduced splash boat rides in their parks coast to coast, and creatied a new wave of excitement with the addition of SplashWater Falls at Great Adventure. Photo #1: "Wow! What a splash! 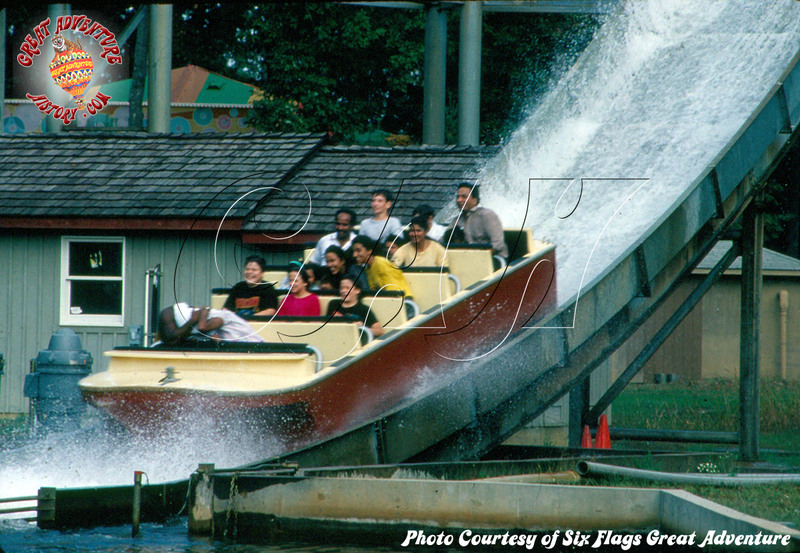 Guests on Splashwater Falls get soaking wt when they plunge into 300,000 gallons of refreshing water at Six Flags Great Adventure in Jackson, NJ. 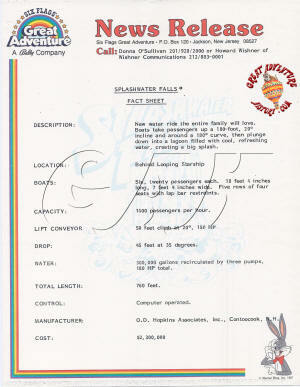 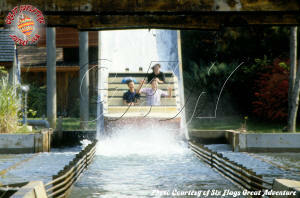 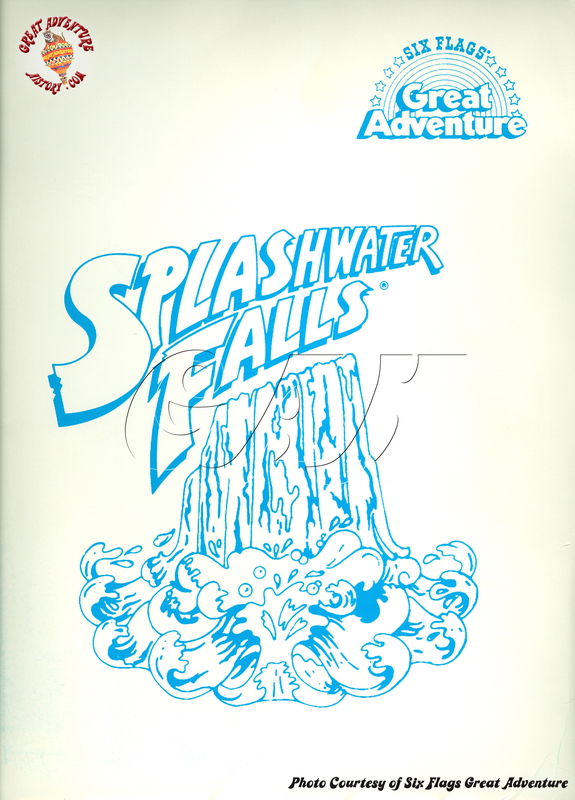 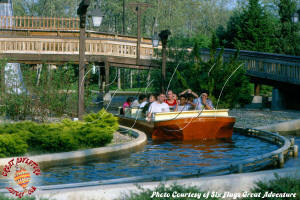 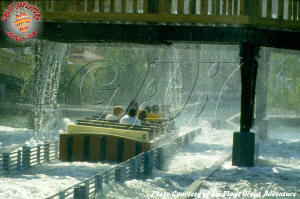 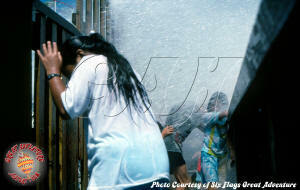 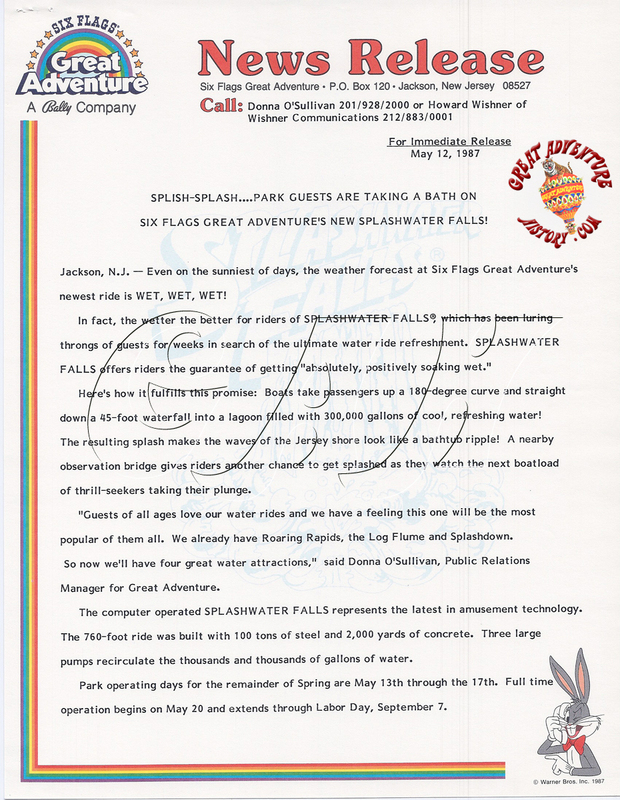 Splashwater Falls joins Roaring Rapids, Log Flume, and Splash Down as one of the park's wettest attractions." 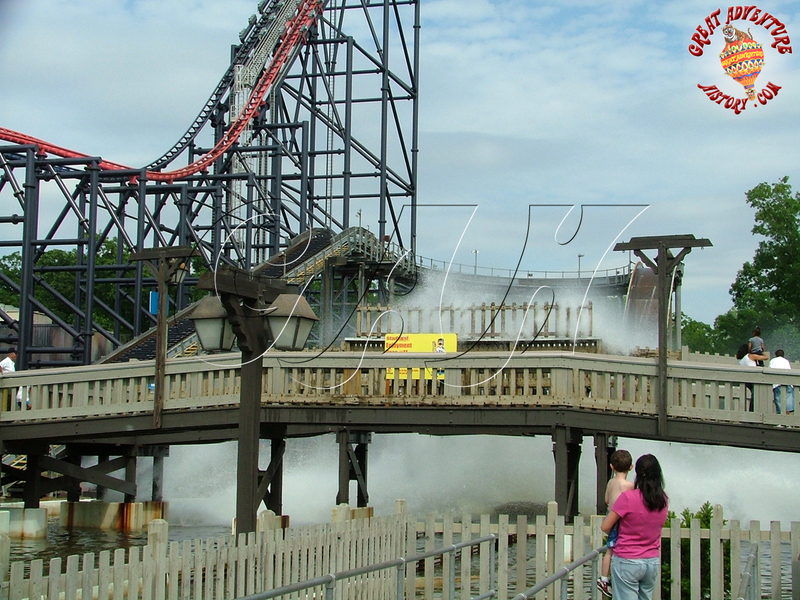 Photo #2: "Splashwater Falls, the newest water sensation at Six Flags Great Adventure in Jackson, NJ, won't leave you high and dry. 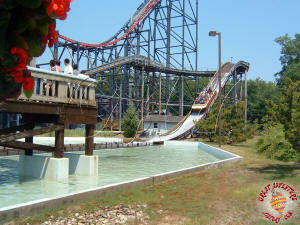 It takes you 180 feet in the air and drops you into over 300,000 gallons of cool, refreshing water." 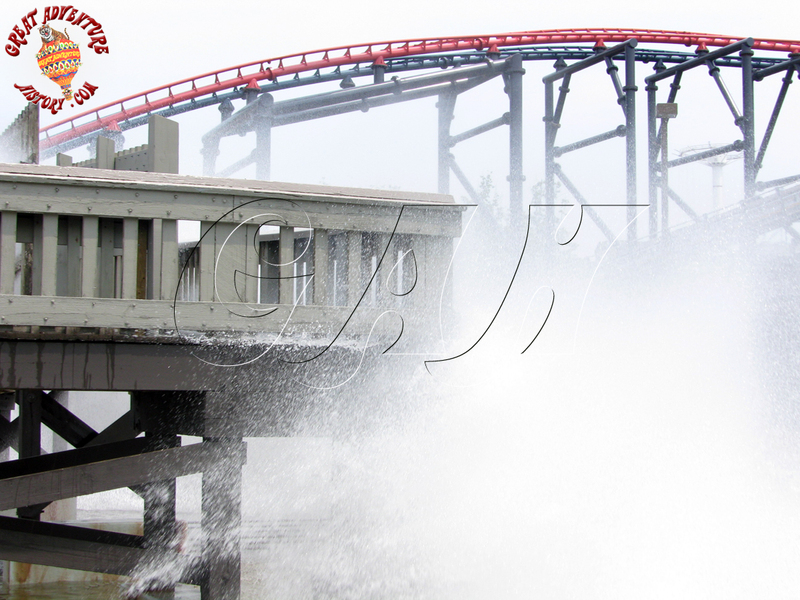 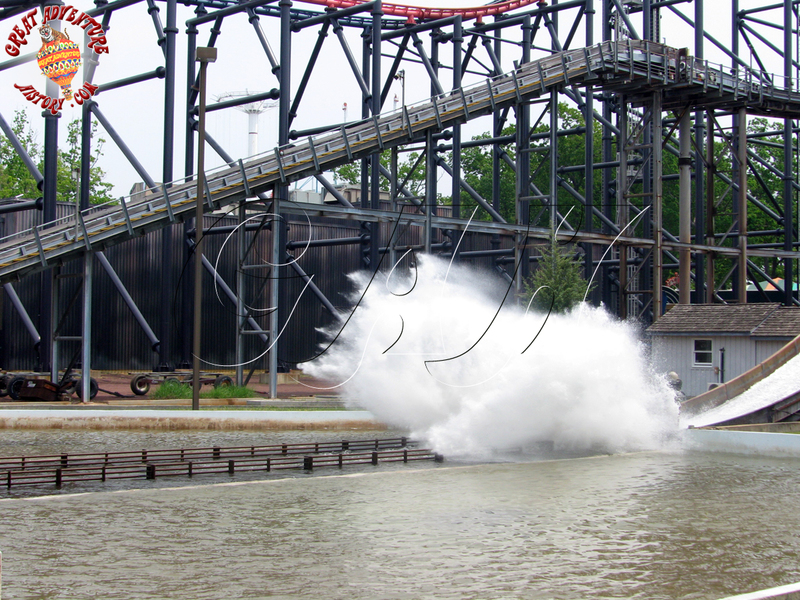 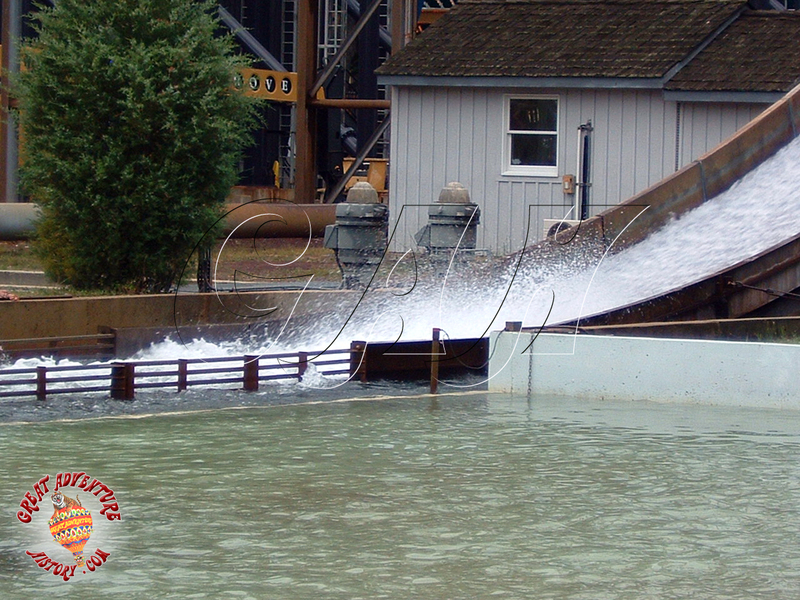 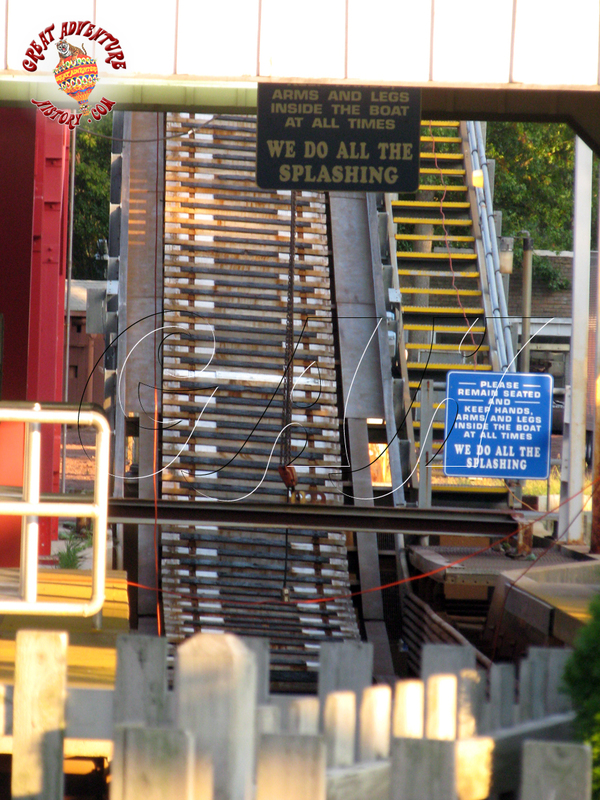 (GAH Note: 180 feet was the LENGTH of the lift hill) Photo #3: "A wall of water engulfs these Six Flags Great Adventure guests, as their 20 person boat slides into 300,000 gallons of water. The wall of water is the wet and wild climax of Splashwater Falls, the latest water ride at Six Flags Great Adventure, Jackson, NJ." 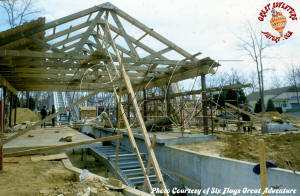 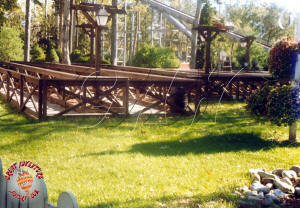 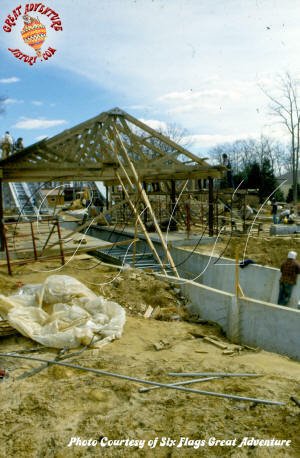 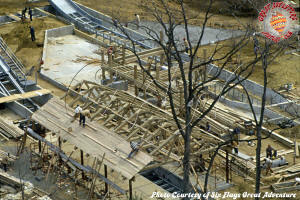 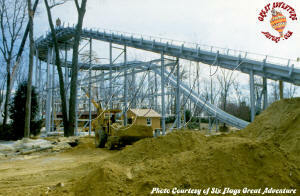 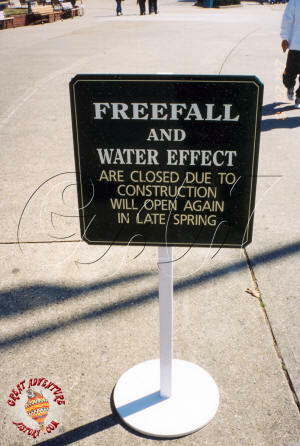 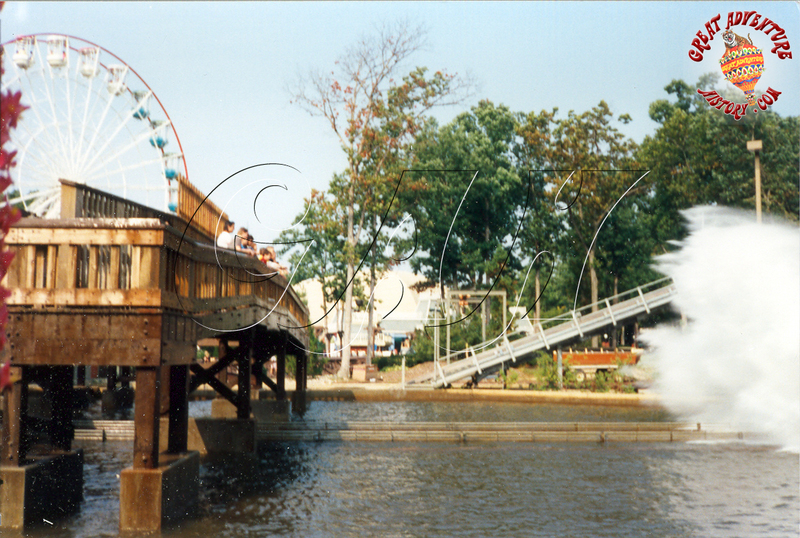 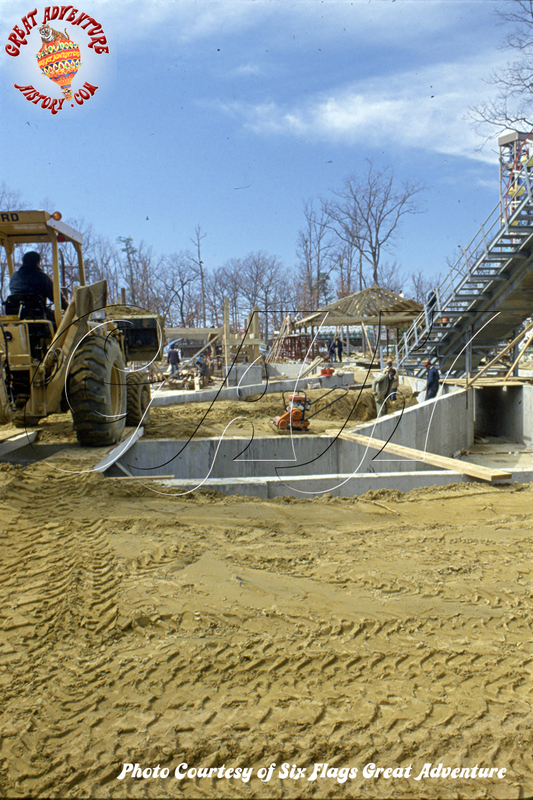 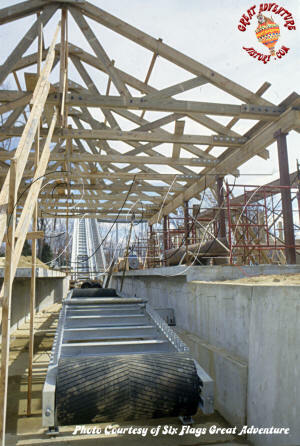 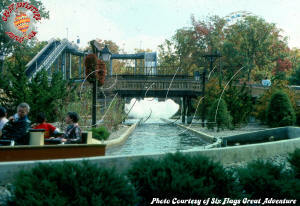 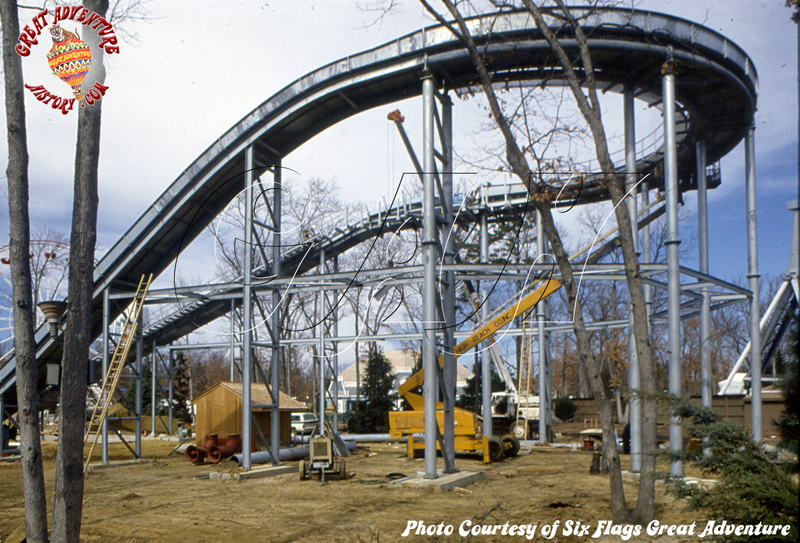 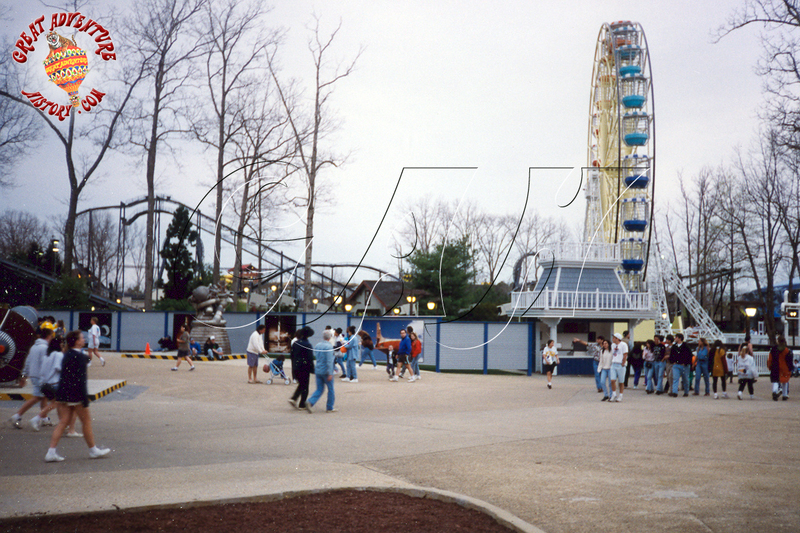 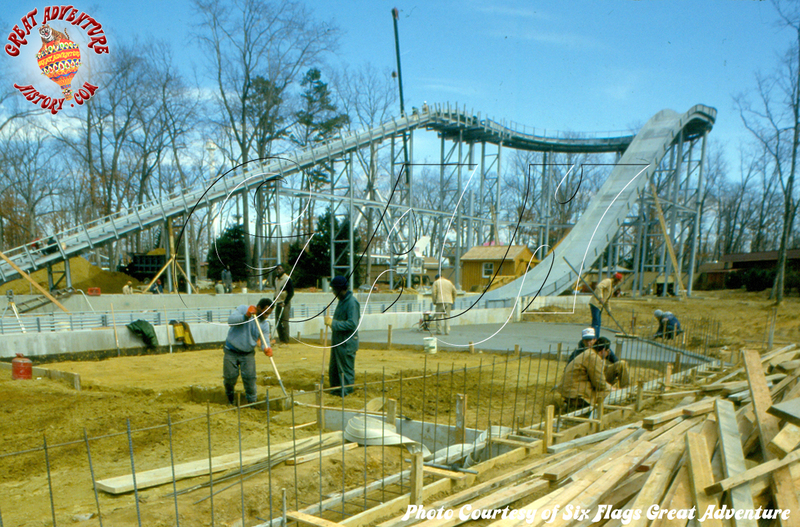 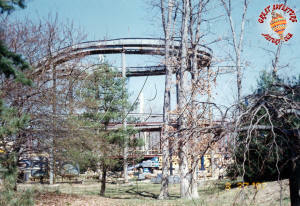 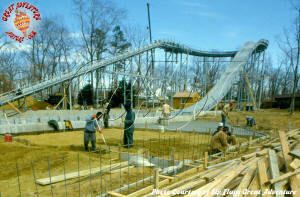 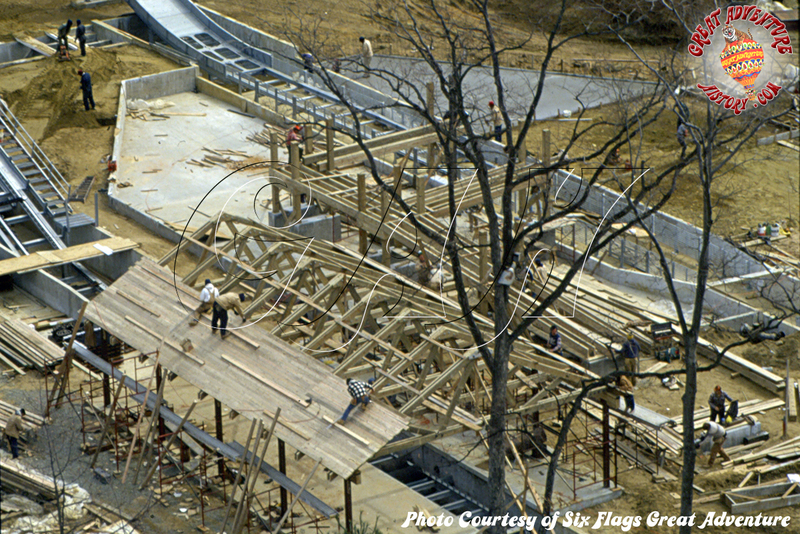 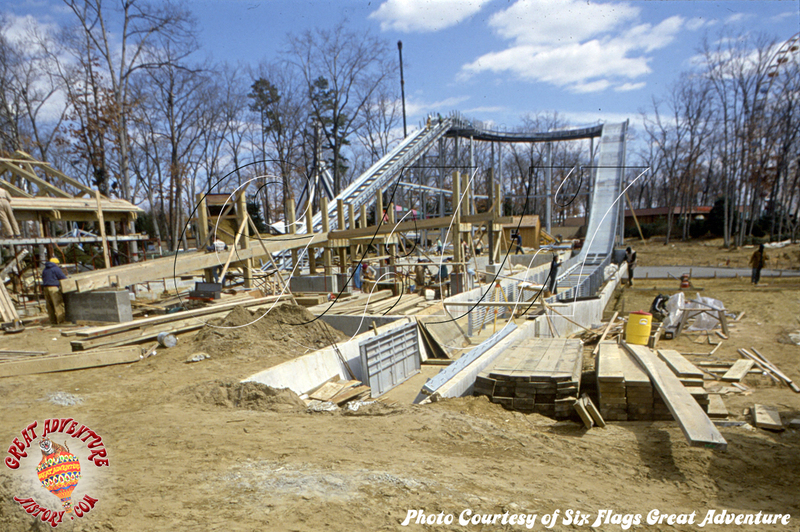 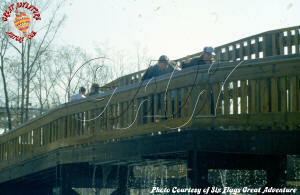 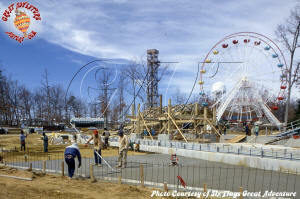 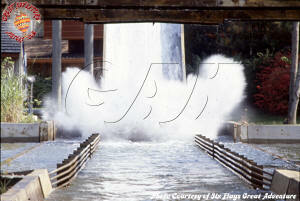 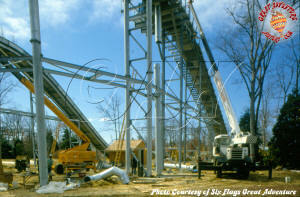 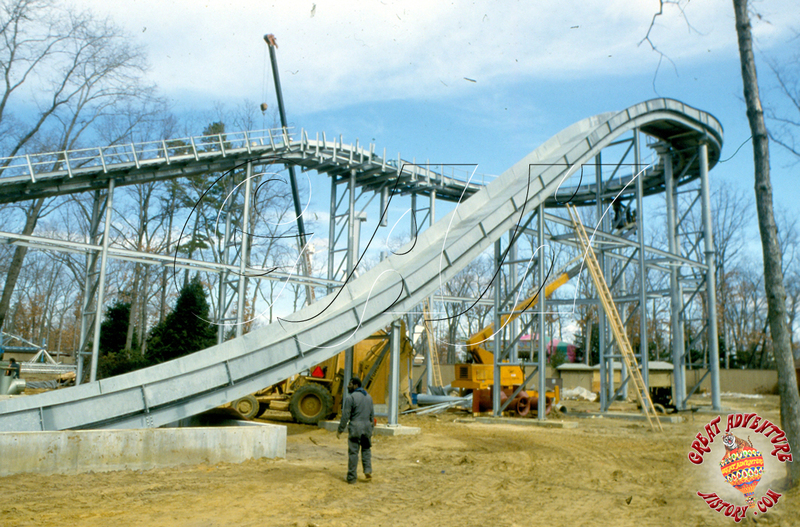 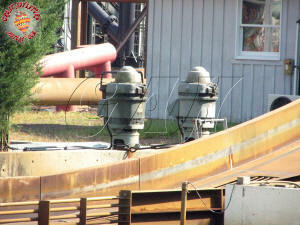 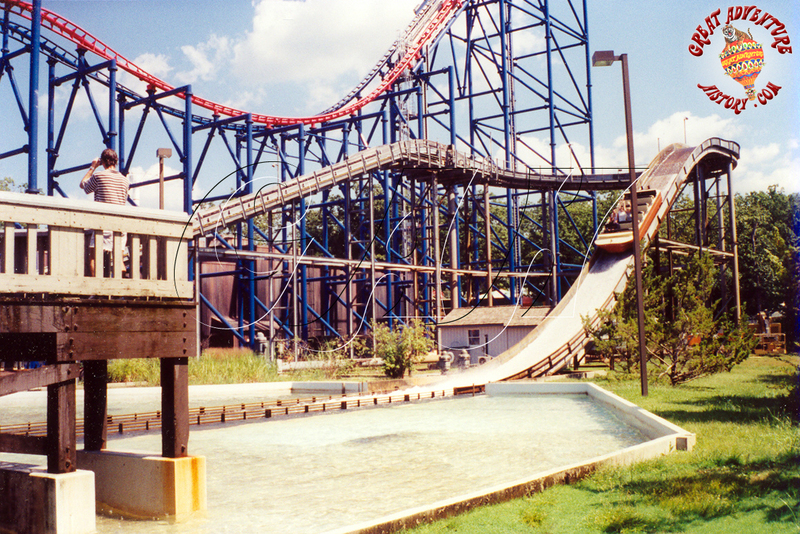 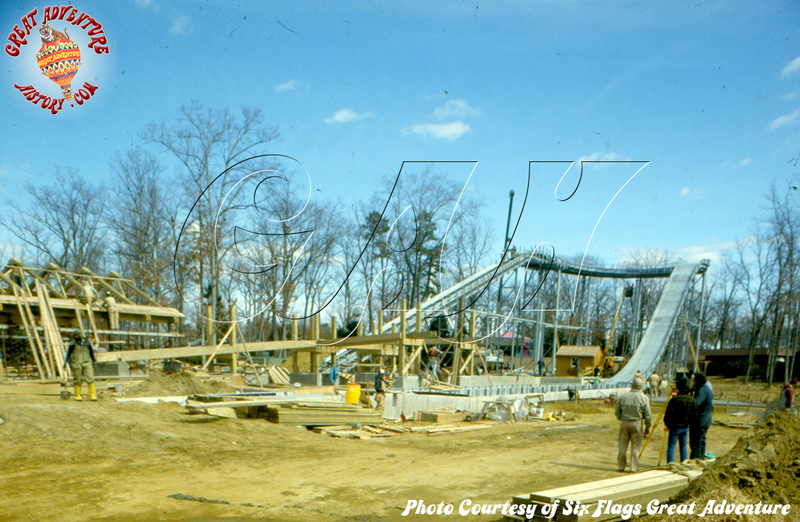 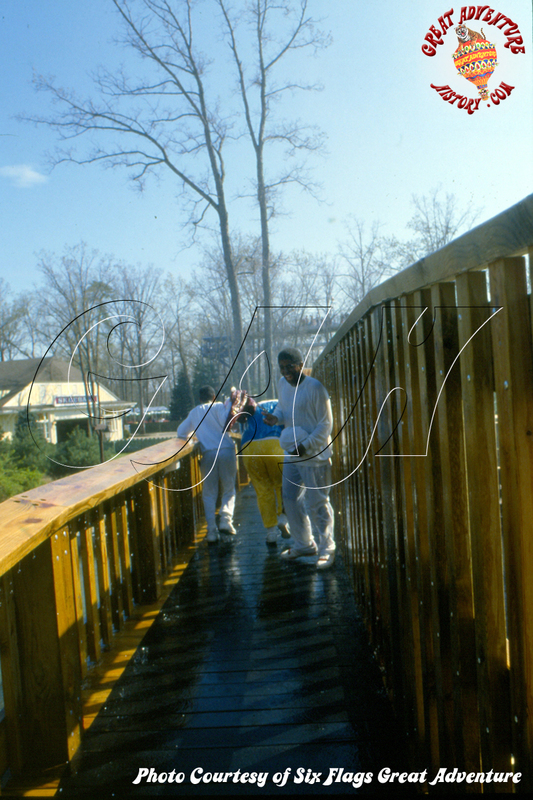 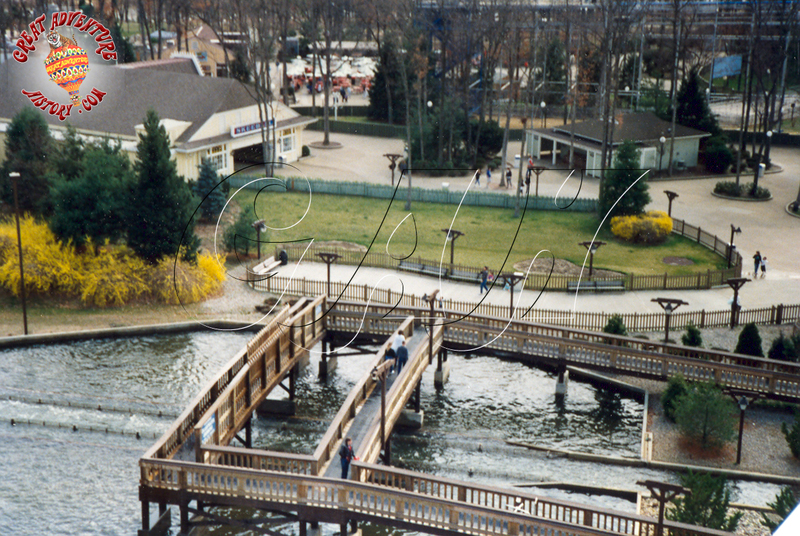 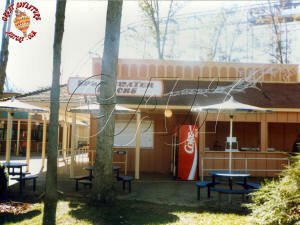 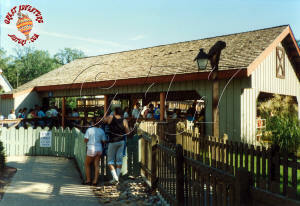 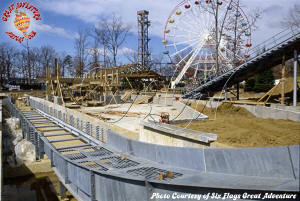 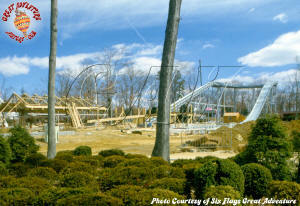 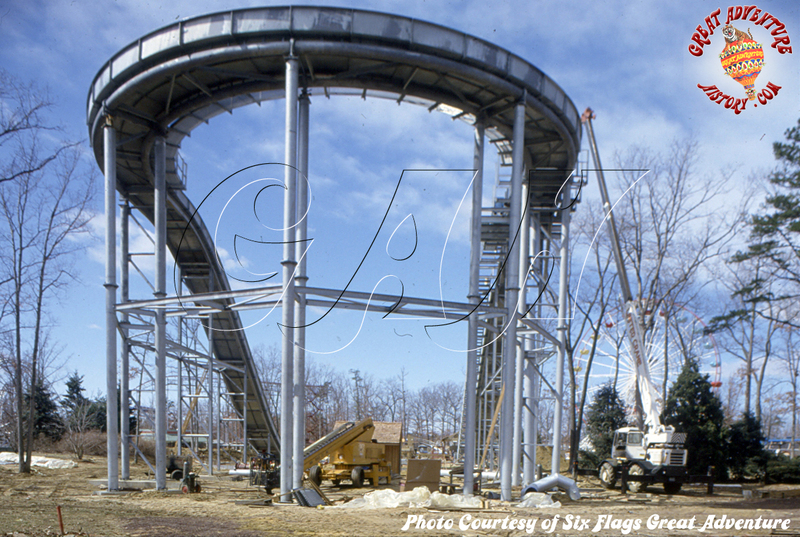 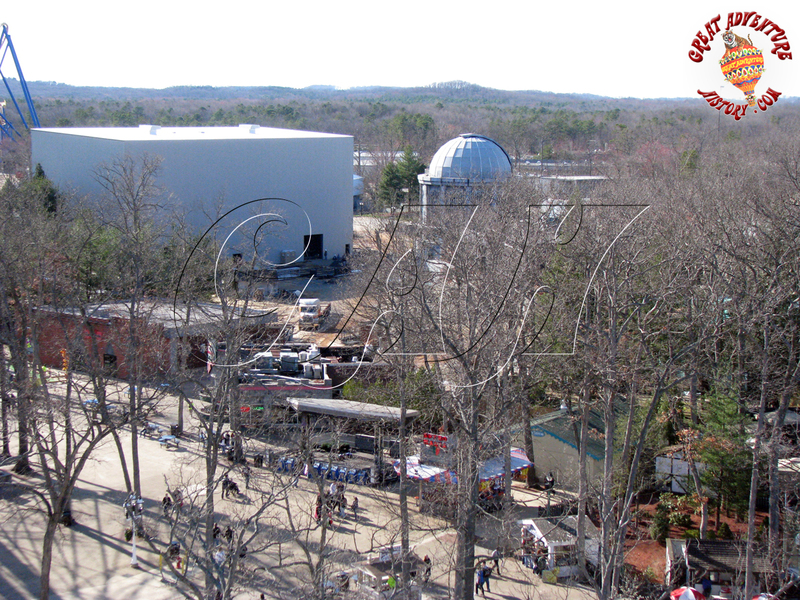 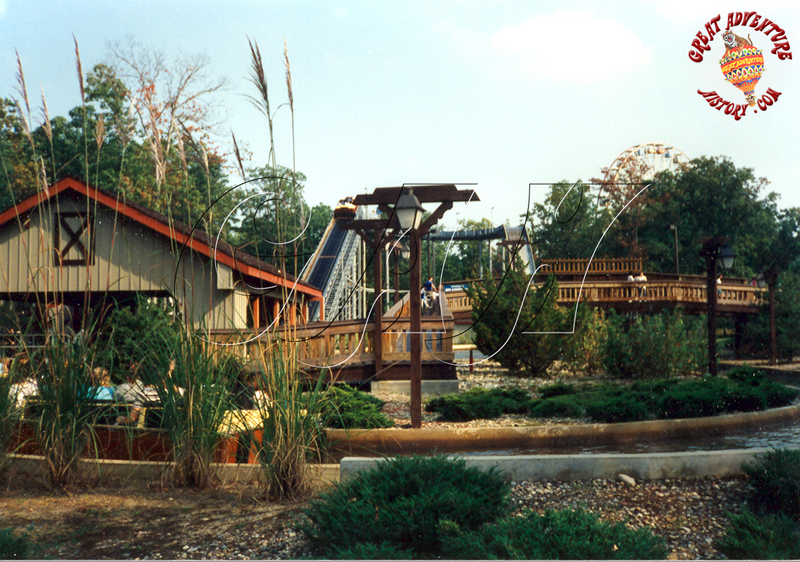 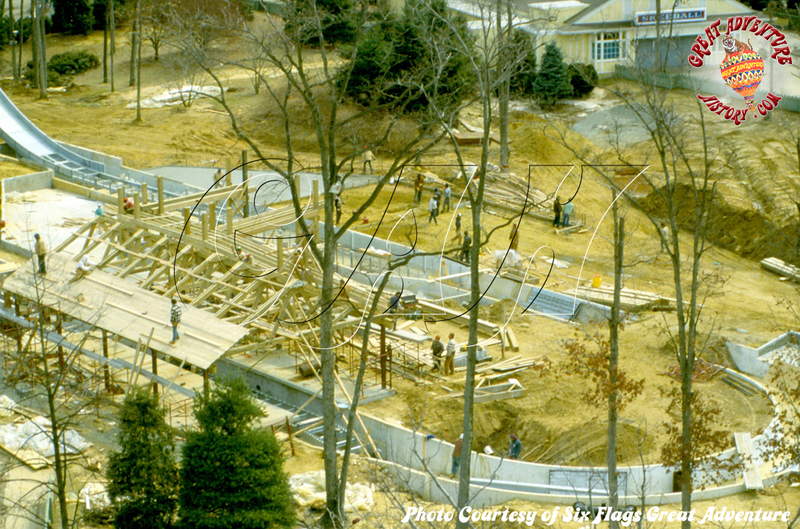 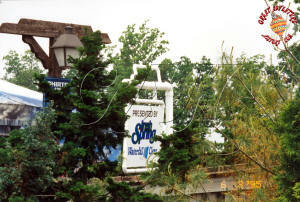 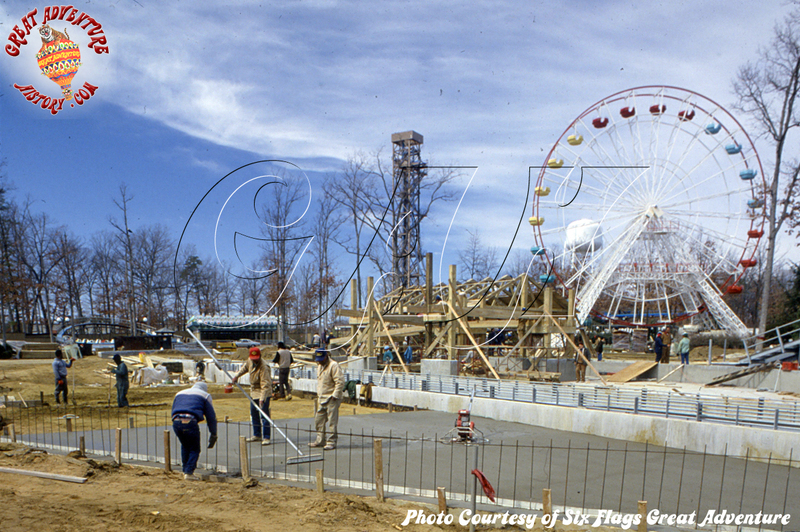 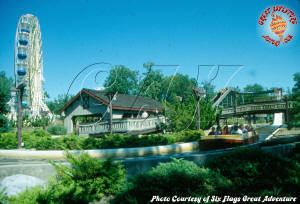 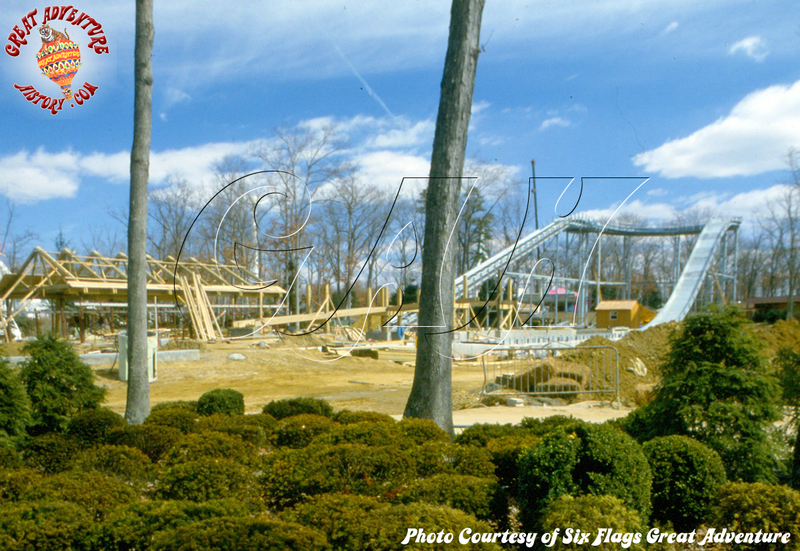 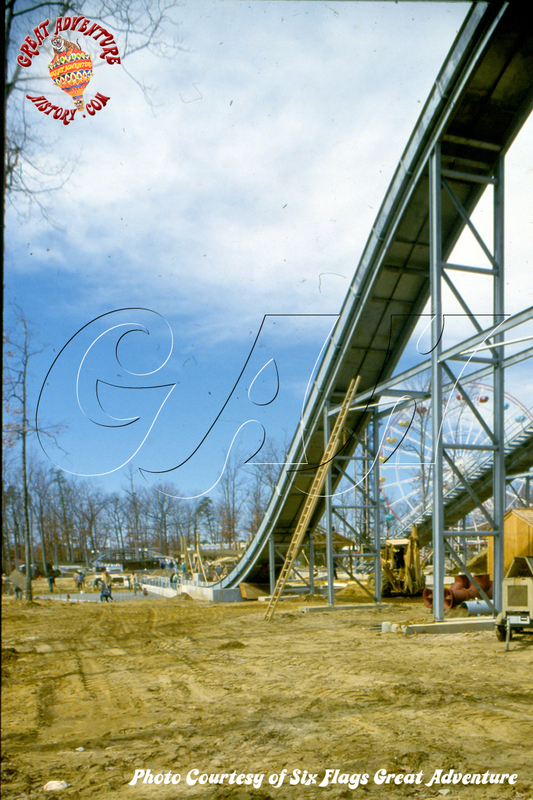 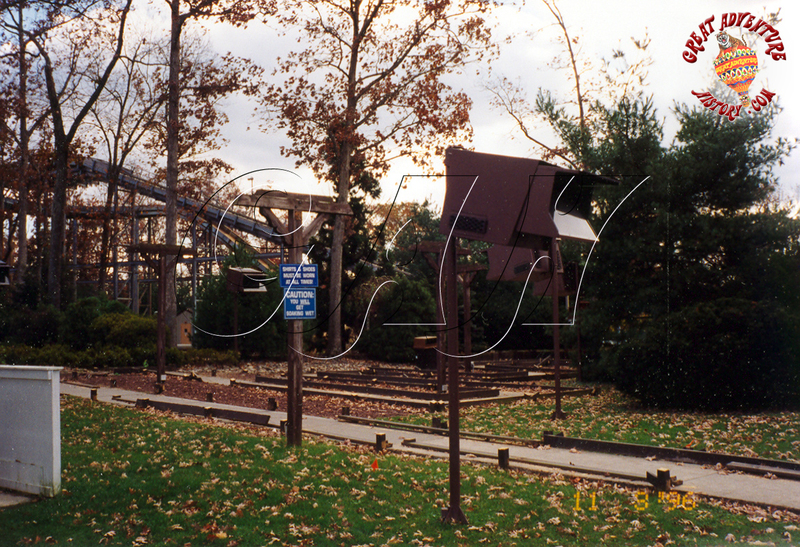 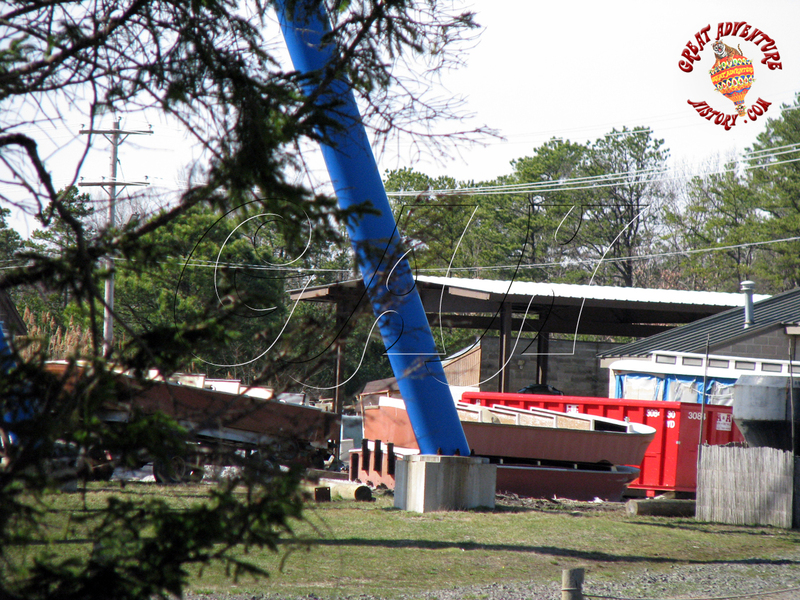 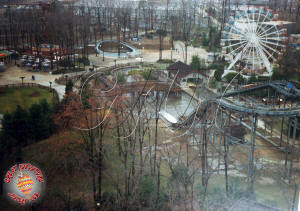 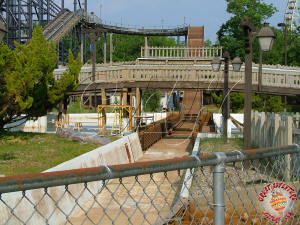 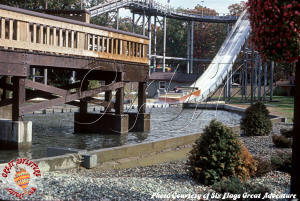 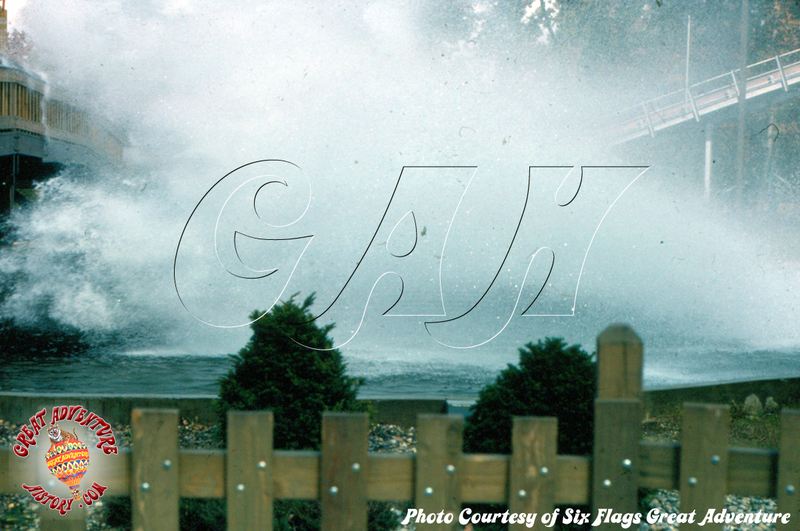 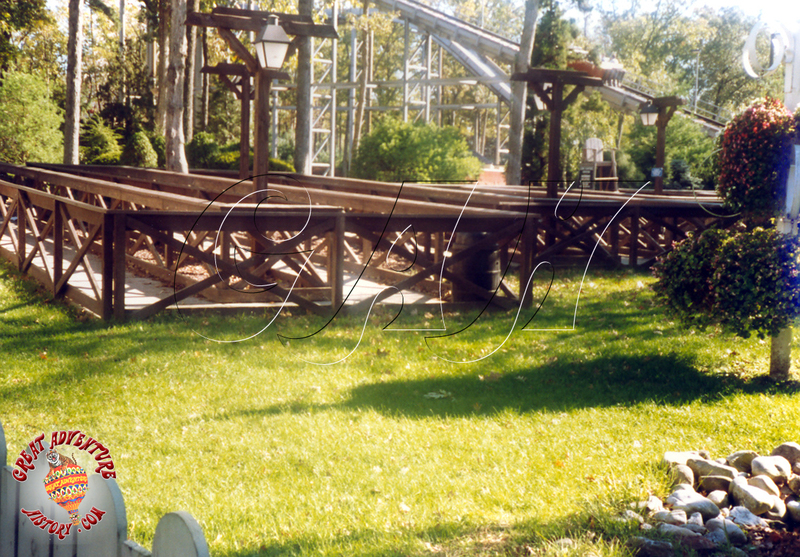 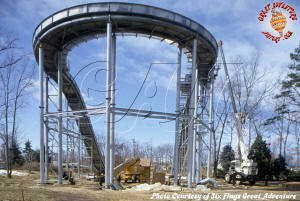 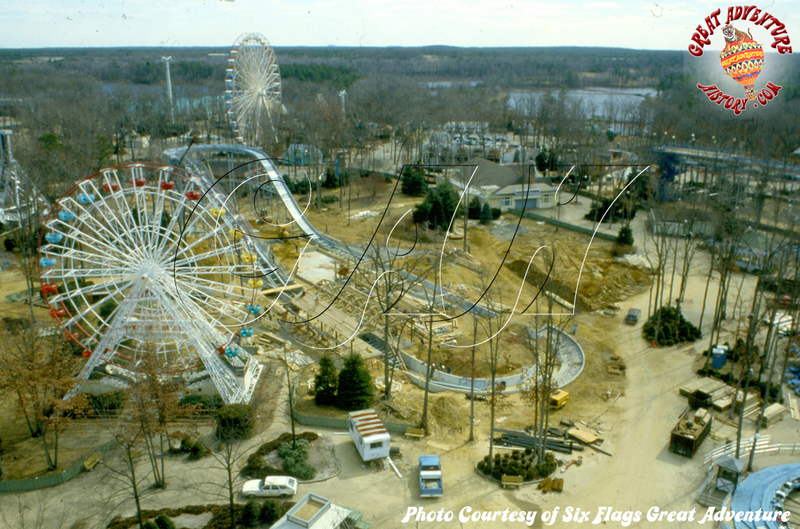 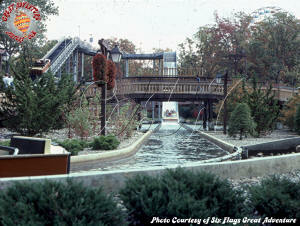 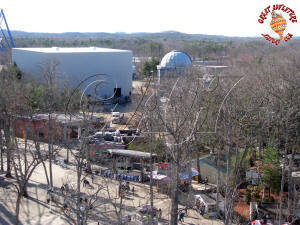 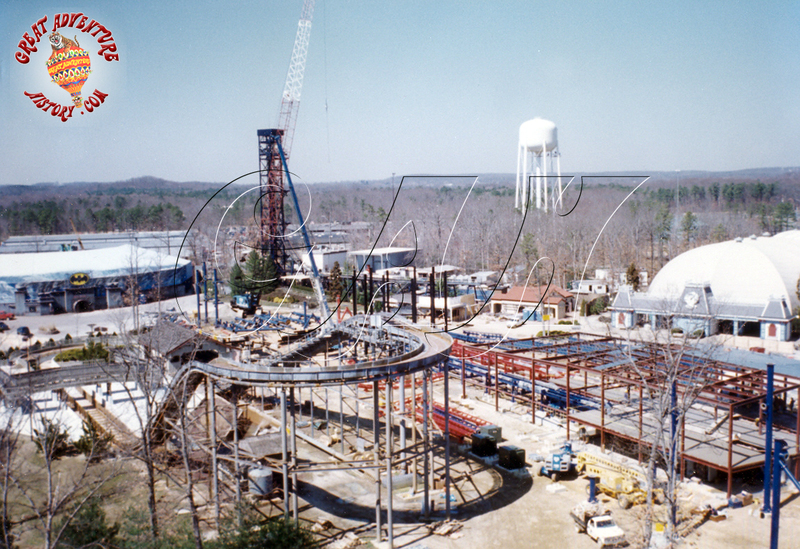 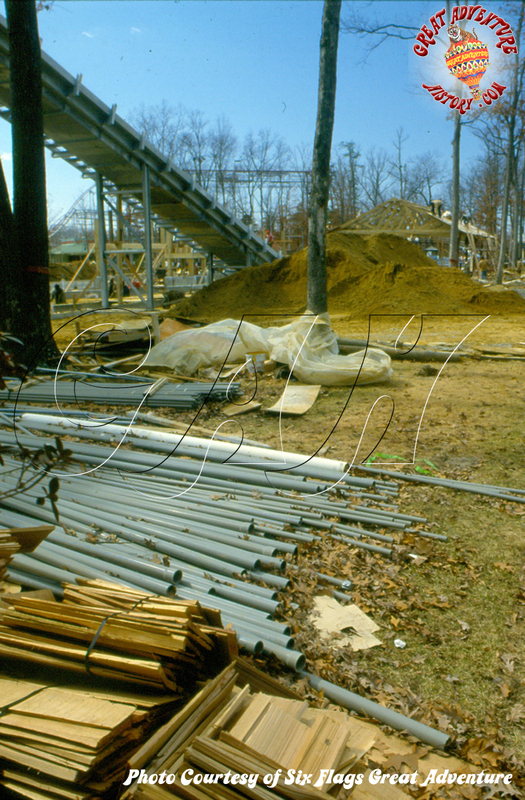 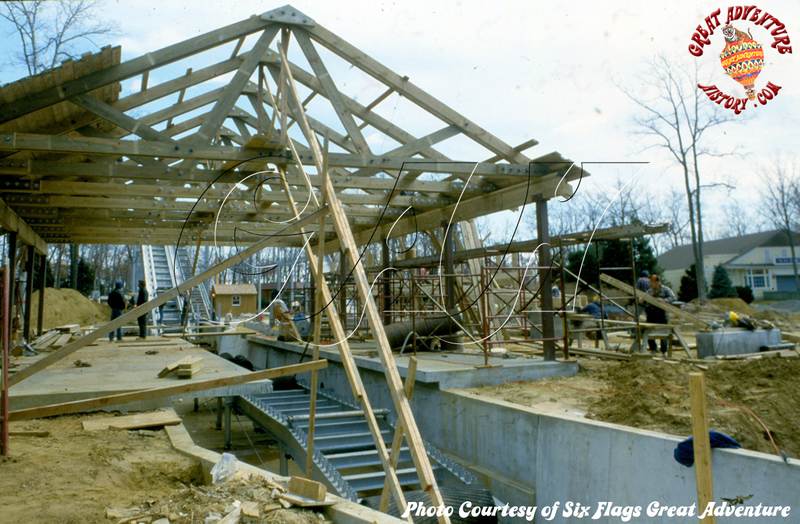 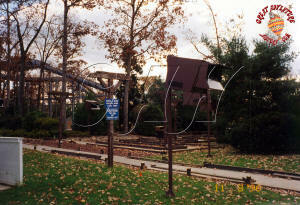 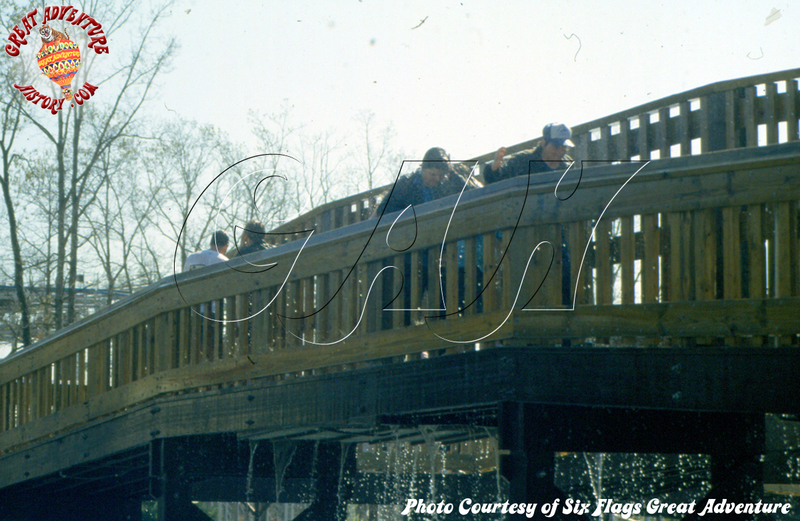 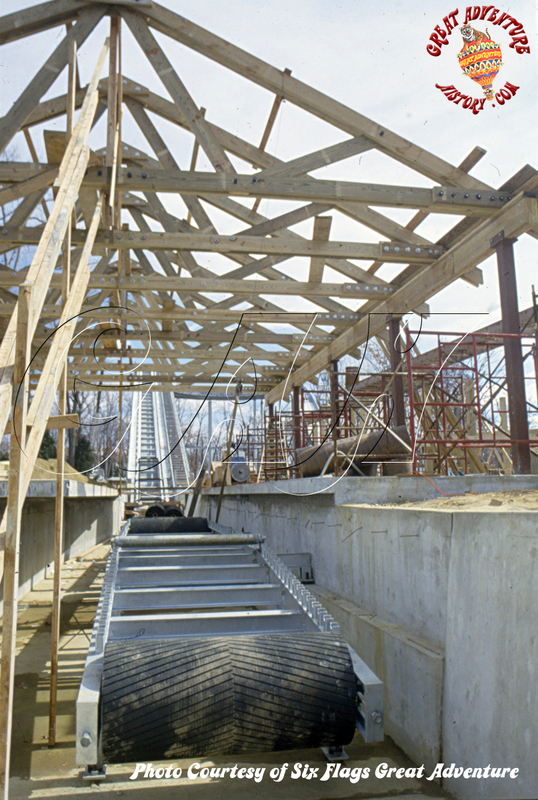 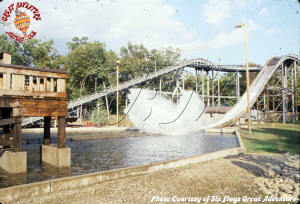 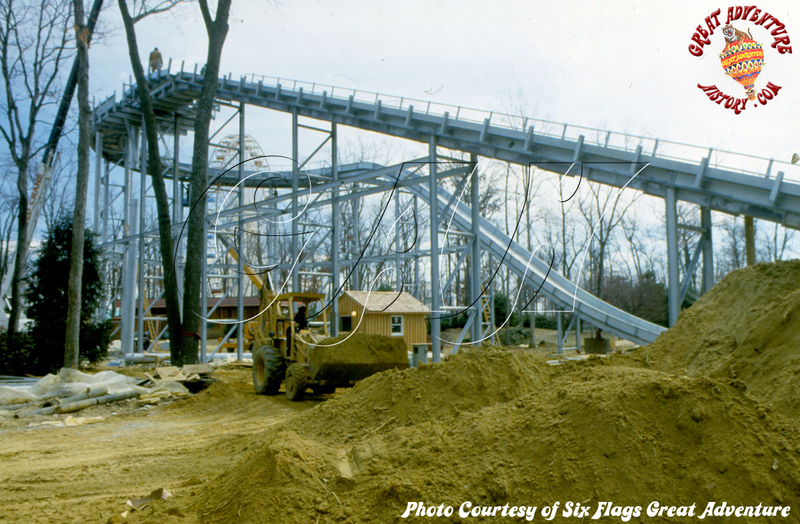 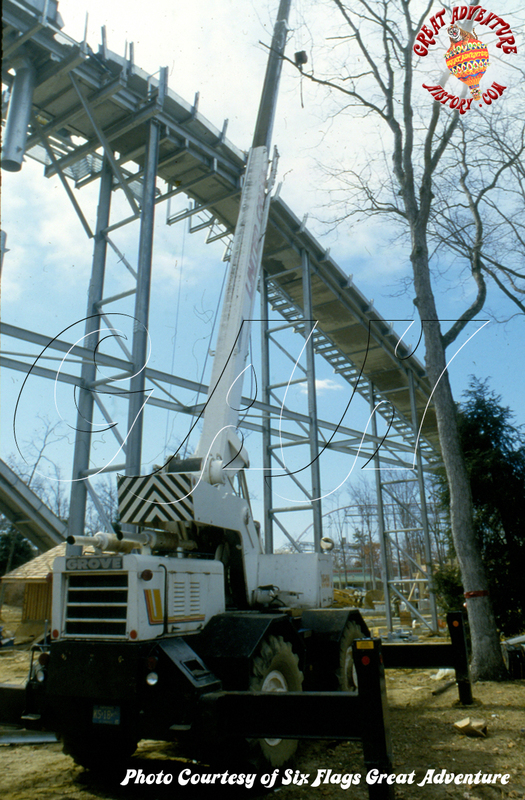 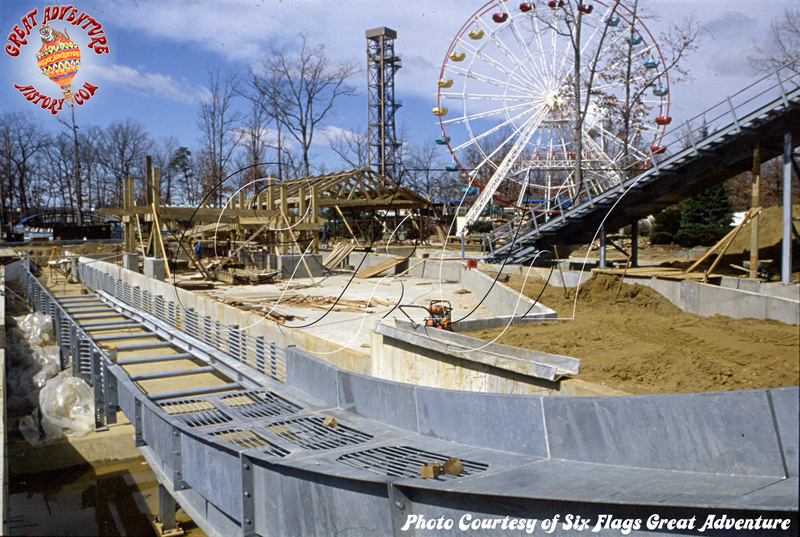 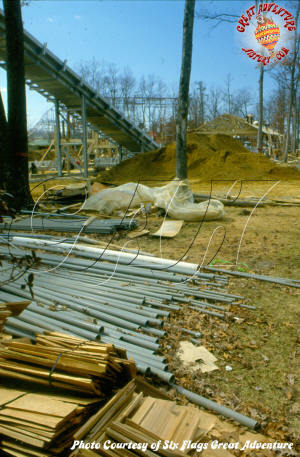 During the 1986-87 off season SplashWater Falls began construction in the former Fun Fair area of the park. 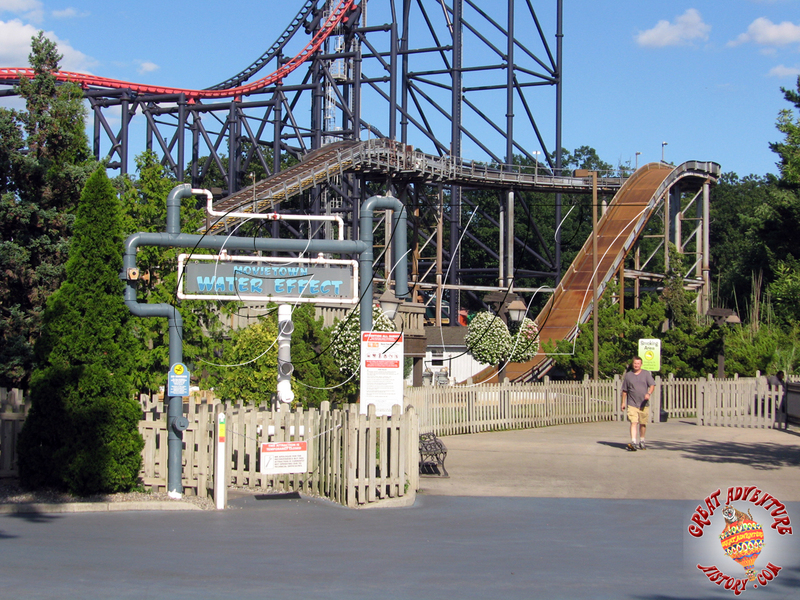 The Matterhorn ride was removed, the Schwabinchen ride was placed in storage, and the Scrambler ride was relocated to a nearby locale to make way for the new water ride. 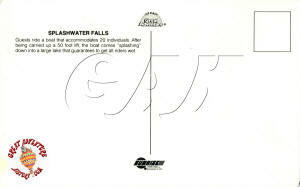 The structure of SplashWater Falls was relatively simple, with a steel lift and aerial turnaround and drop. 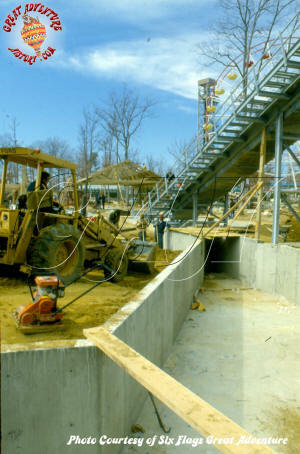 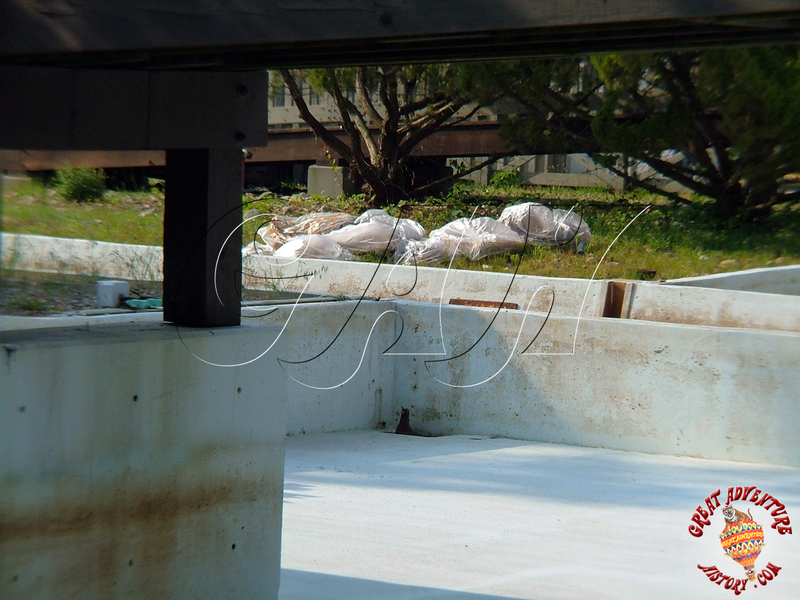 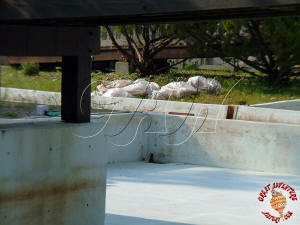 The ground level trough and retention pond were all poured concrete. 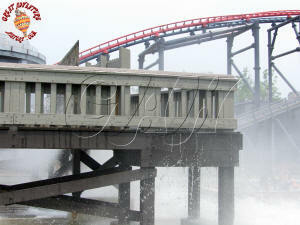 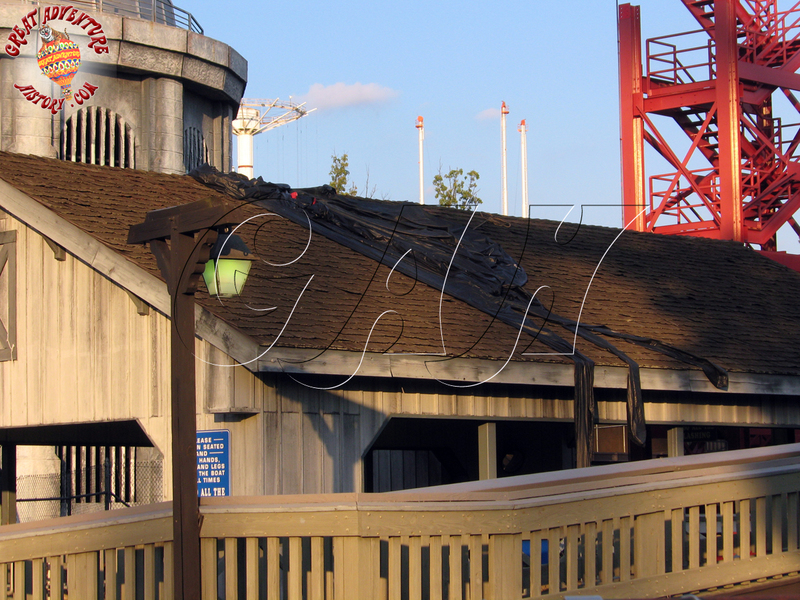 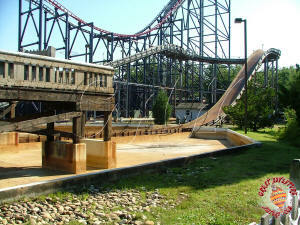 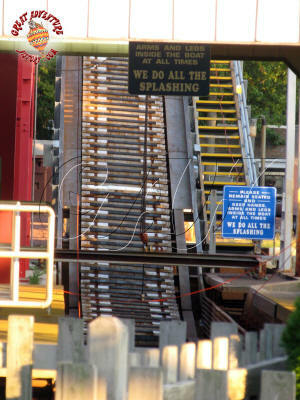 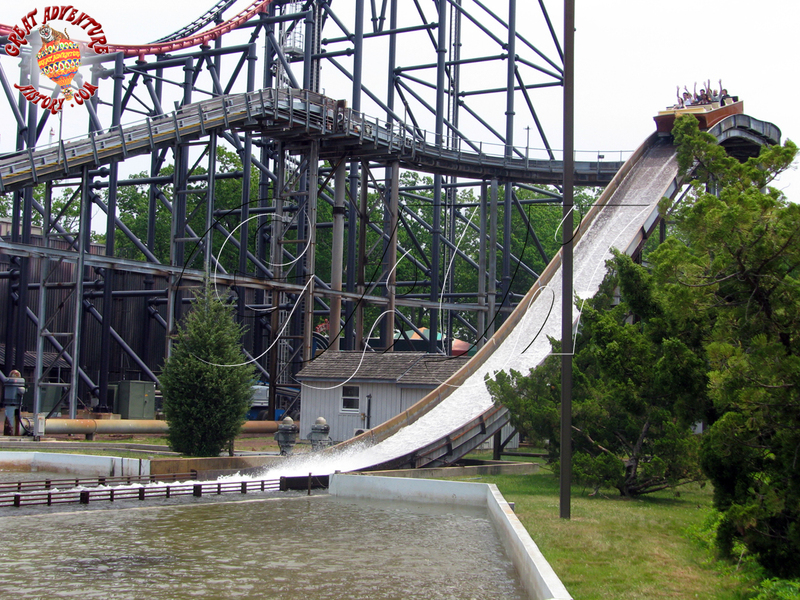 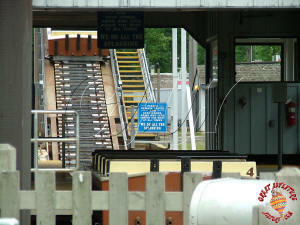 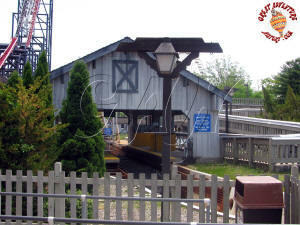 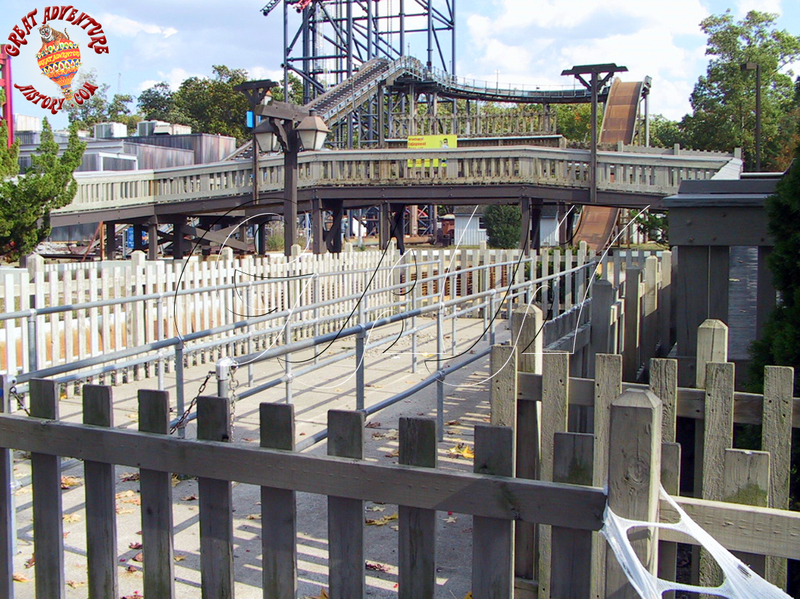 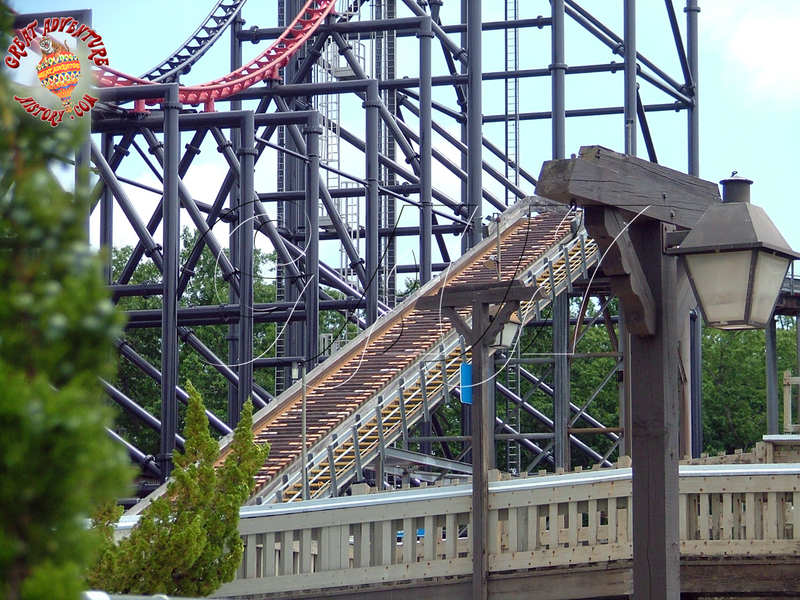 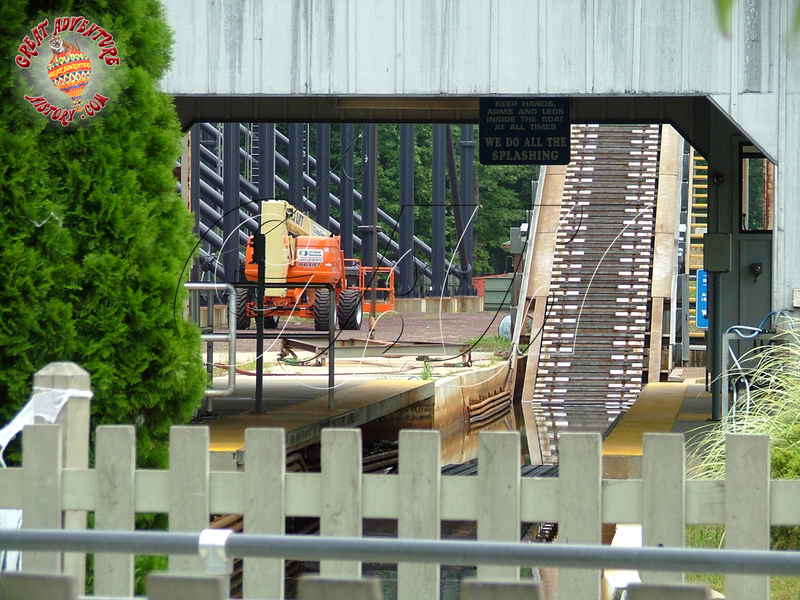 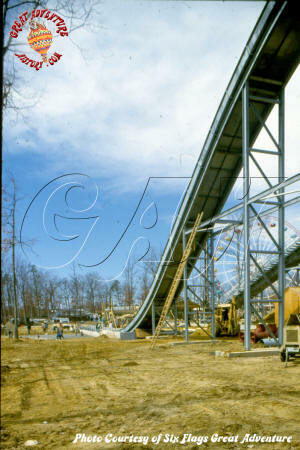 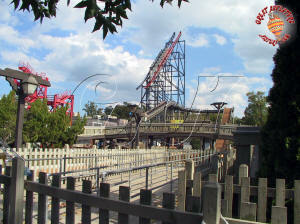 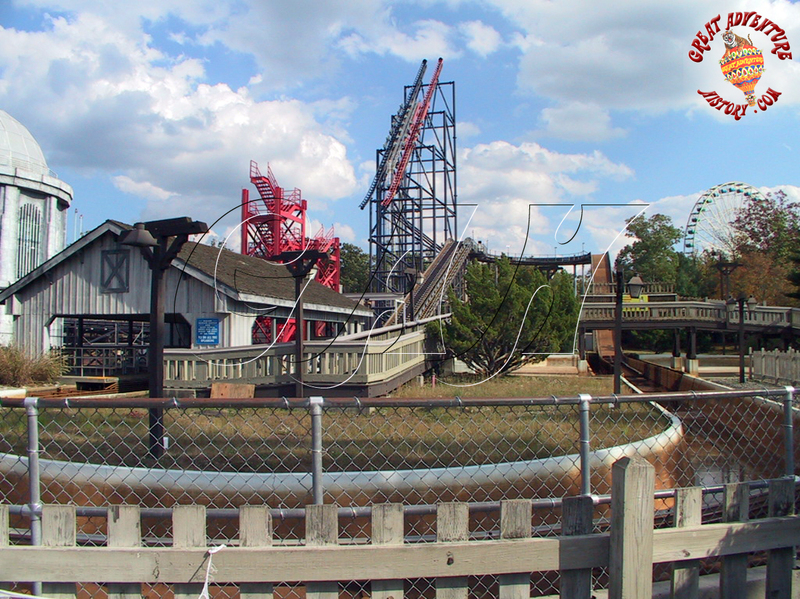 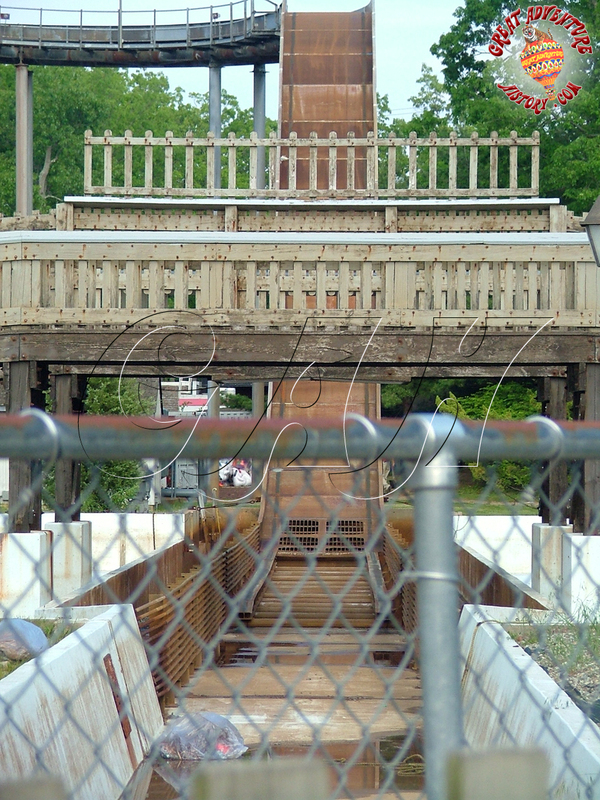 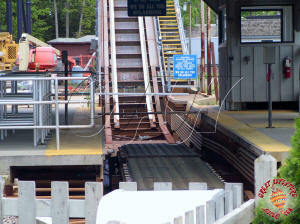 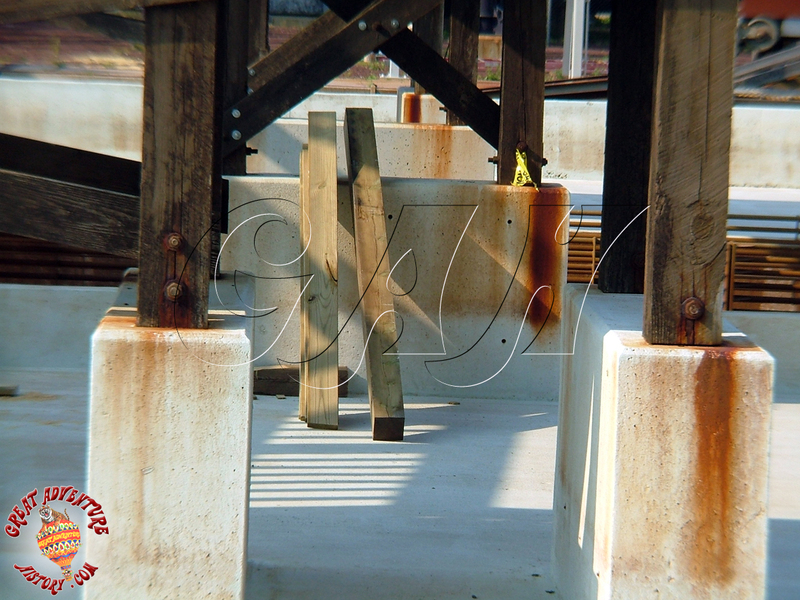 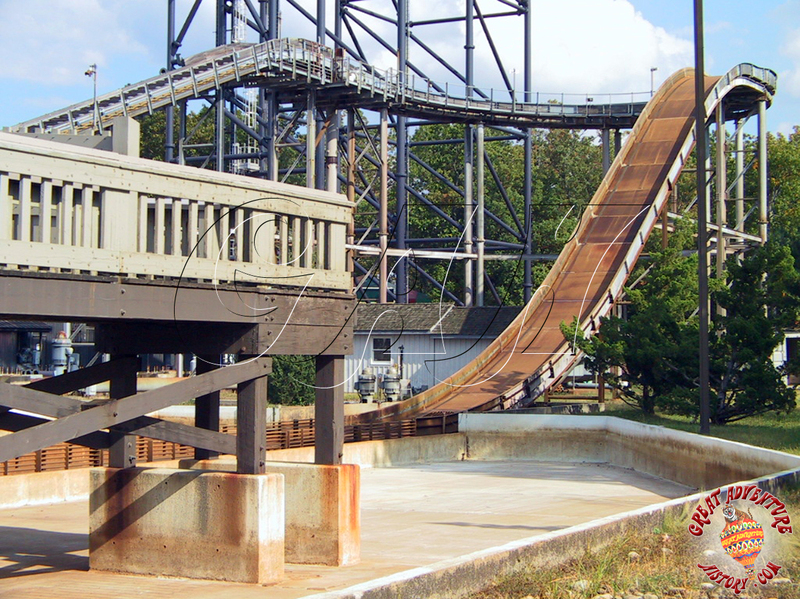 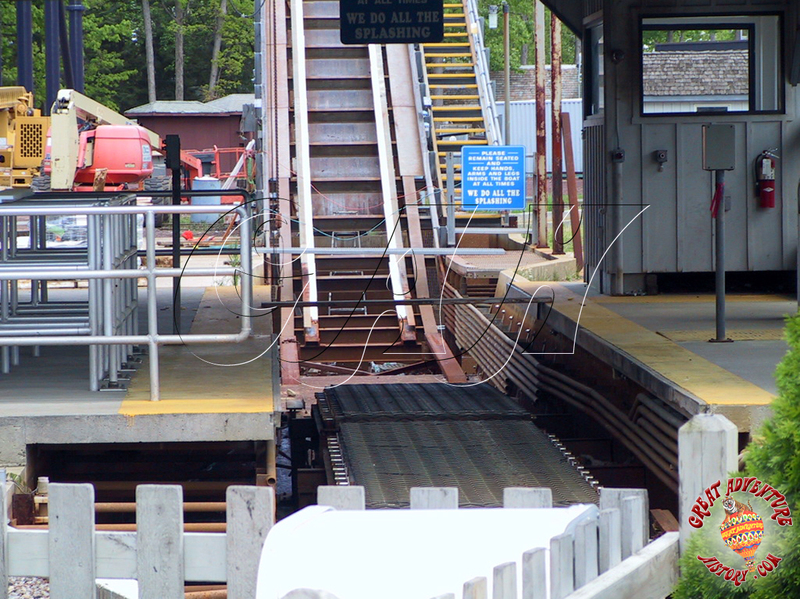 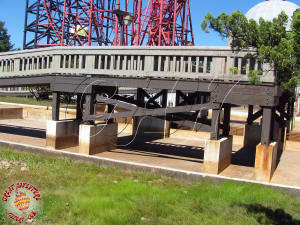 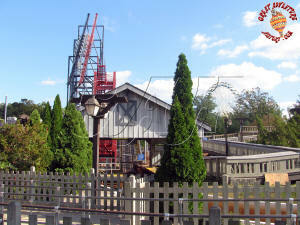 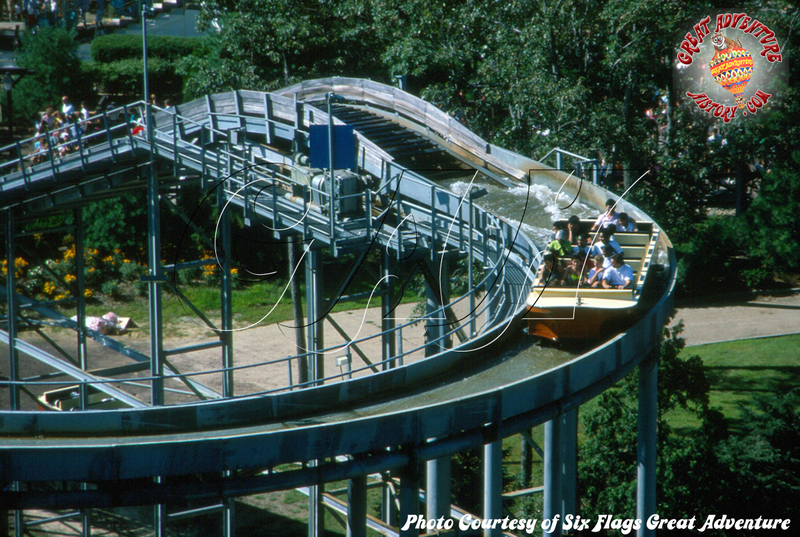 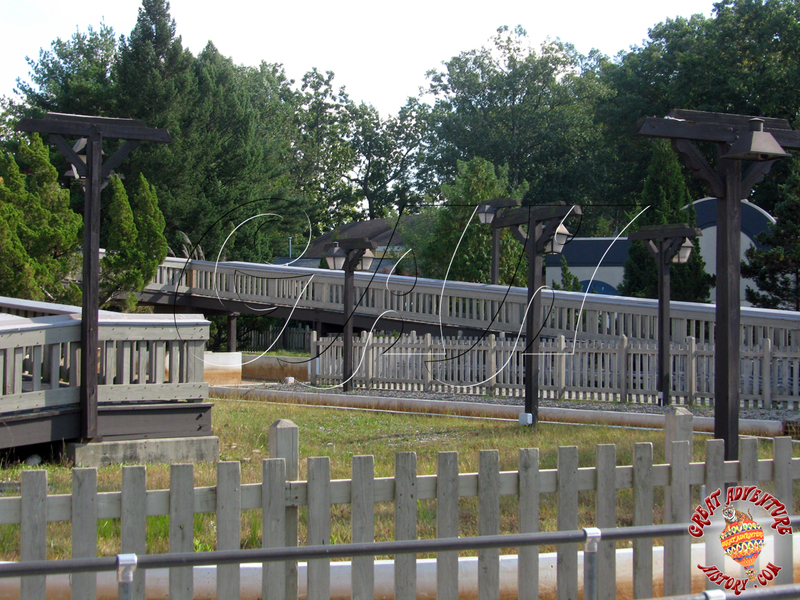 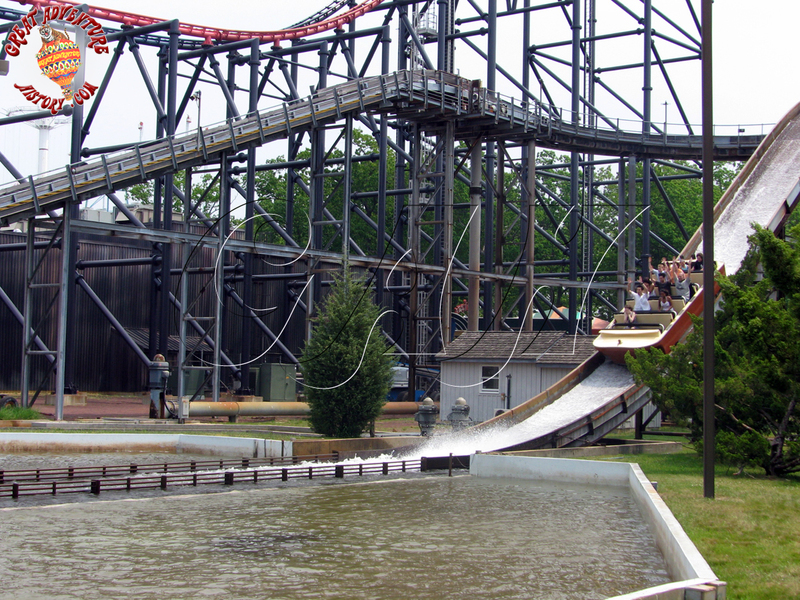 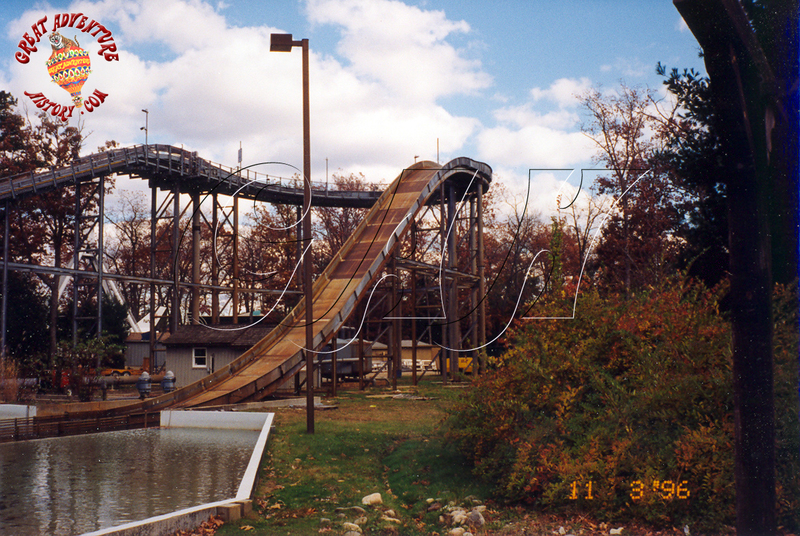 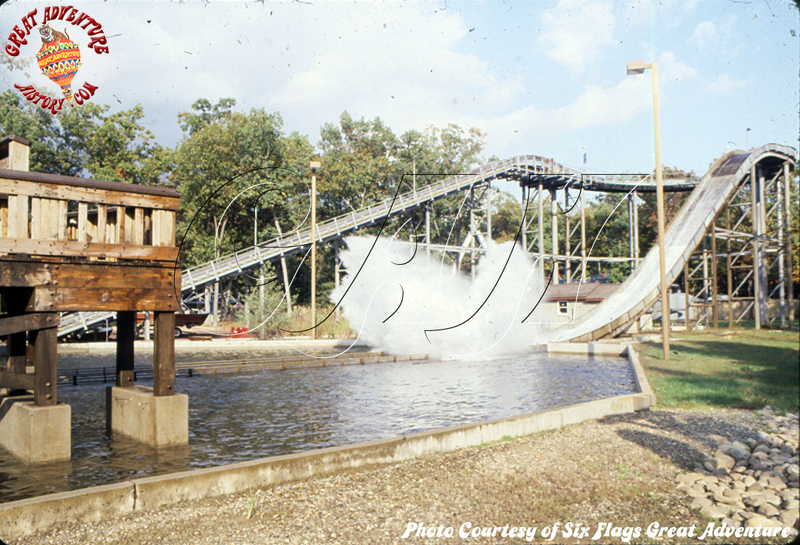 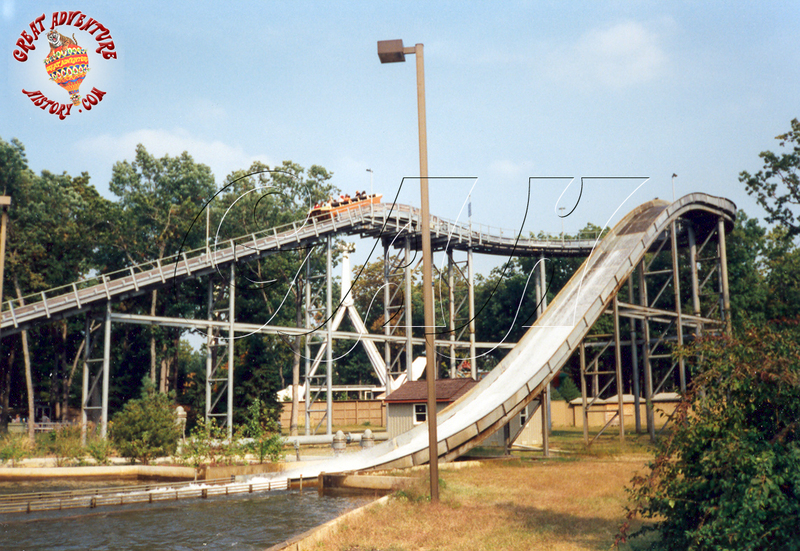 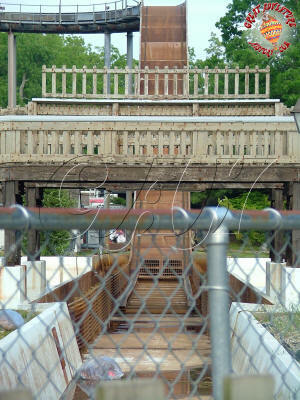 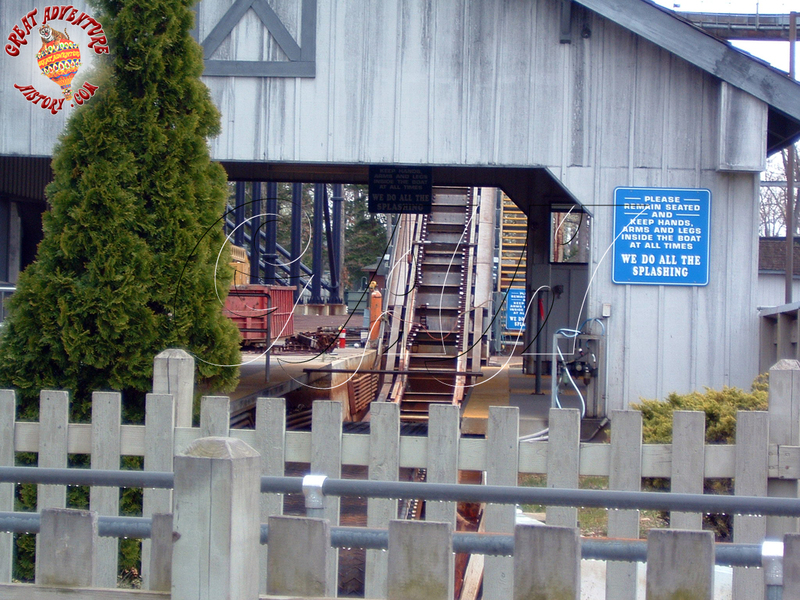 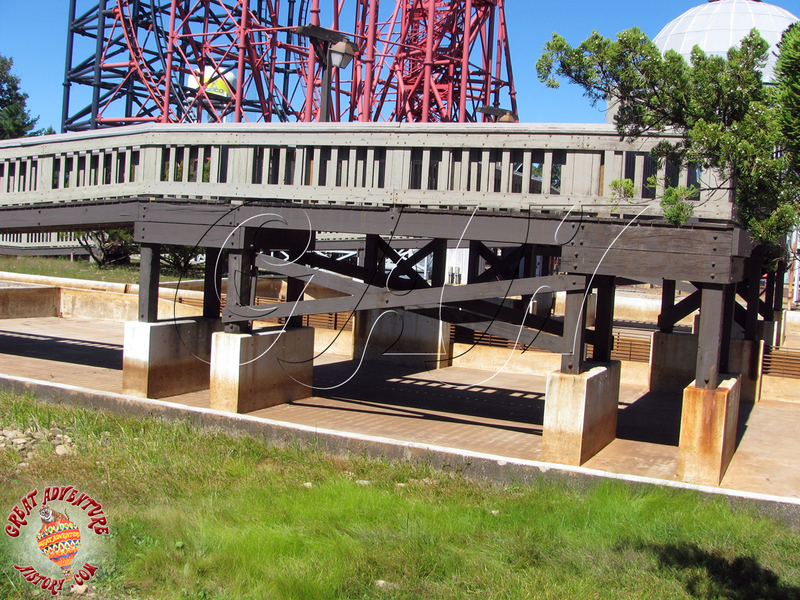 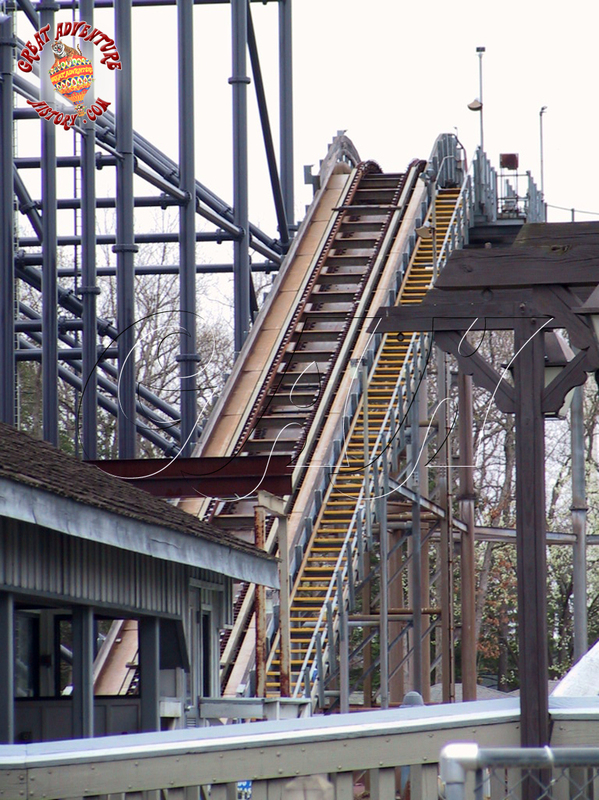 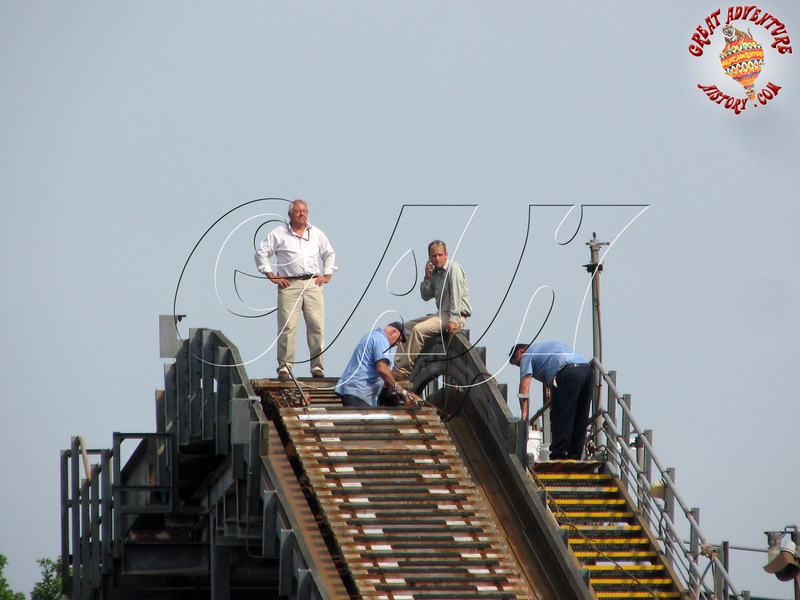 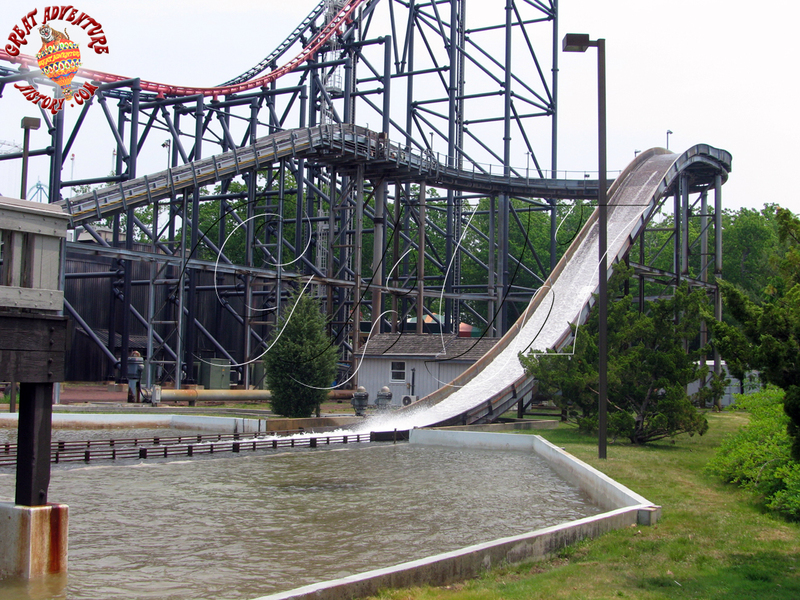 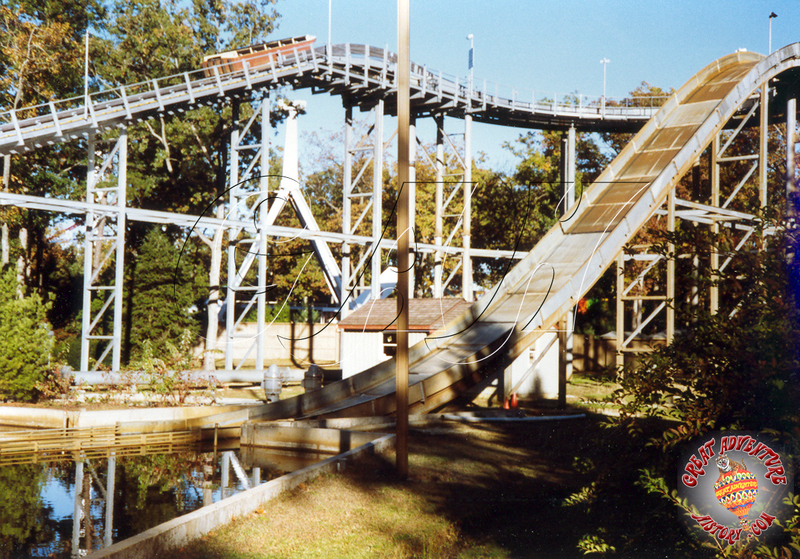 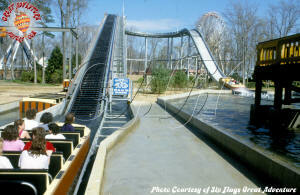 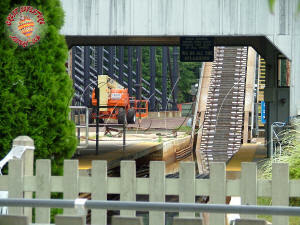 A simple station building was erected at the base of the lift hill, and a long exit bridge was constructed to cross over the trough at the point of the splash down at the base of the 45 foot drop. 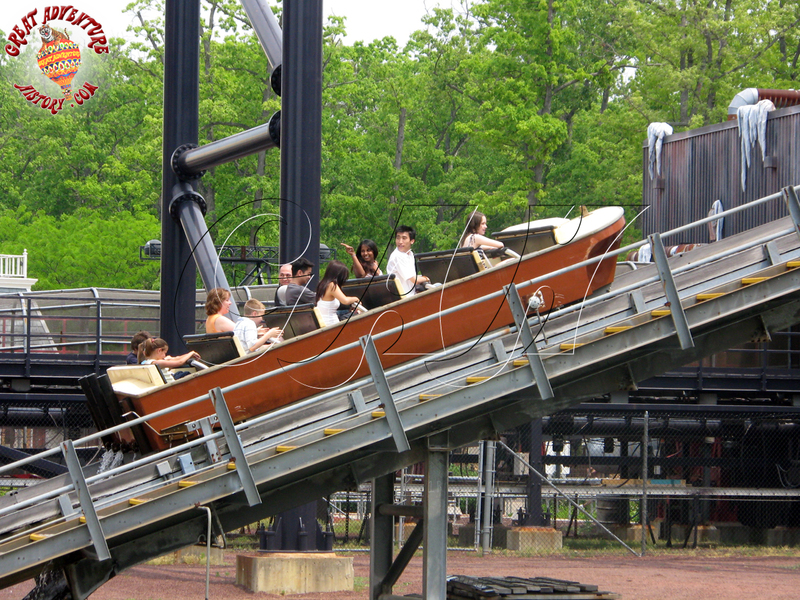 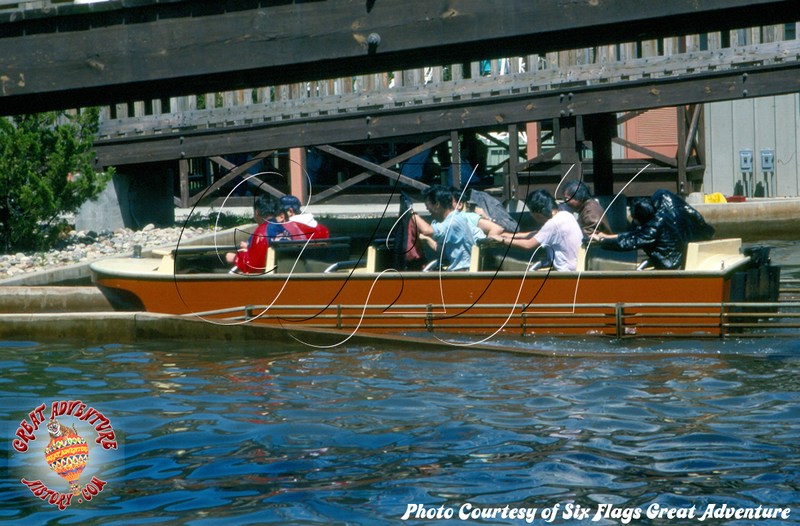 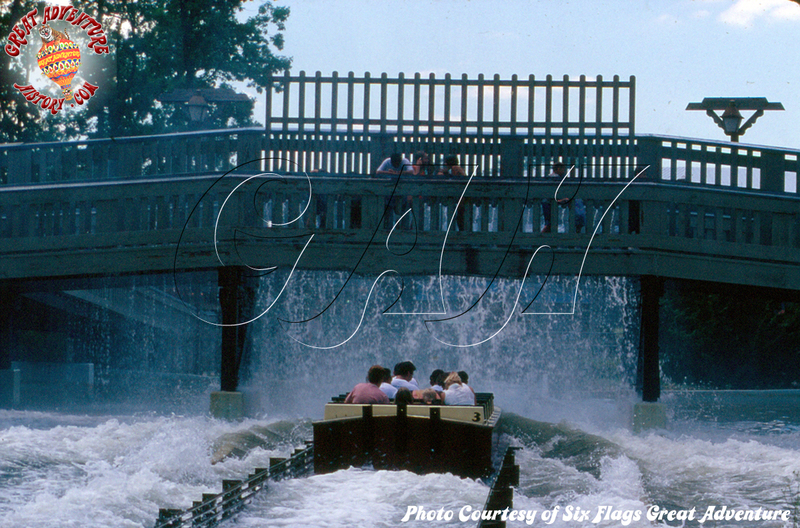 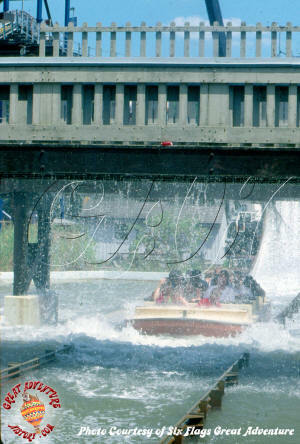 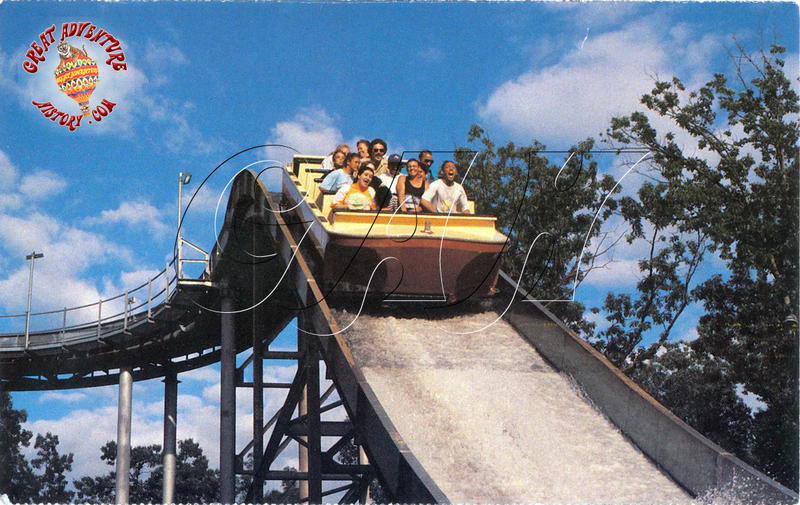 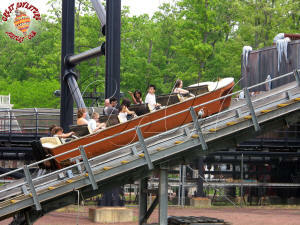 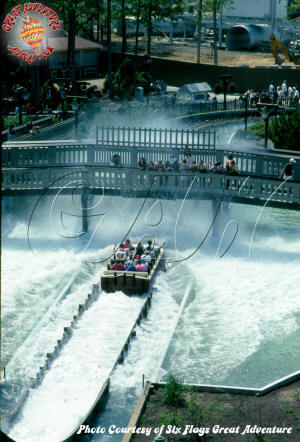 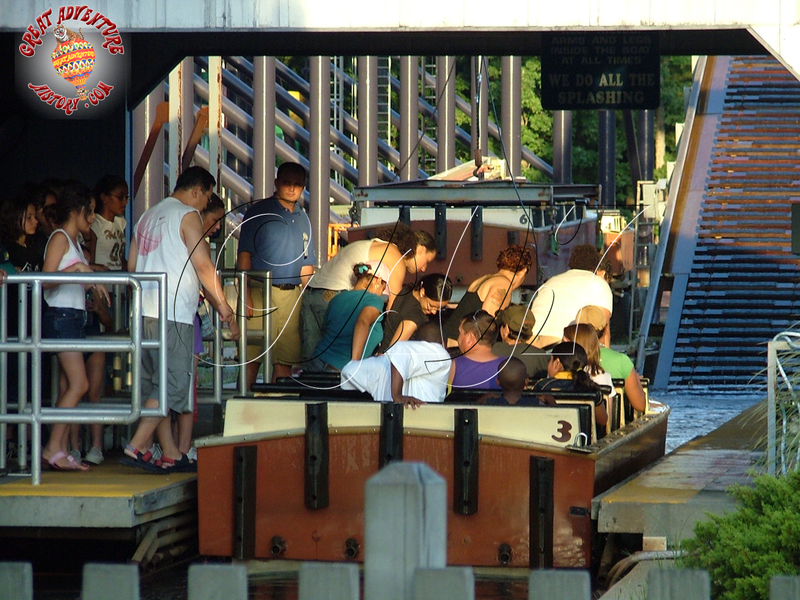 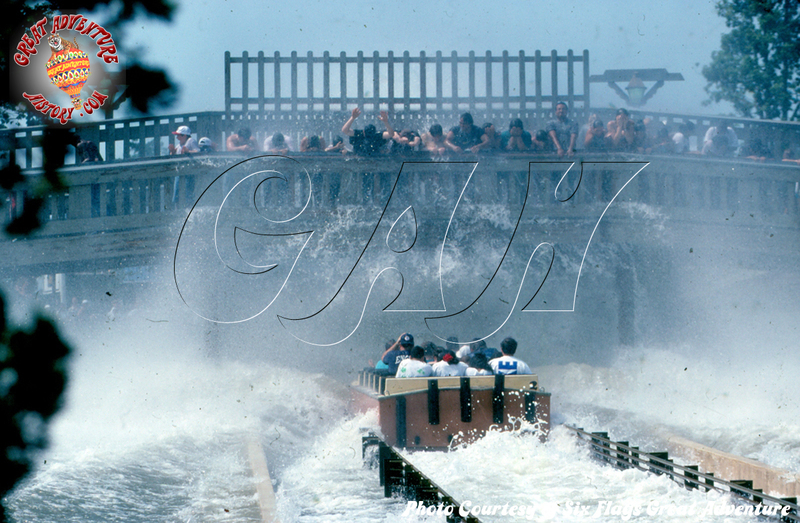 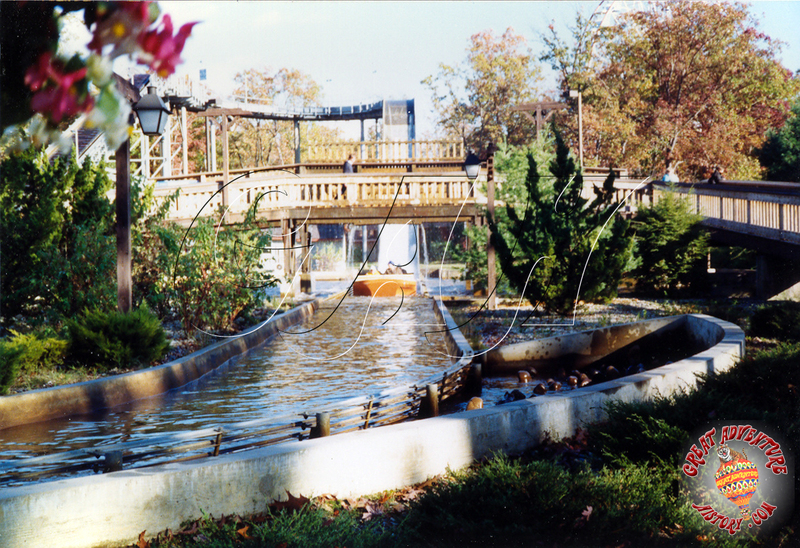 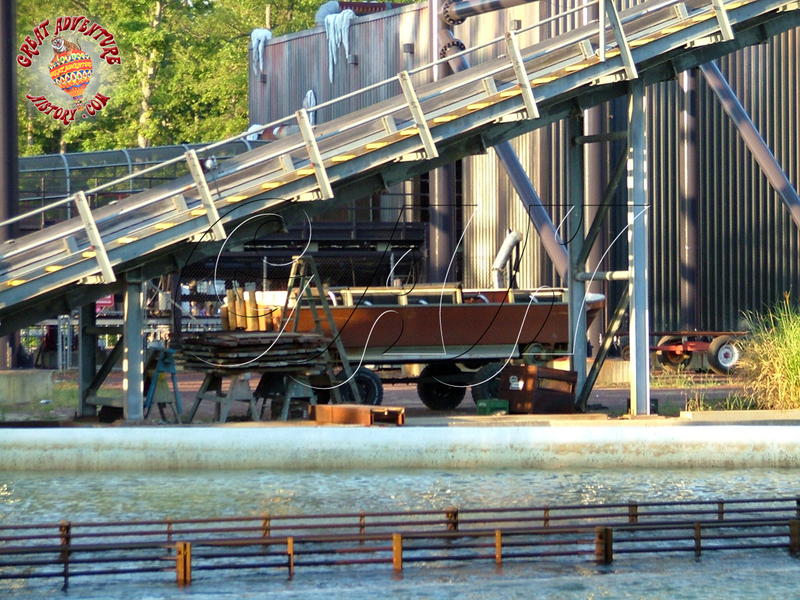 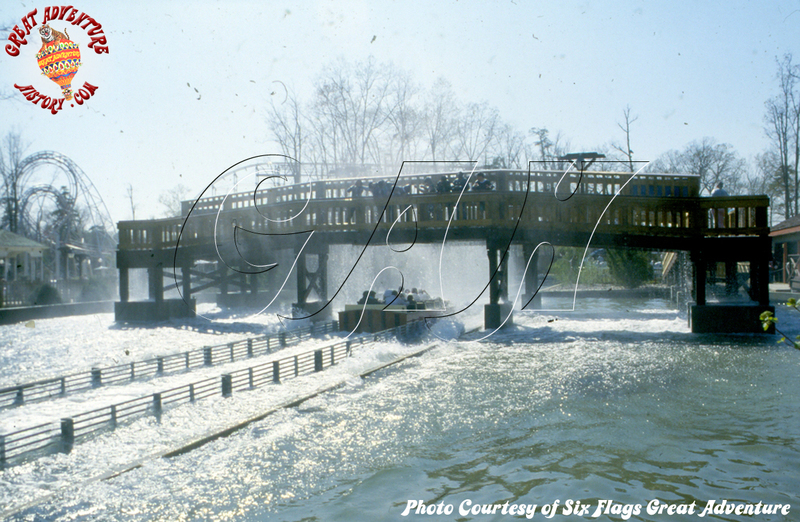 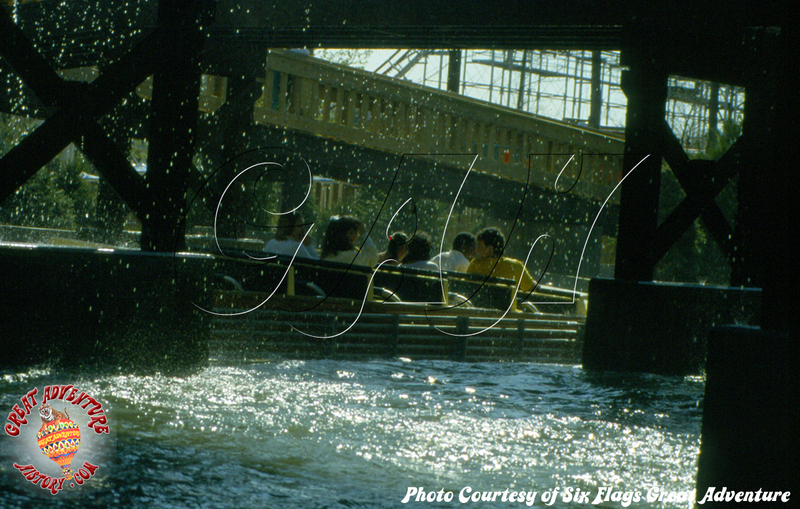 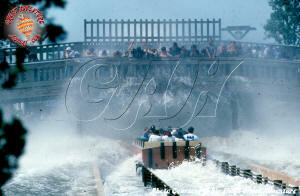 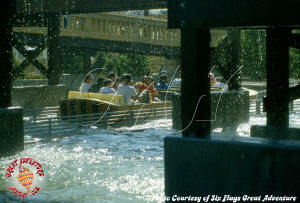 The O.D.Hopkins boats for SplashWater Falls were designed with scooped hulls at the front to create a huge splash which was guaranteed to soak the riders as well as people crossing the bridge exiting the ride. Splash boat style rides no matter the size or the manufacturer share the same type of oversized splash with a wall of water being created as the heavy boats plunge at high speed into a shallow pool at the base of the drop. 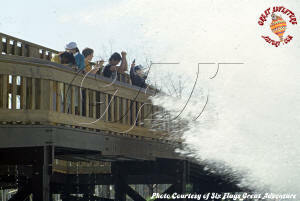 The wave has become a spectator sport as well as an effect for the riders, with many park guests standing and watching in awe as the giant wave is created. 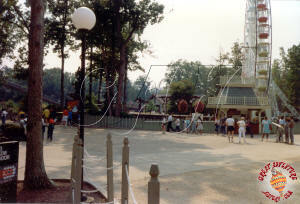 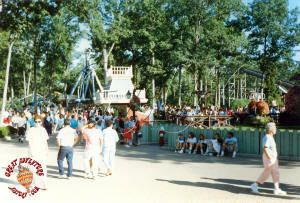 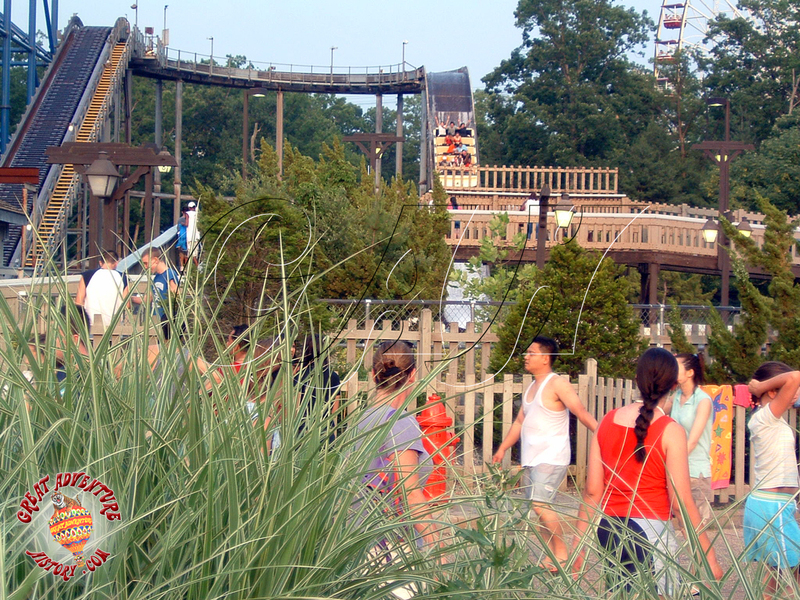 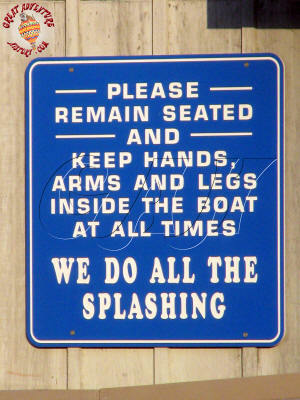 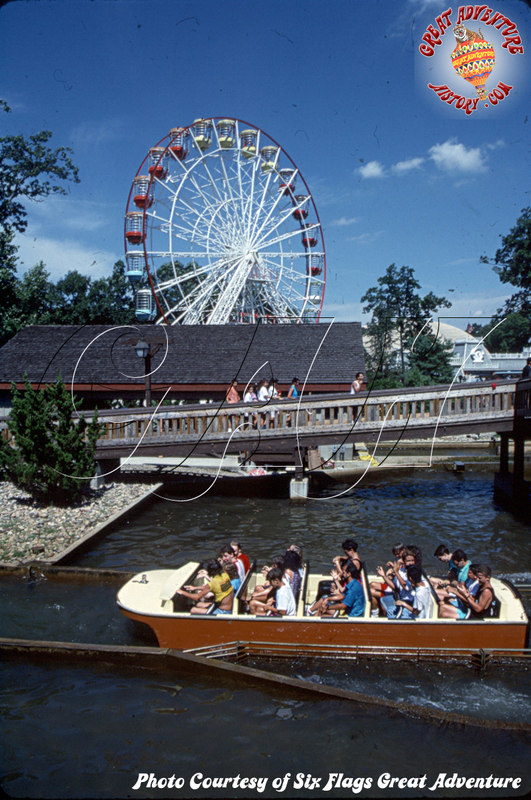 Many parks created special viewing areas for the rides, sometimes even creating areas where guests not riding could stand in the "splash zone" to cool off on hot summer days. 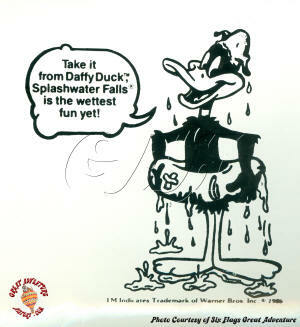 SplashWater Falls was built with a sizable queue to handle the big crowds. Guests were often confused when trying to find the entrance to the ride since it was located around the corner from the ride's viewing area, past the entrance to the Little Wheel. 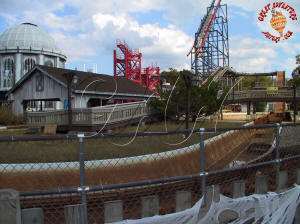 The queue was a long, open switchback with areas between the line sections for Security to have access as they monitored the queue for line cutters. 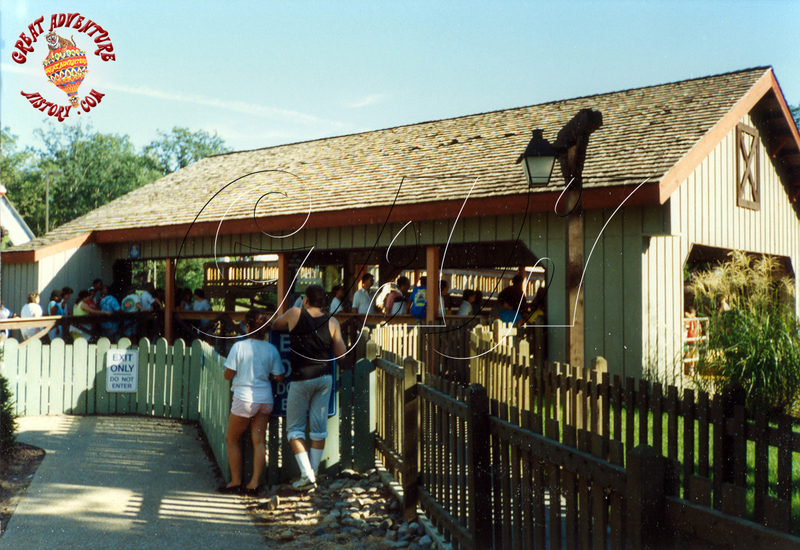 On hot days the queue would often be filled to capacity with guests looking to escape the heat, and the high capacity of SplashWater Falls and its guarantee of soaking riders meant that lines moved quickly and guests came off satisfied. 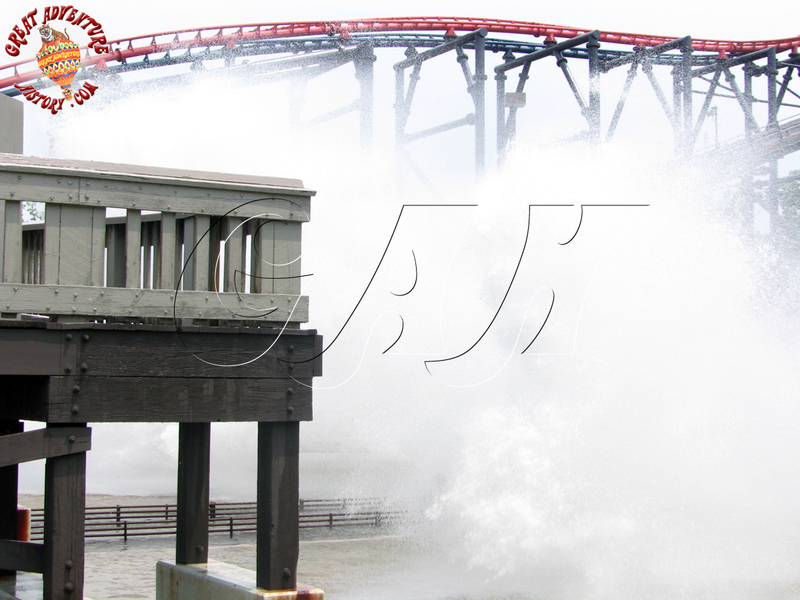 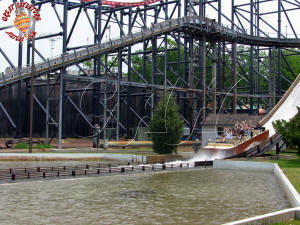 The exit of the ride offered two options with a near bridge and a far bridge, so exiting riders could choose to get completely soaked again with the full force of the waves, or get just a little wetter without getting the brunt of the blast. 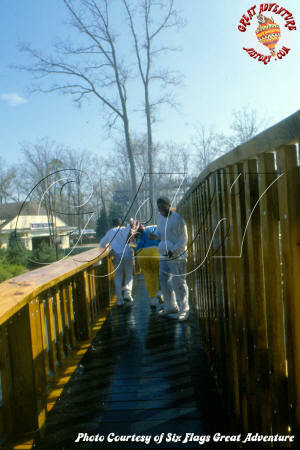 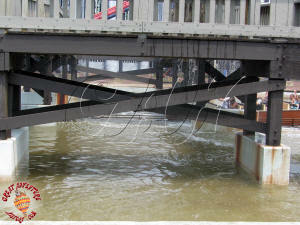 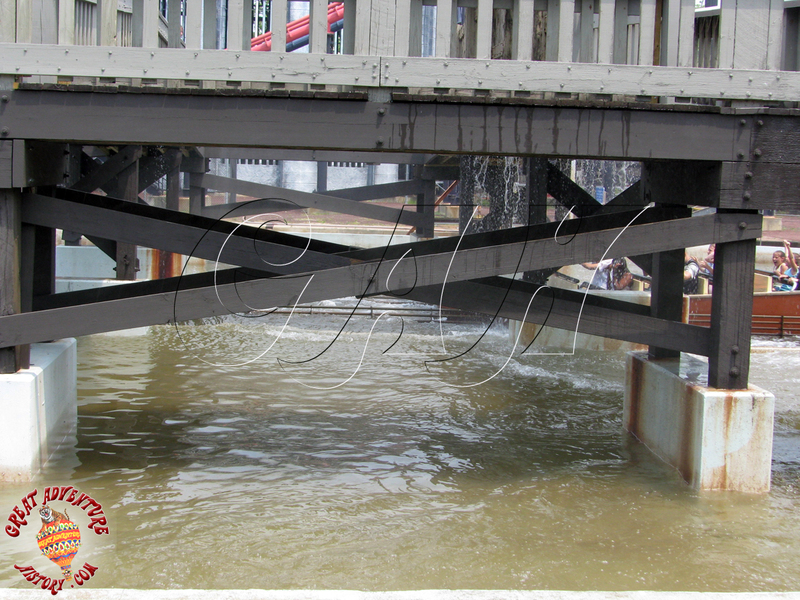 Guests would often spend several minutes on the bridge, getting soaked repeatedly by wave after wave. Often park guests would try to use the exit of the ride to get to the bridge just to get wet without having to wait in line to ride. 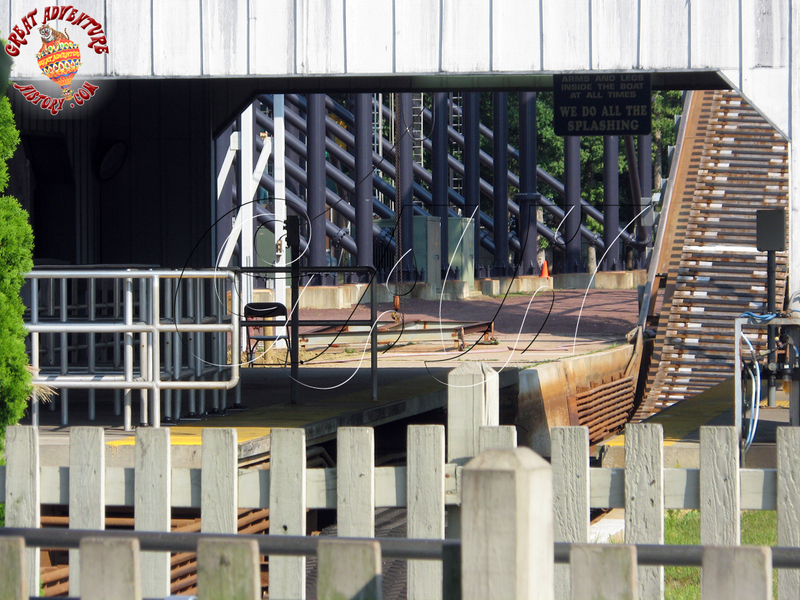 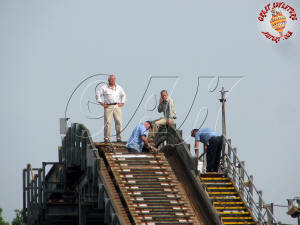 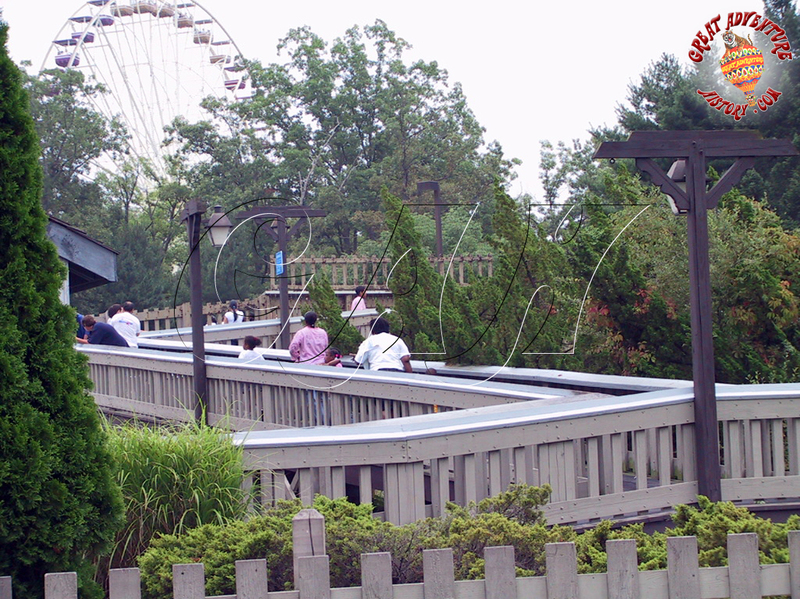 The exit was equipped with a one way turnstile and quite often a ride attendant or a Security guard was also stationed at the exit to keep guests from entering as well as to keep guests moving off the ride since they would often stand on the bridge blocking the exit. 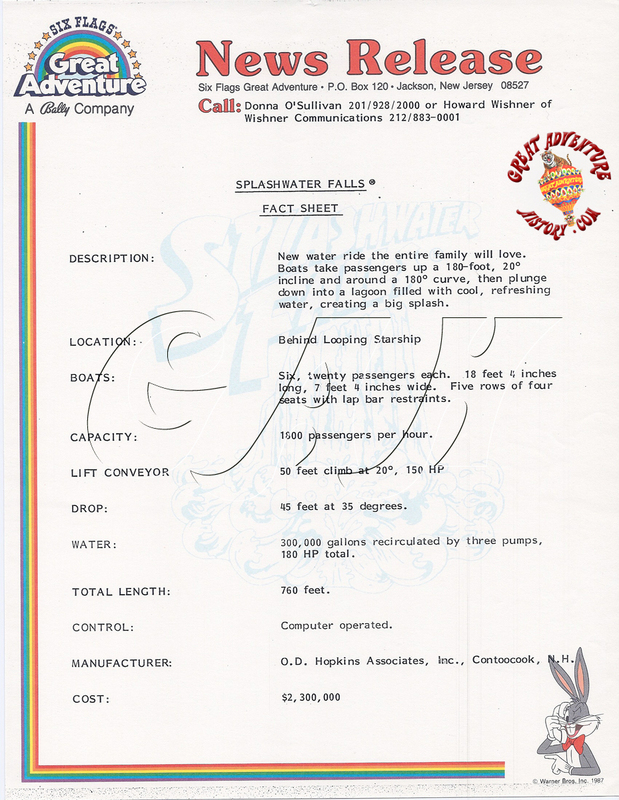 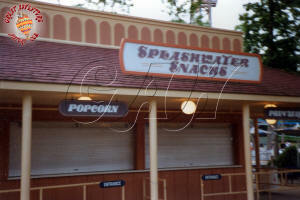 To compliment the new ride in 1987, the neighboring restaurant, formerly known as The Top Dog, was renamed SplashWater Specialty, and in 1989 became SplashWater Snacks. 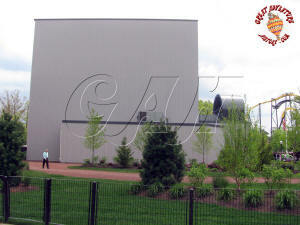 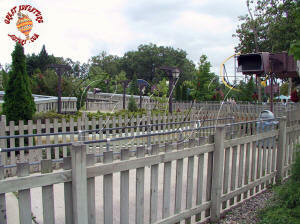 Great Adventure's SplashWater Falls offered a viewing area between the ride drop and the adjoining Skeeball Barn building. 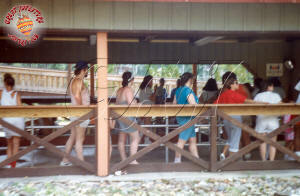 The viewing area was quite popular as non riders watched their friends get soaked. 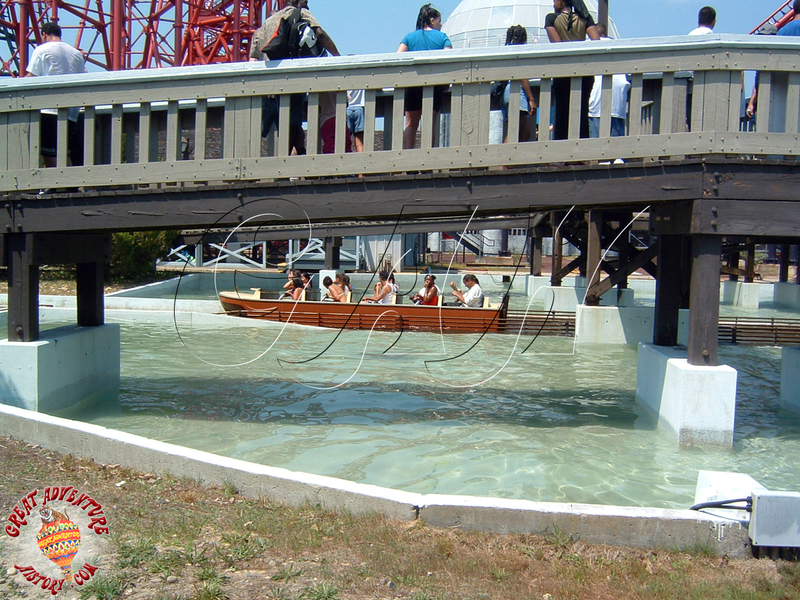 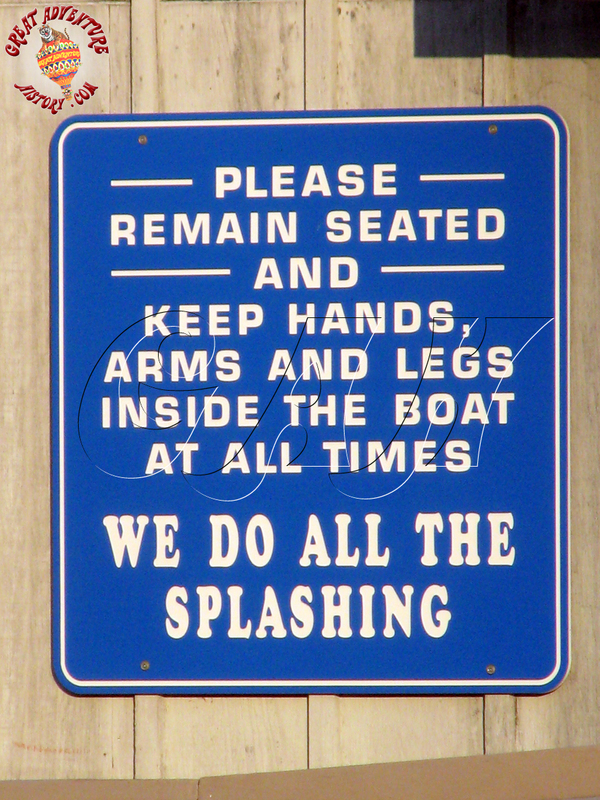 The viewing area also offered its own small splash zone, though only a minimal amount of water usually made it to the paved area, and quite often it was dependent on wind direction and the weight of the boat creating the splash. 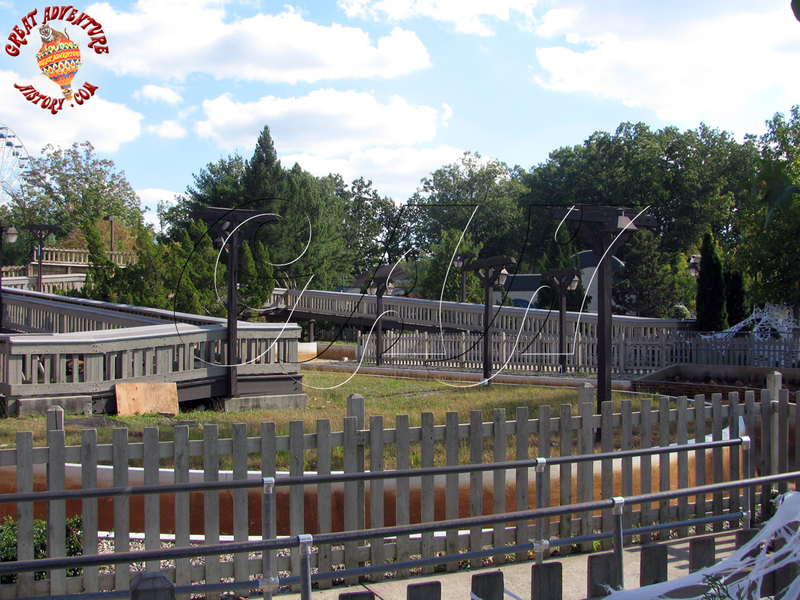 The ride area around SplashWater Falls was minimally landscaped with most of the immediate area just being planted with grass. 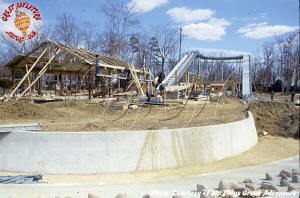 Around the concrete trough a planting bed of gravel was added with small bushes scattered throughout. 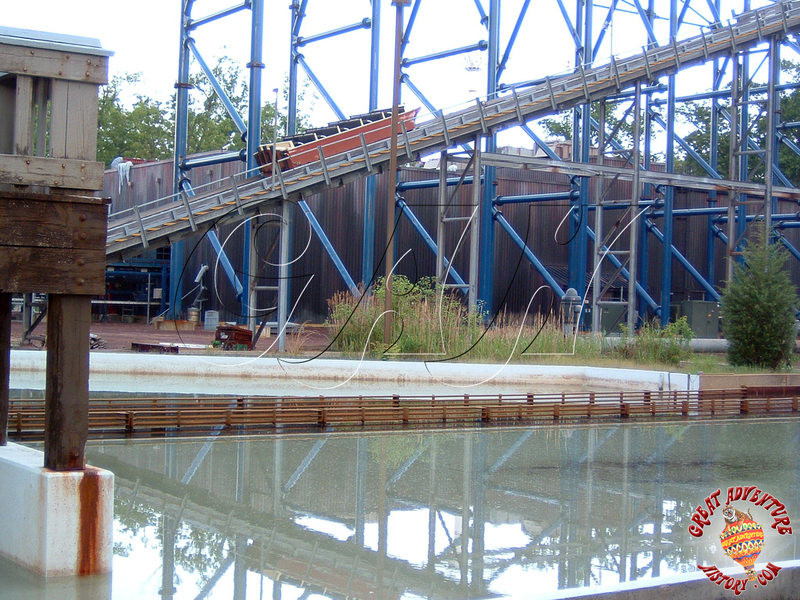 This gravel helped absorb the water that would spill over the trough edges. 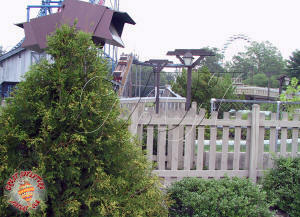 Many of the bushes didn't fair very well since the highly chlorinated water wasn't particularly good for plants. 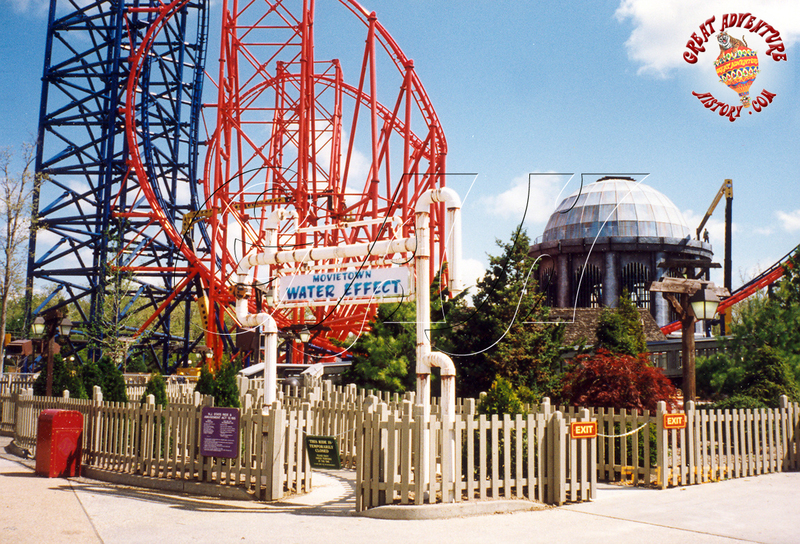 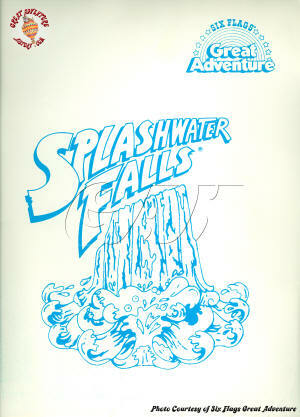 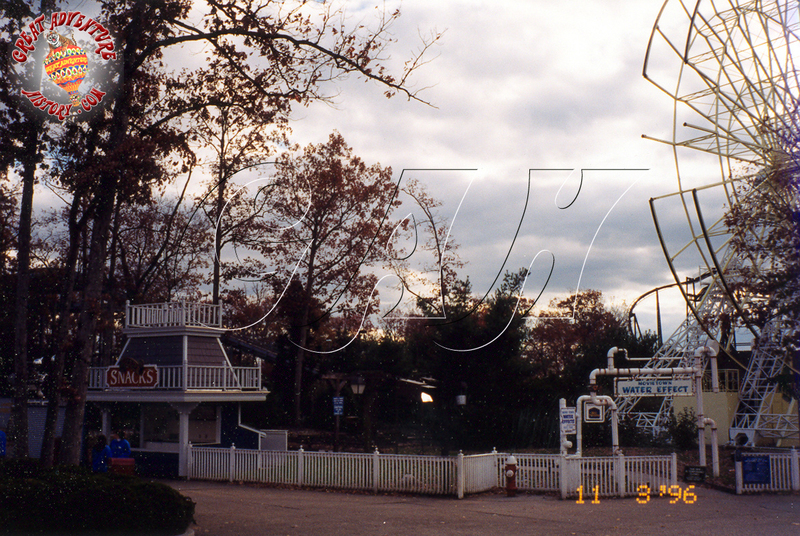 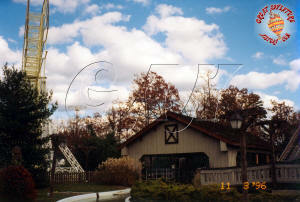 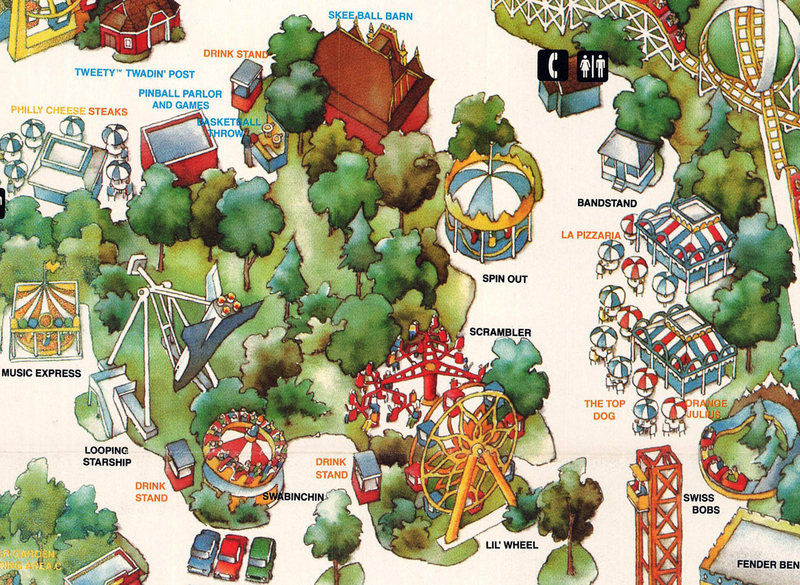 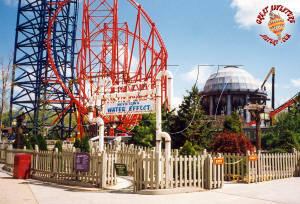 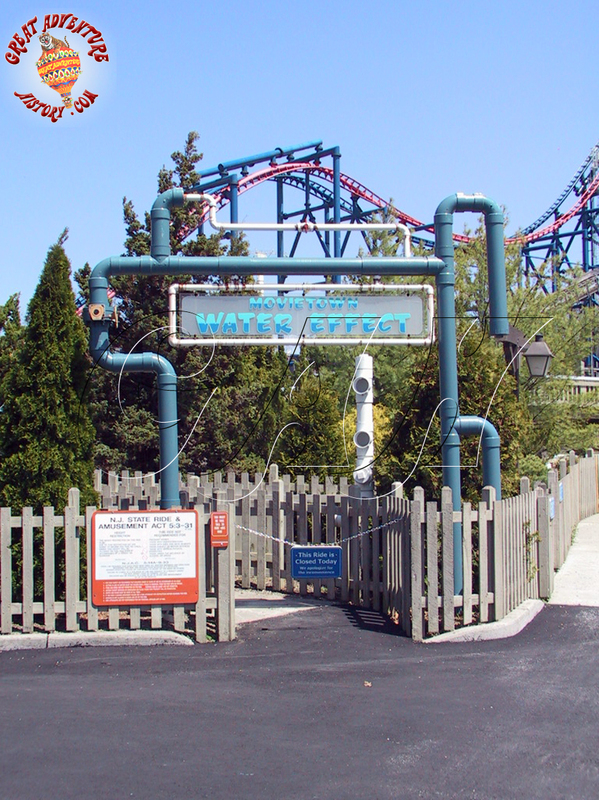 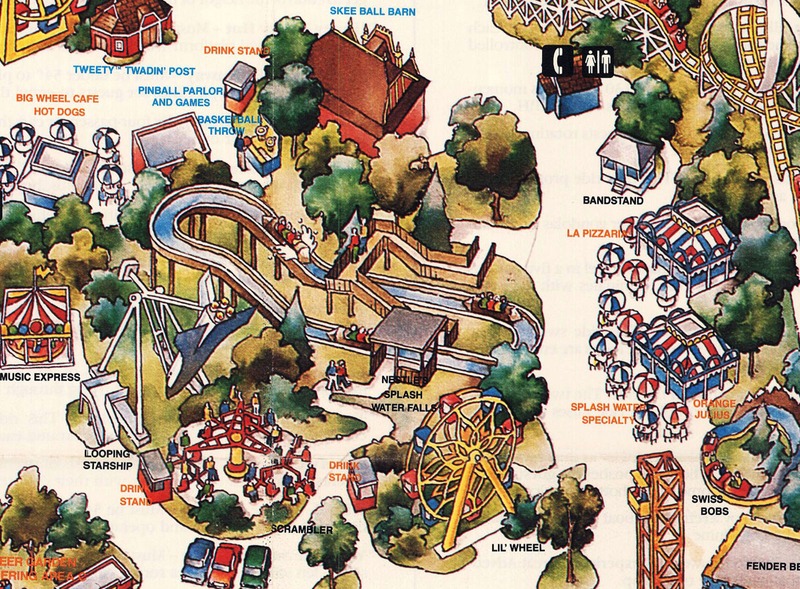 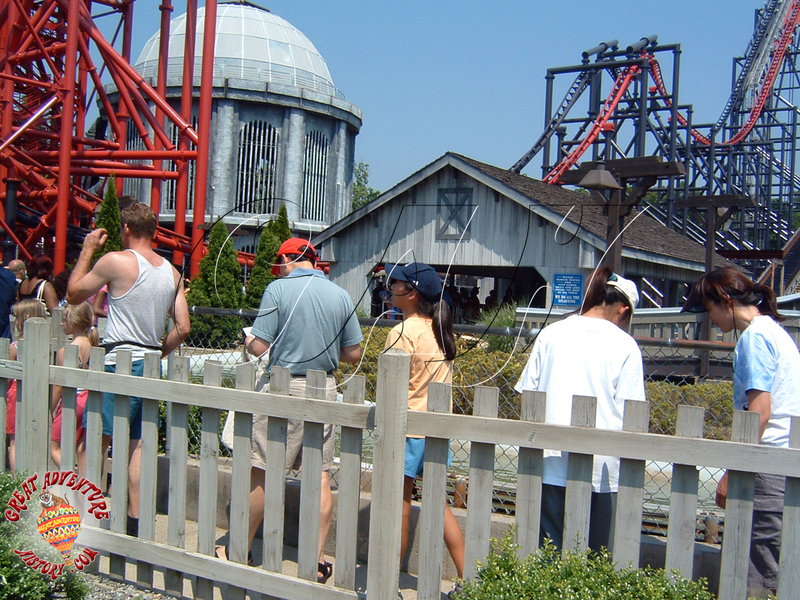 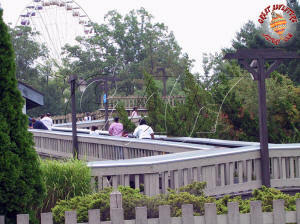 In the 1990's when Time Warner took control of Six Flags and greater efforts were made to bring coherent themes to sections of the park, the area with SplashWater Falls became Action Town, then Movie Town the following season. 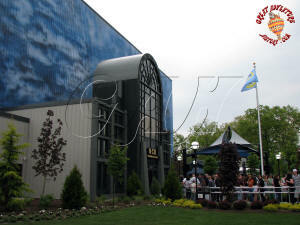 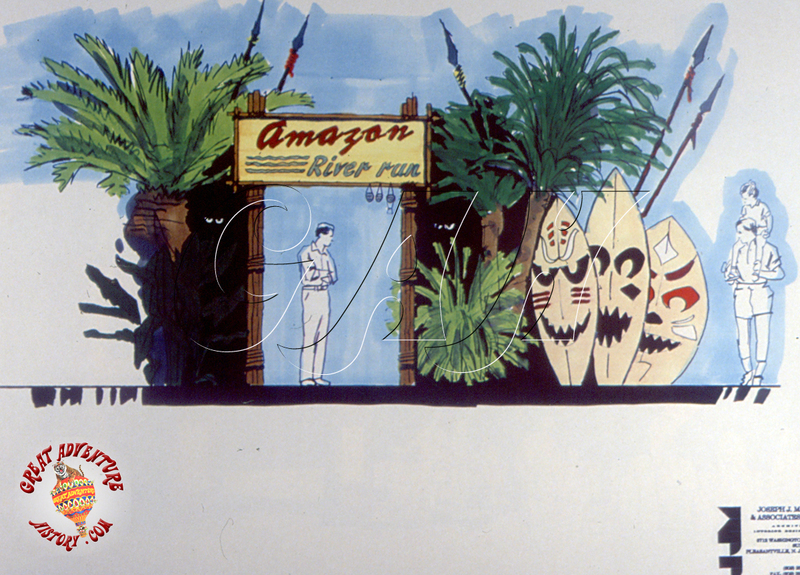 As part of the thematic makeover for Action Town, renaming the ride "Amazon River Run" was considered. 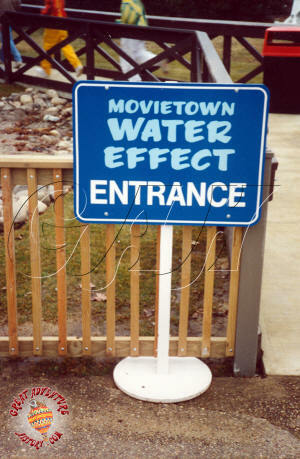 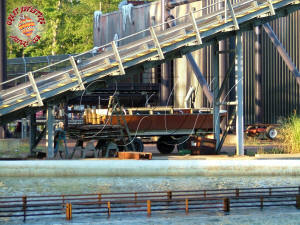 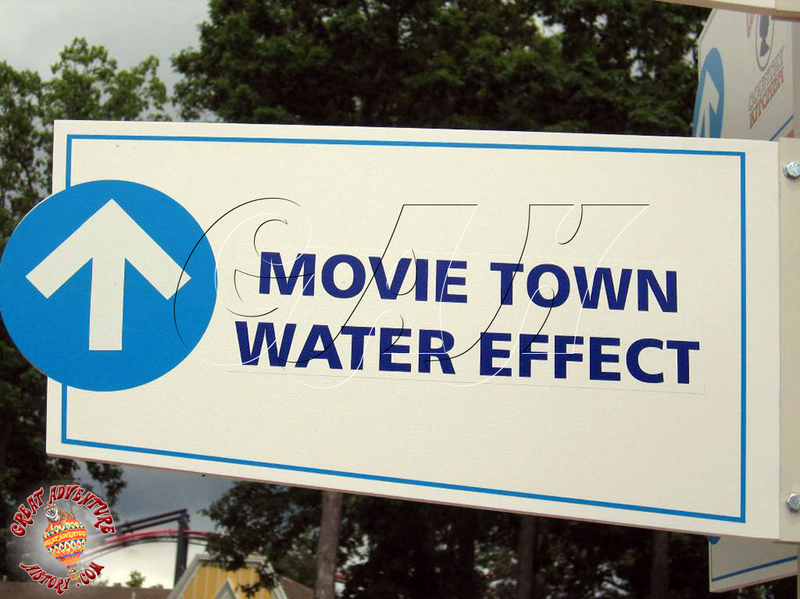 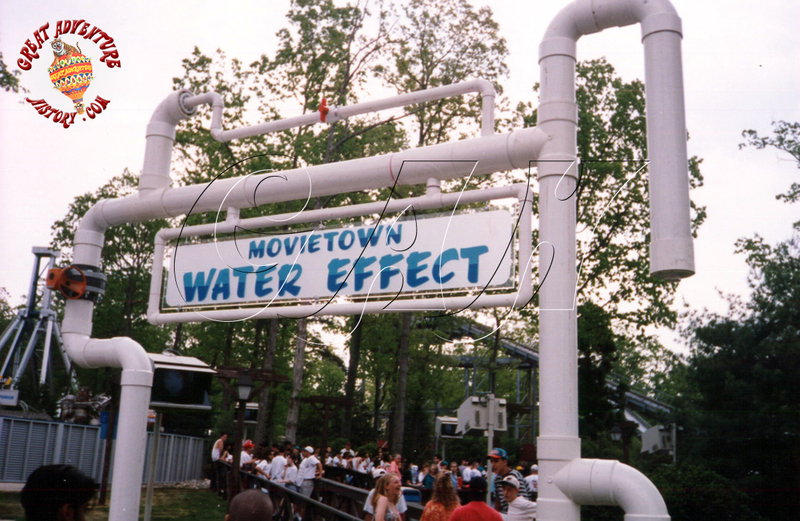 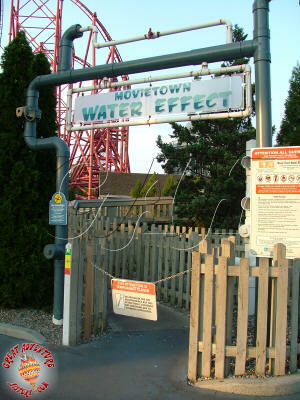 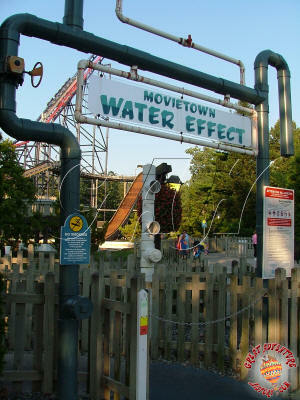 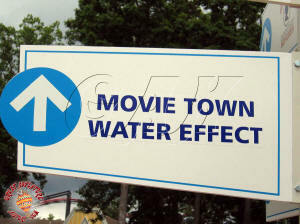 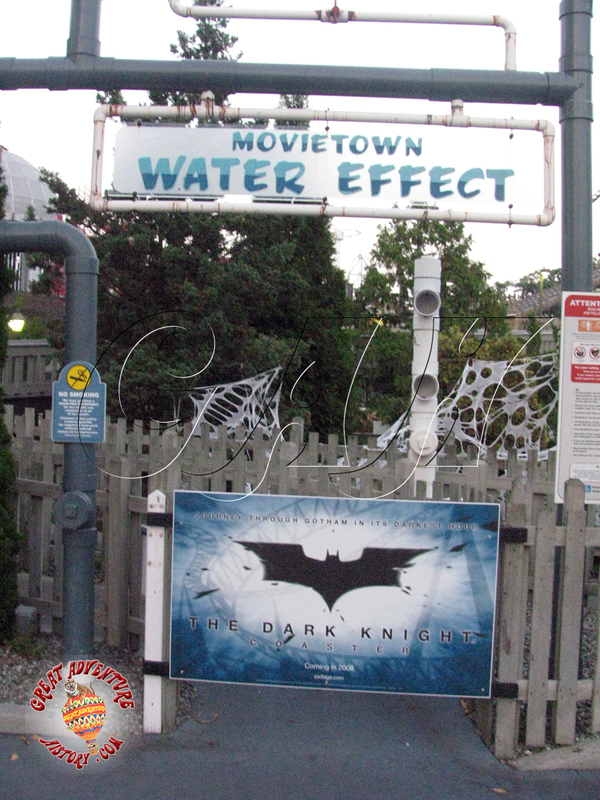 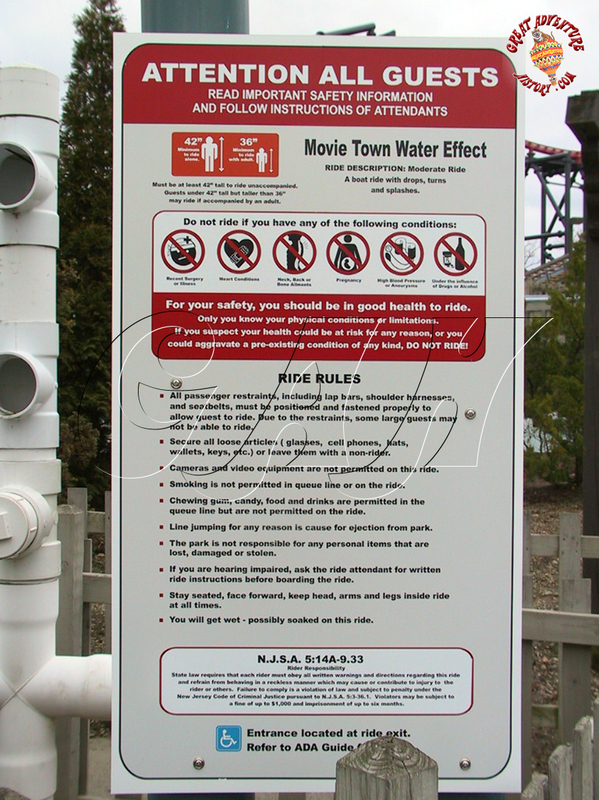 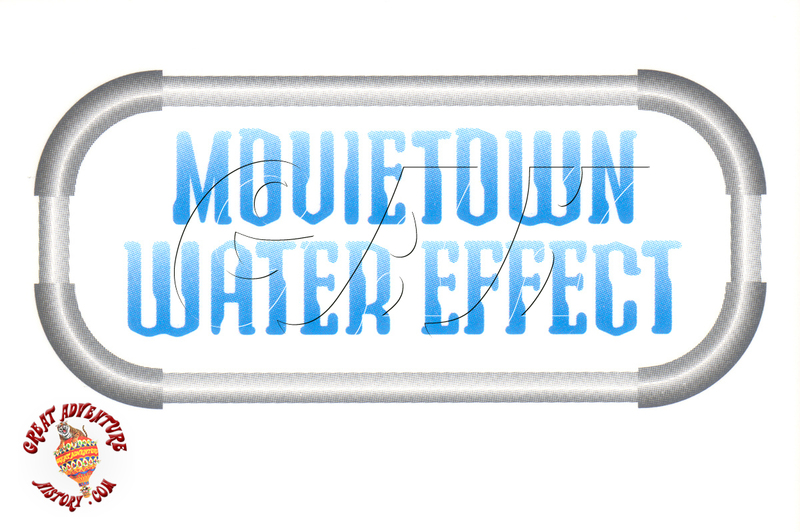 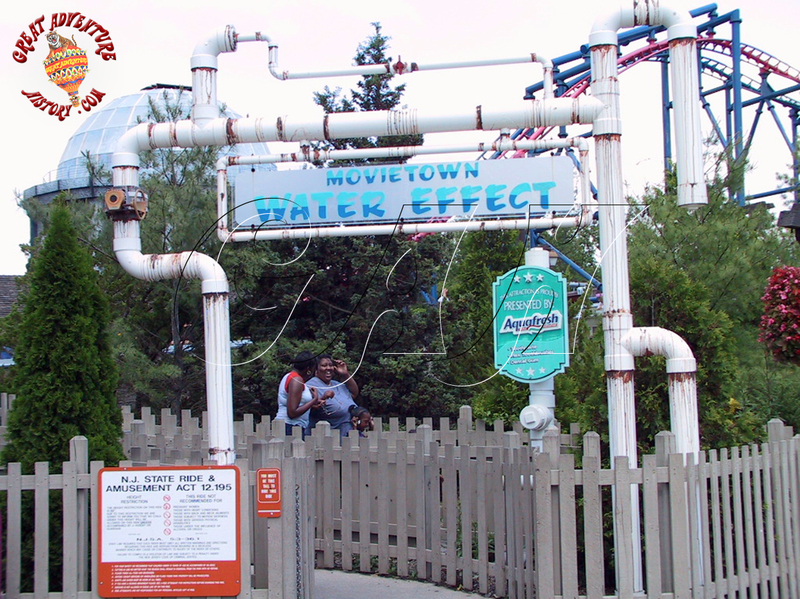 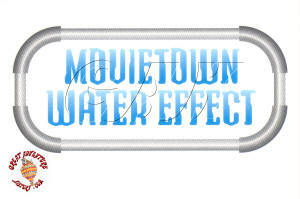 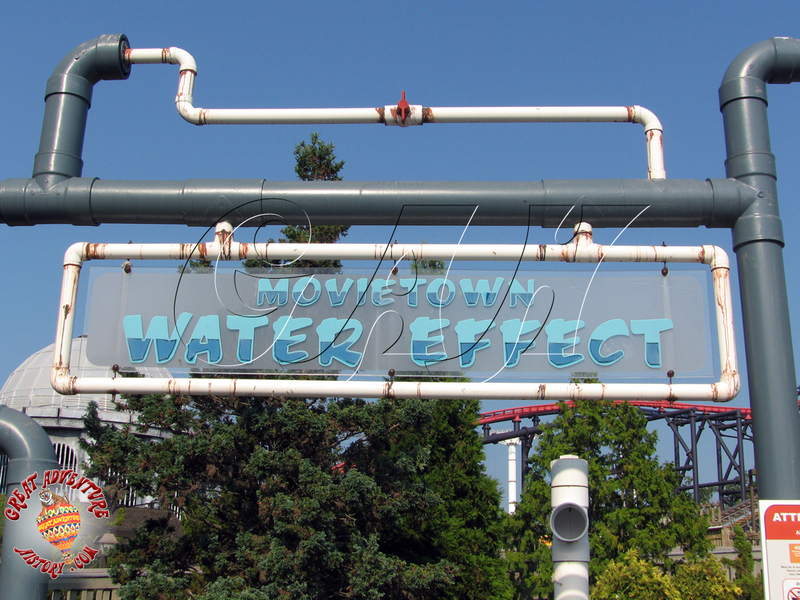 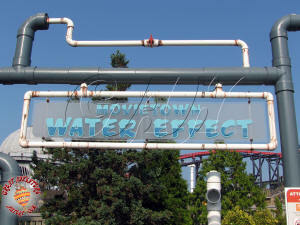 When plans called for turning Action Town into Movie Town, the renaming was postponed and finally SplashWater was given the new name Movie Town Water Effect. 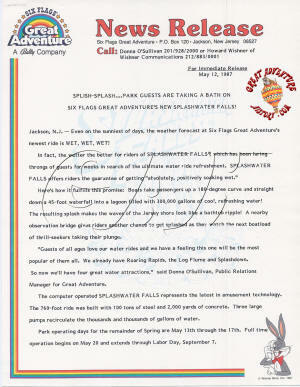 Despite the seeming simplicity of SplashWater Falls, it was something of a maintenance and operational challenge while it was at the park. 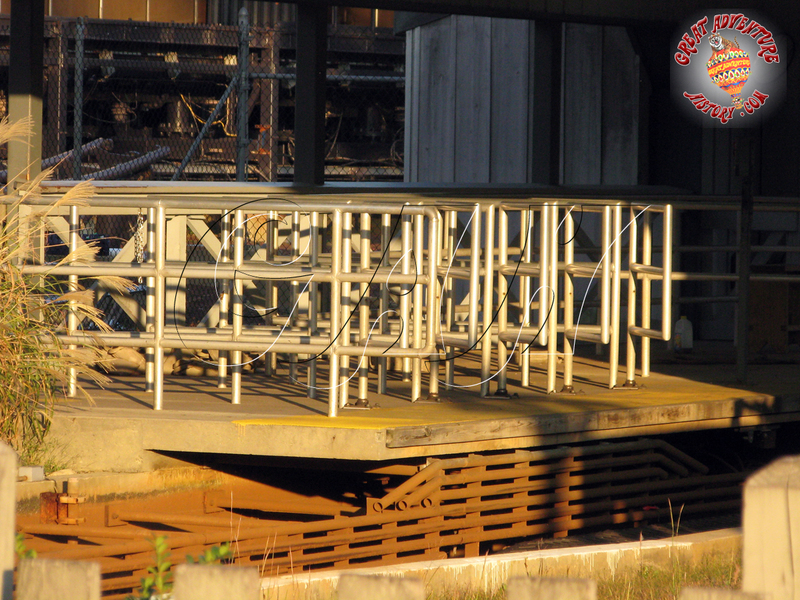 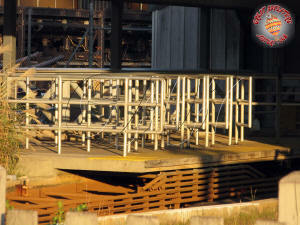 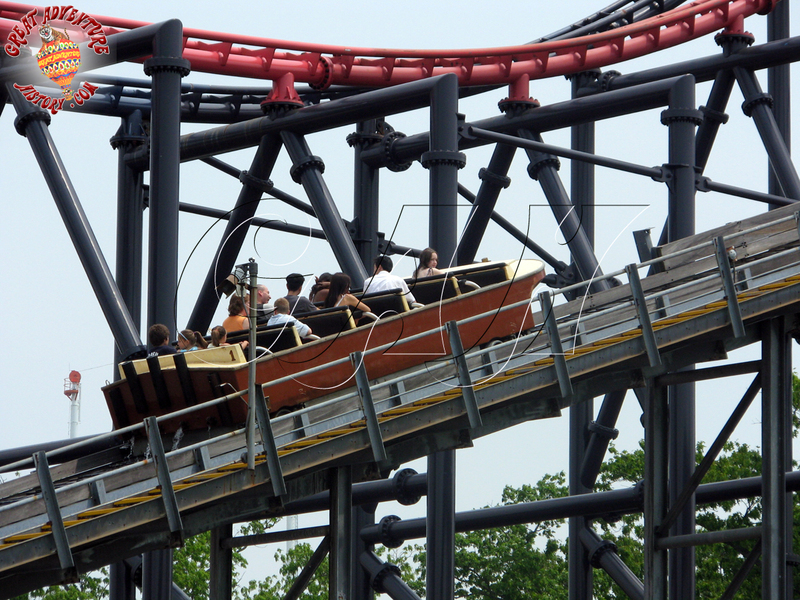 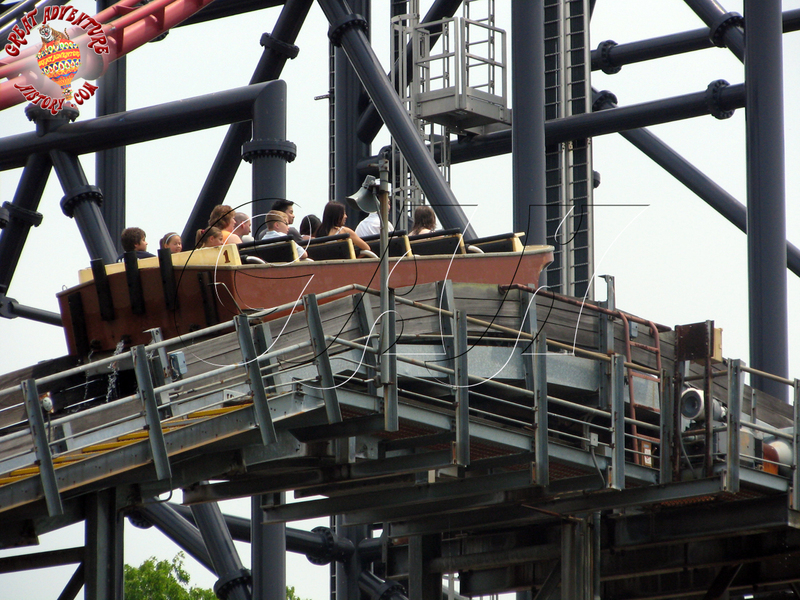 Maintenance challenges arose from the ride manufacturer being a smaller company which eventually went out of business, making parts hard to come by and more expensive. 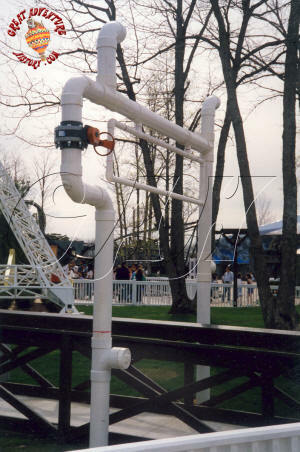 Operationally the ride's computer system often created false warnings as sensors would indicate problems that did not exist. 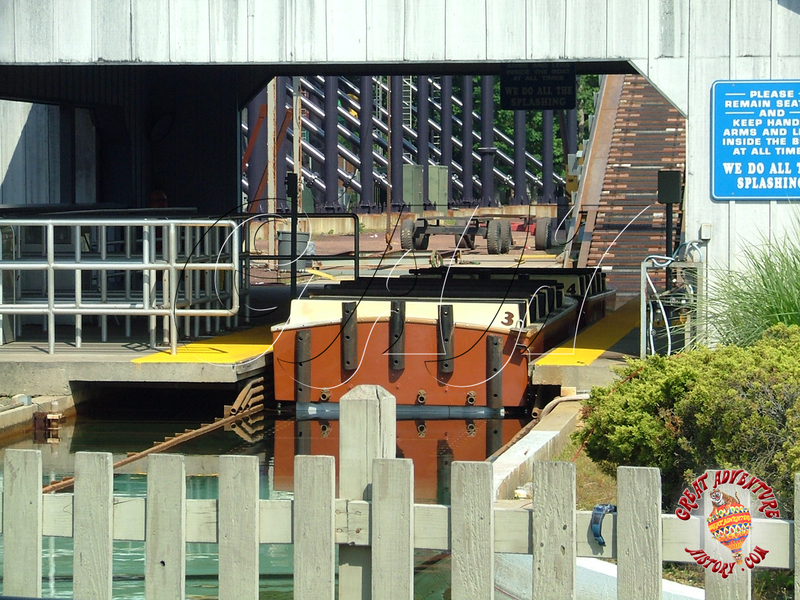 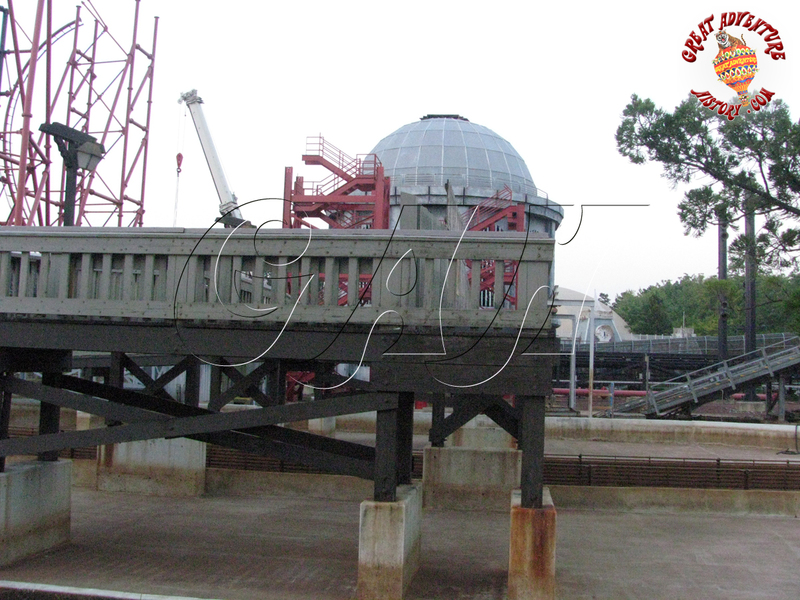 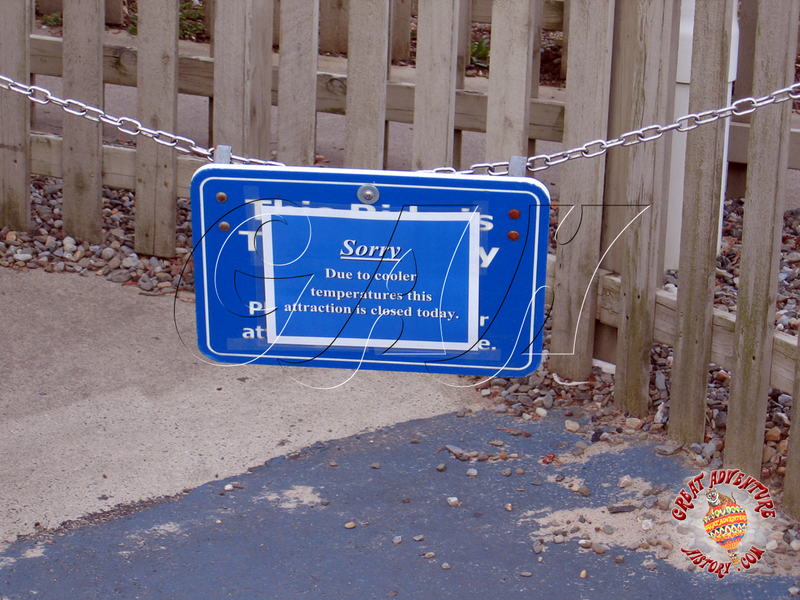 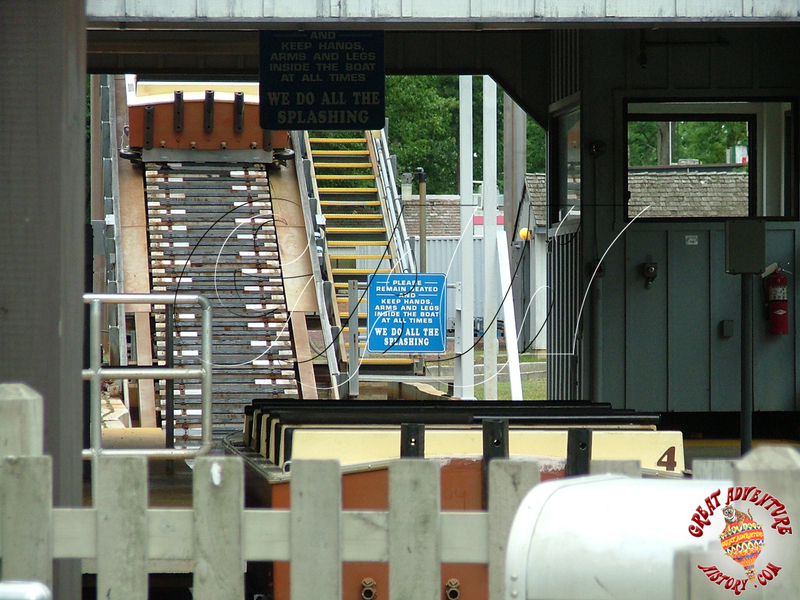 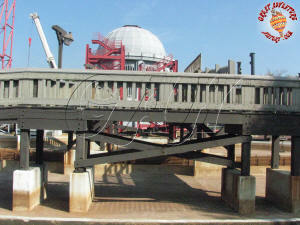 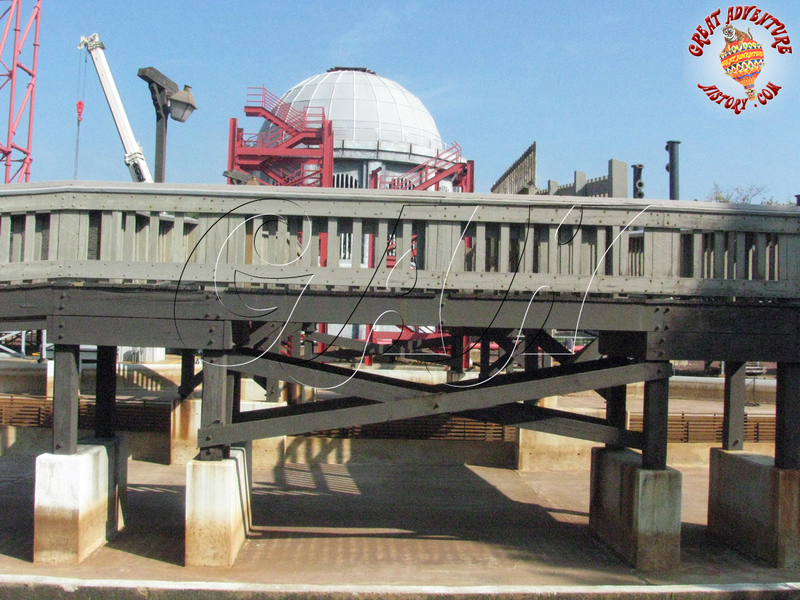 Usually the sensors would indicate that the gates which allowed boats to be added and removed from the circuit through were open and would stop the ride and require resetting the system. 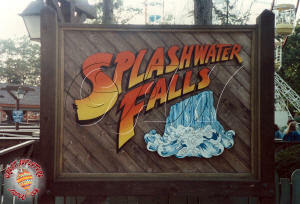 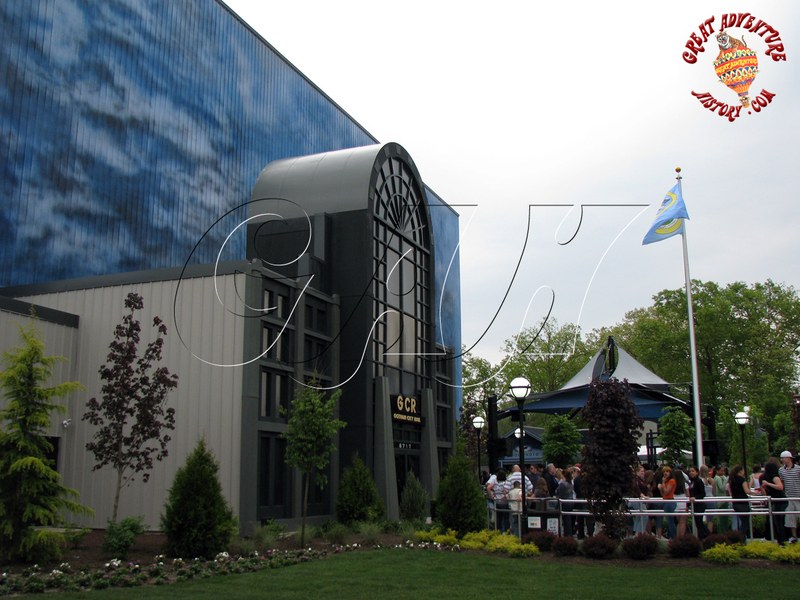 For the 1996 season SplashWater Falls got a new neighbor with the addition of Batman and Robin: The Chiller. 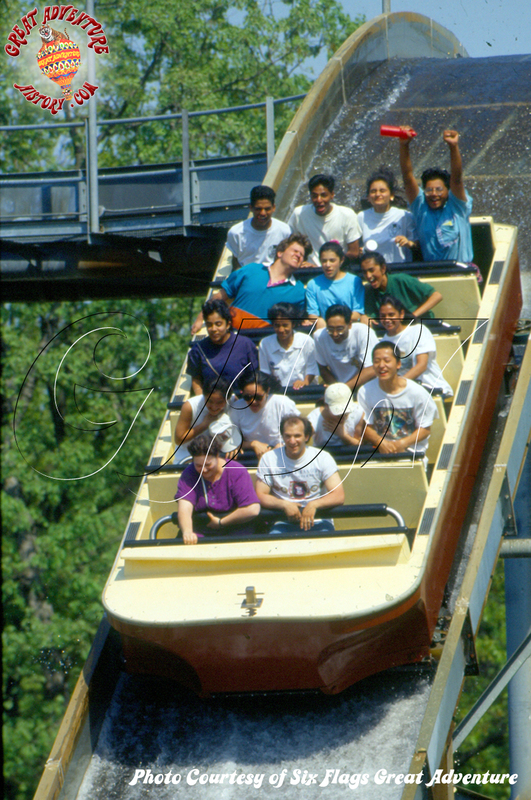 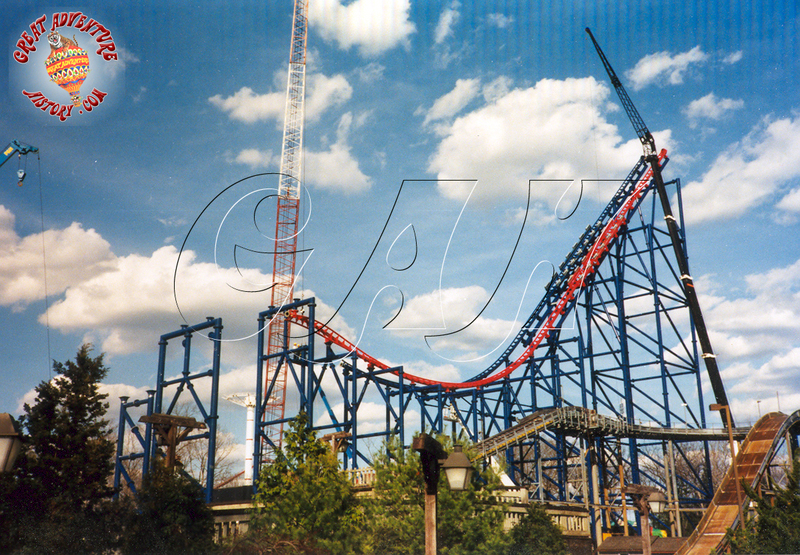 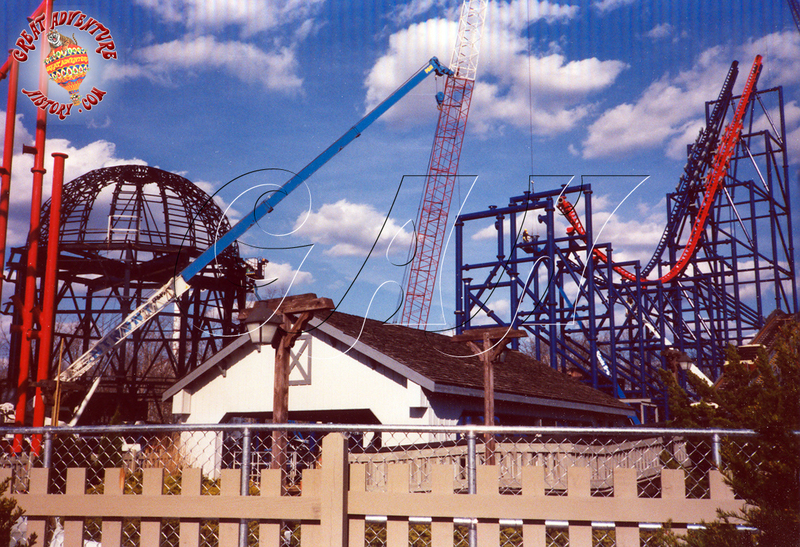 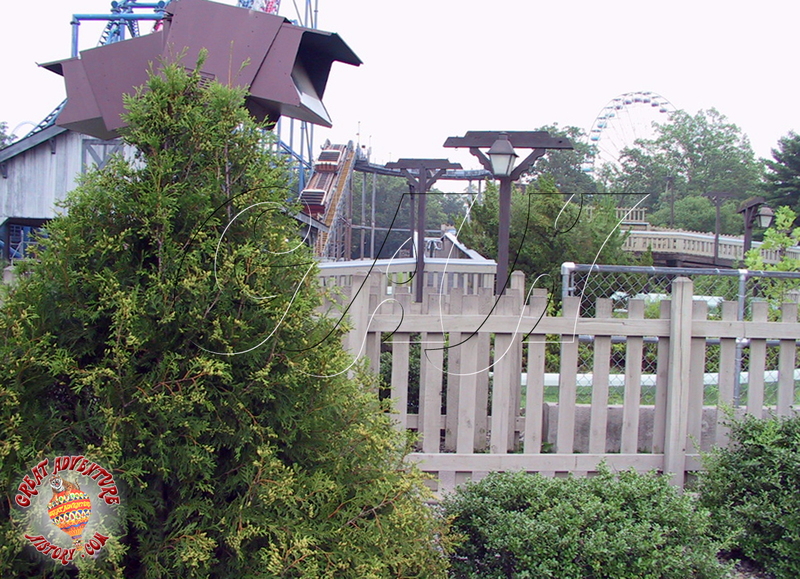 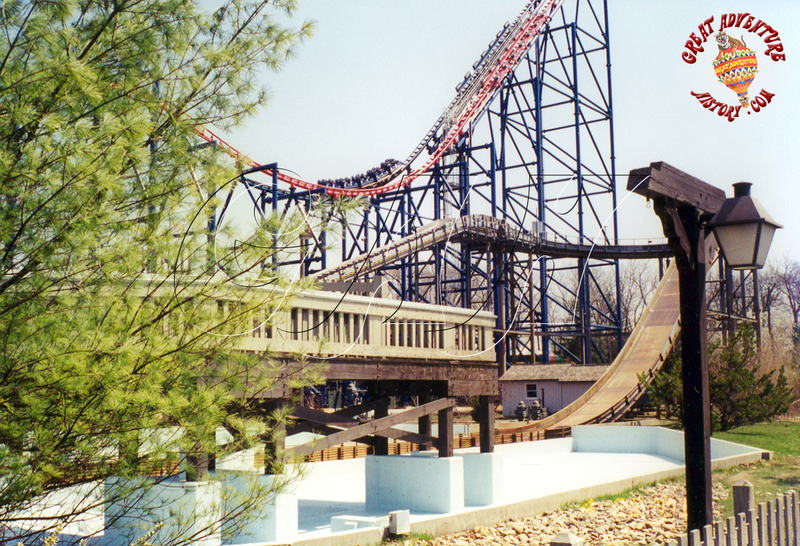 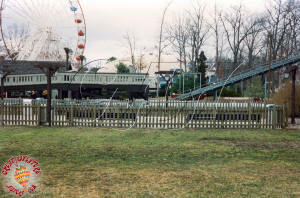 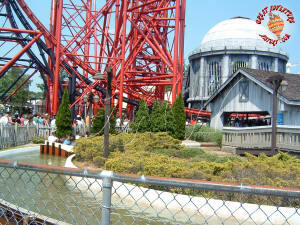 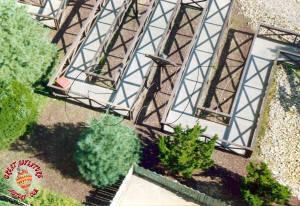 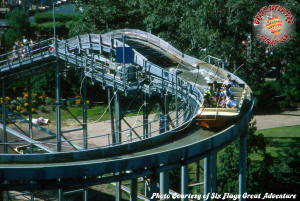 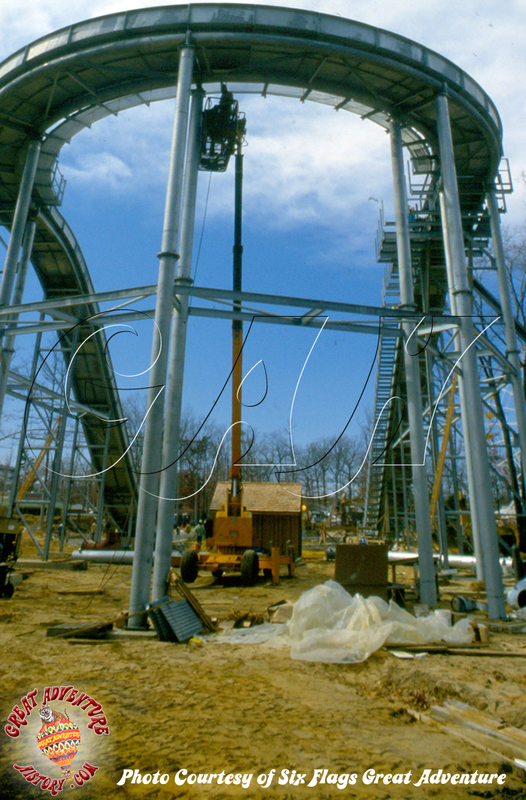 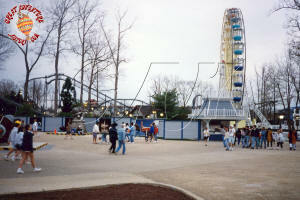 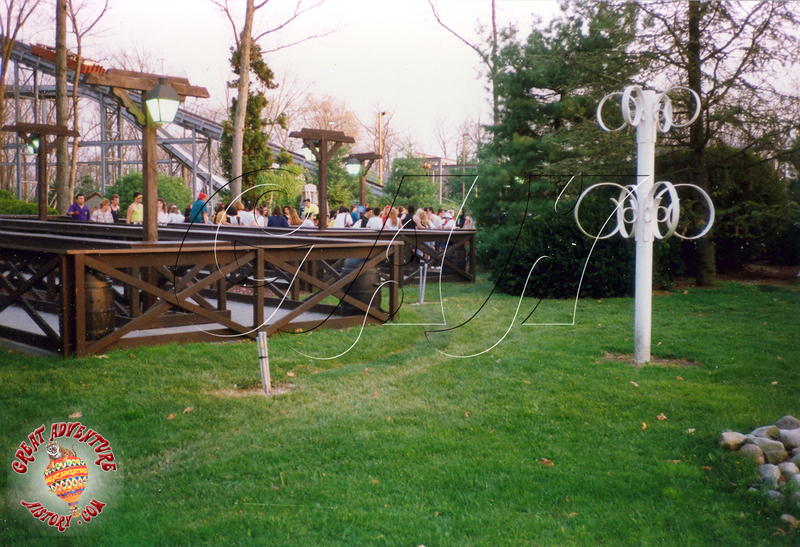 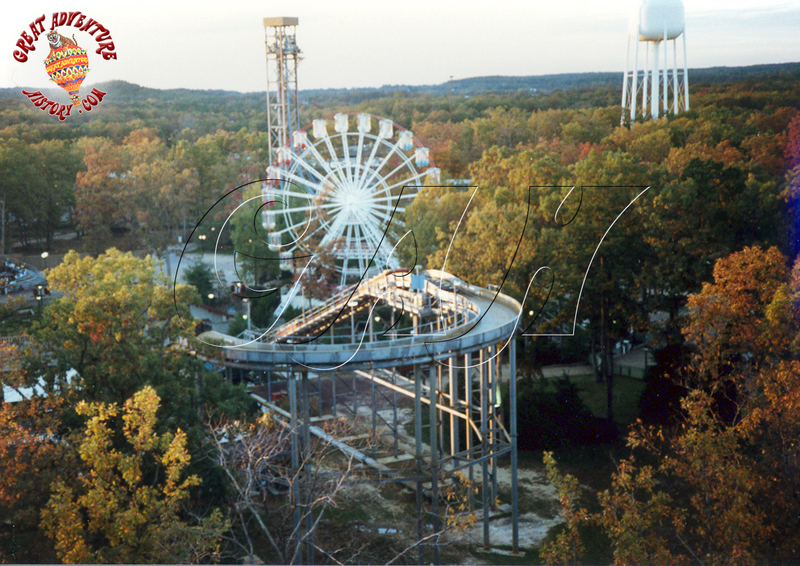 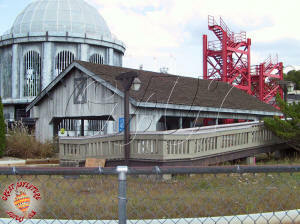 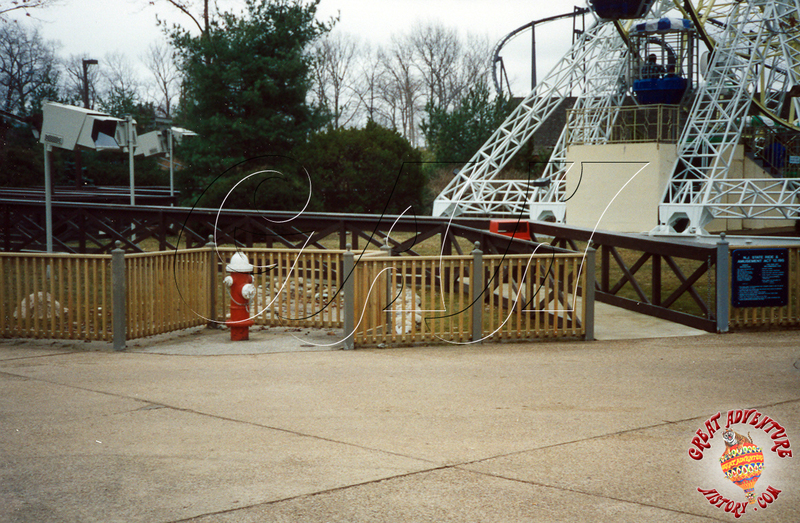 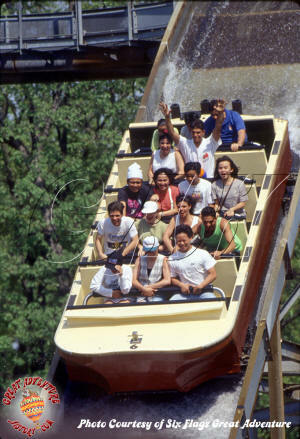 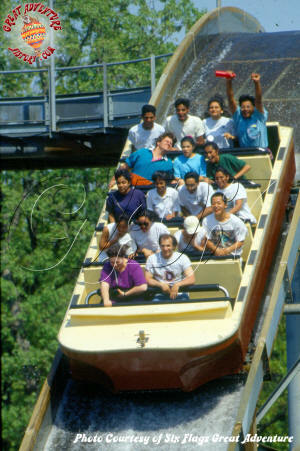 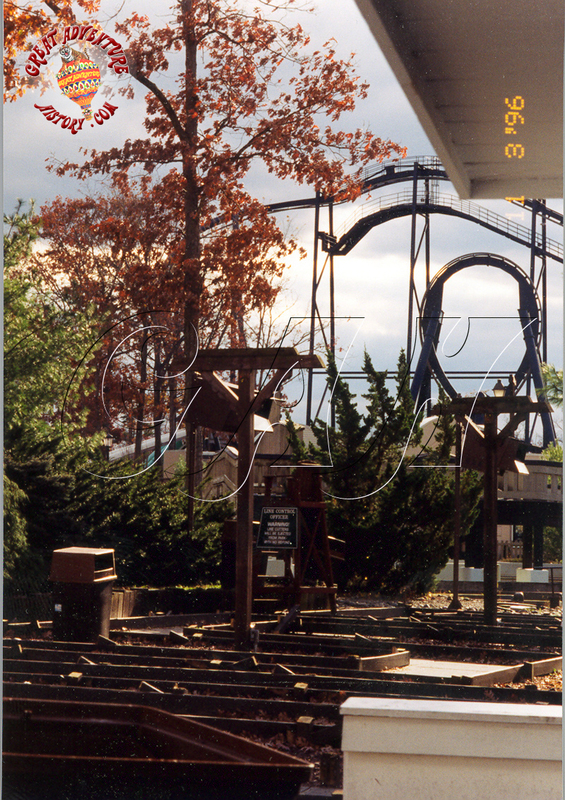 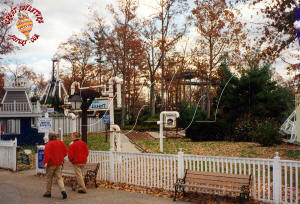 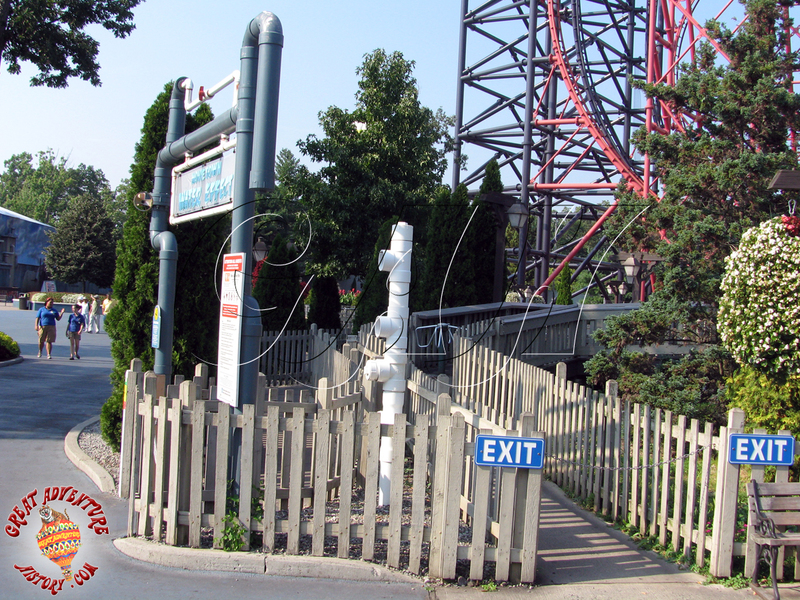 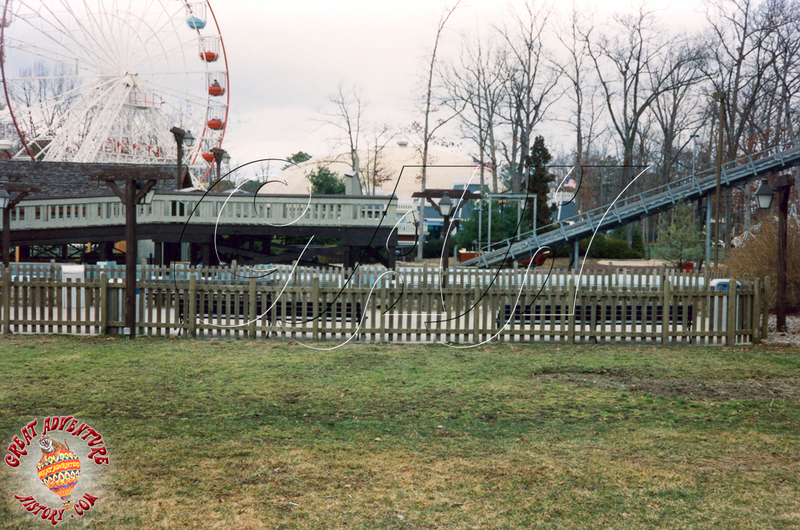 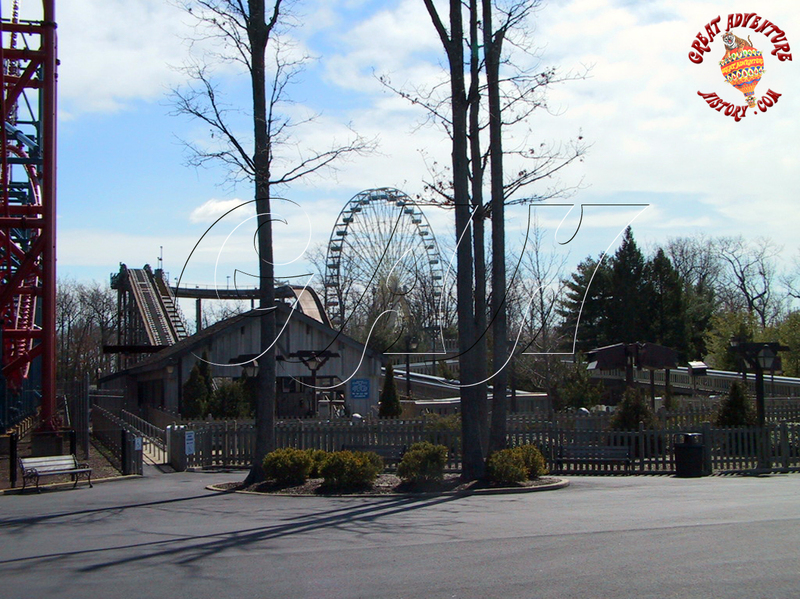 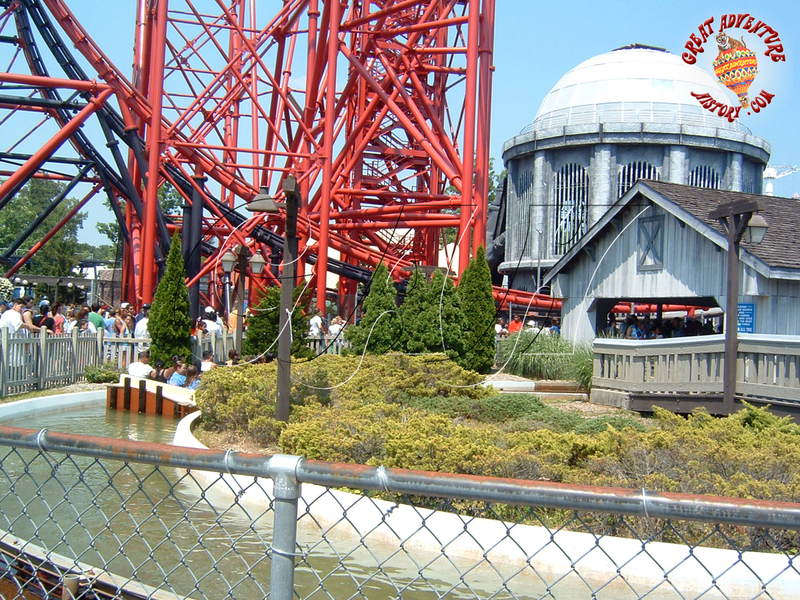 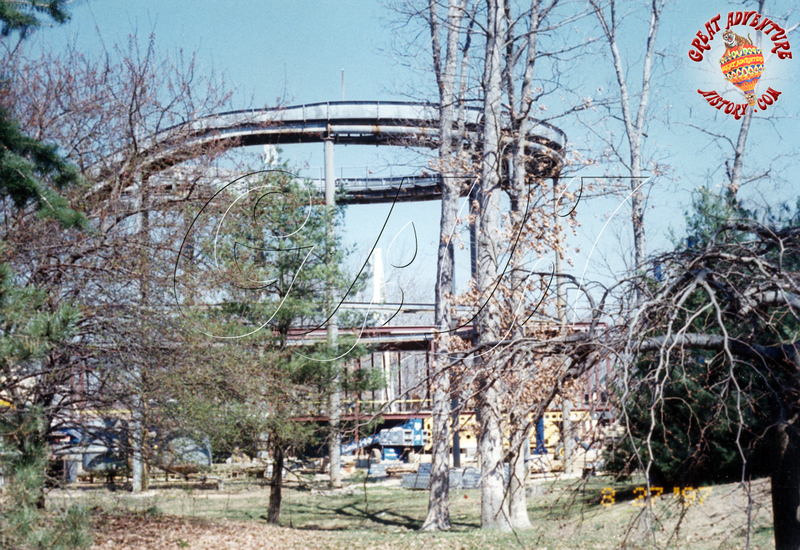 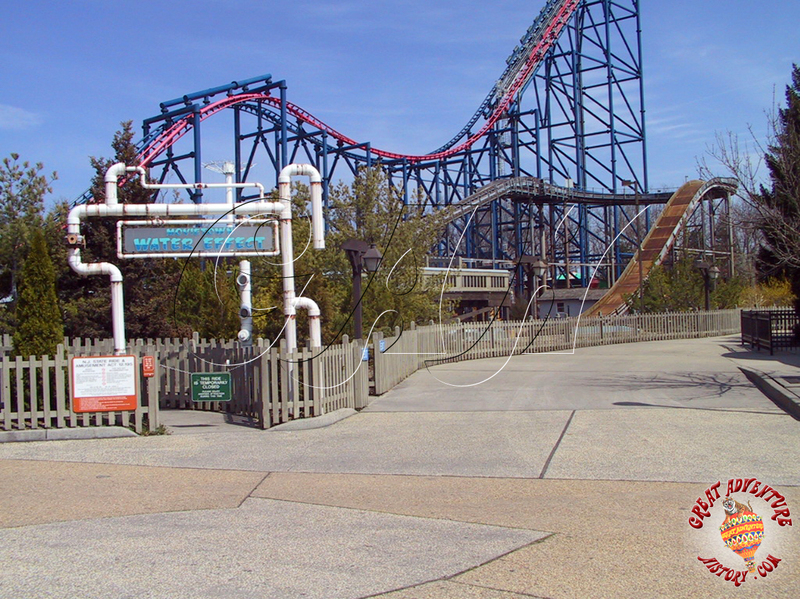 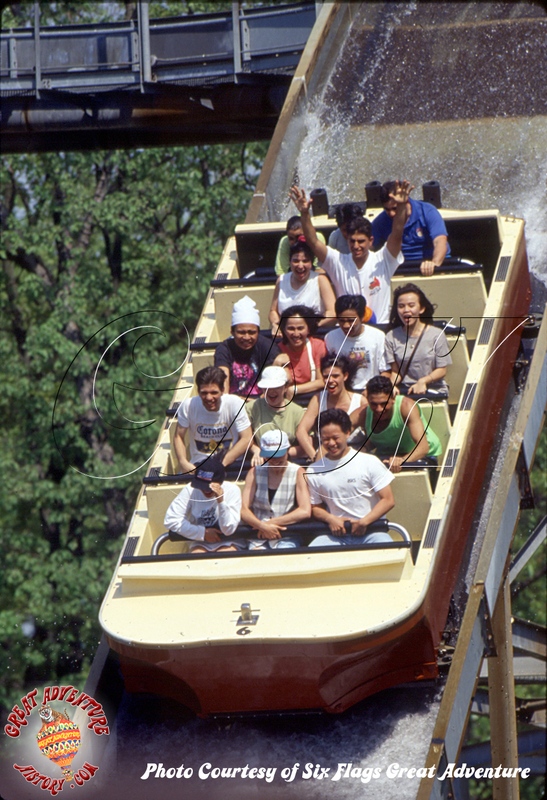 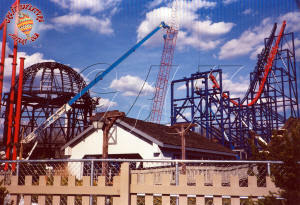 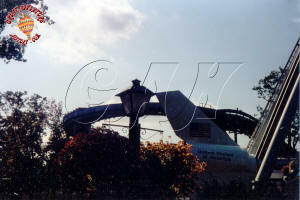 As part of the new addition, the ride remained closed in the spring of 1996 while construction of the new coaster was taking place. 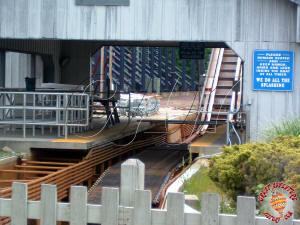 The new coaster station was erected on SplashWater's queue area, so a new entrance was constructed with a shorter line and an entrance gate right next to the exit gate. 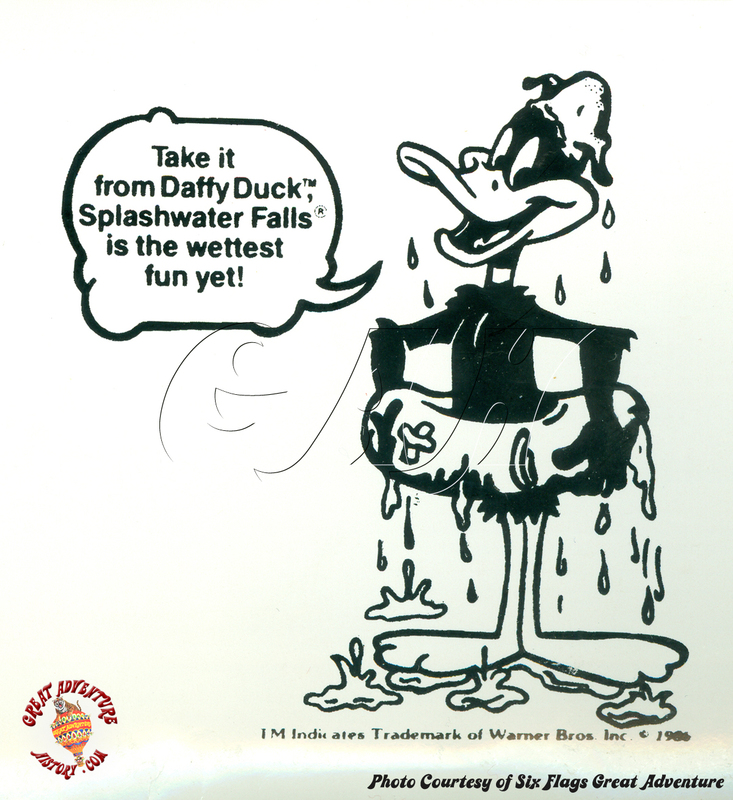 As the years went on since SplashWater Falls premiered, it diminished in popularity. It was a one trick pony that offered a cool break in the day, but the ride experience lacked the thrill it once had offered. 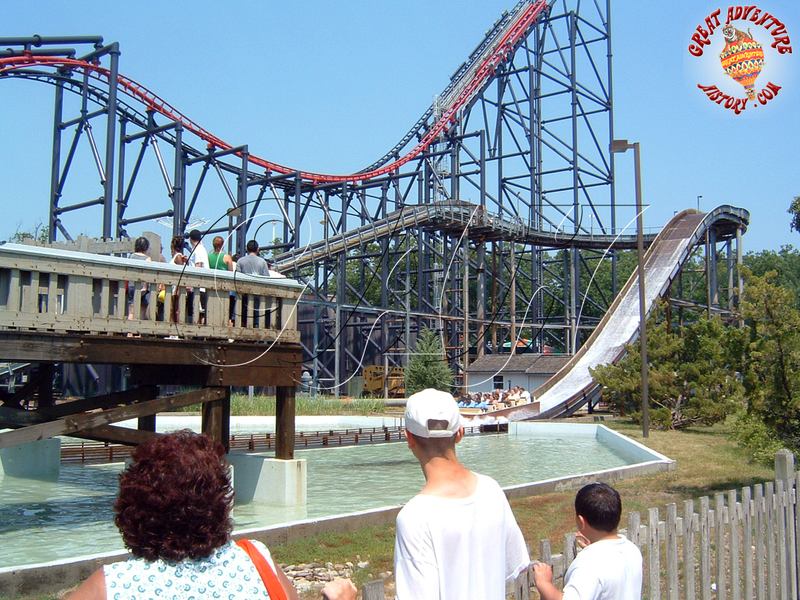 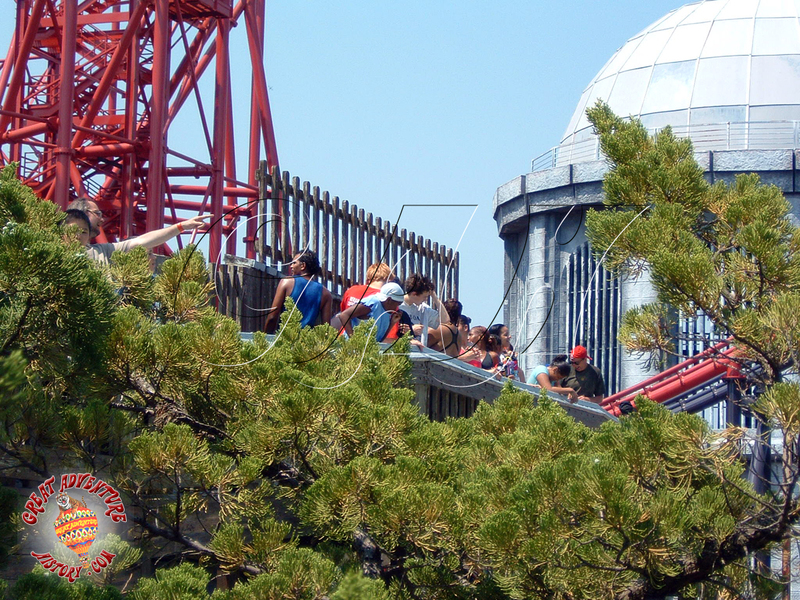 The ride which had generally been open from the beginning of the season to the end was now reduced to part time operations, usually open only at the height of summer when it could actually draw a crowd. The ride began to show its age as the 2000's went on, appearing rusty and looking more and more like a kid's ride as bigger and more thrilling rides were added throughout the park. 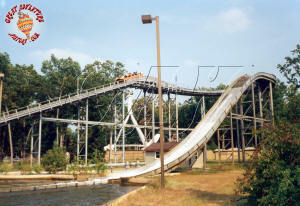 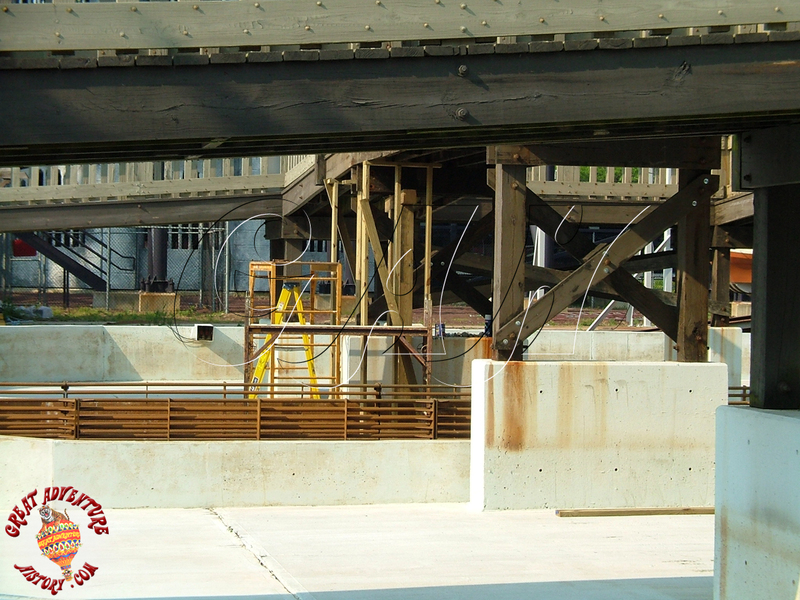 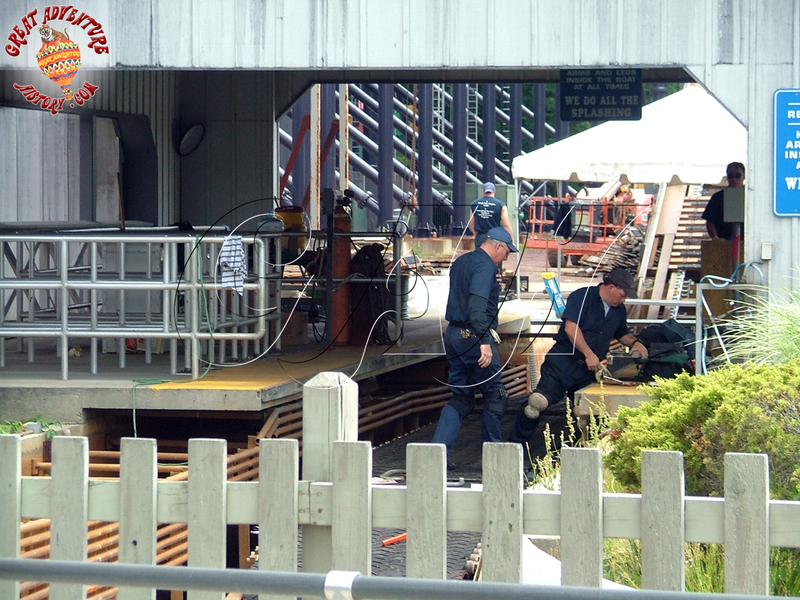 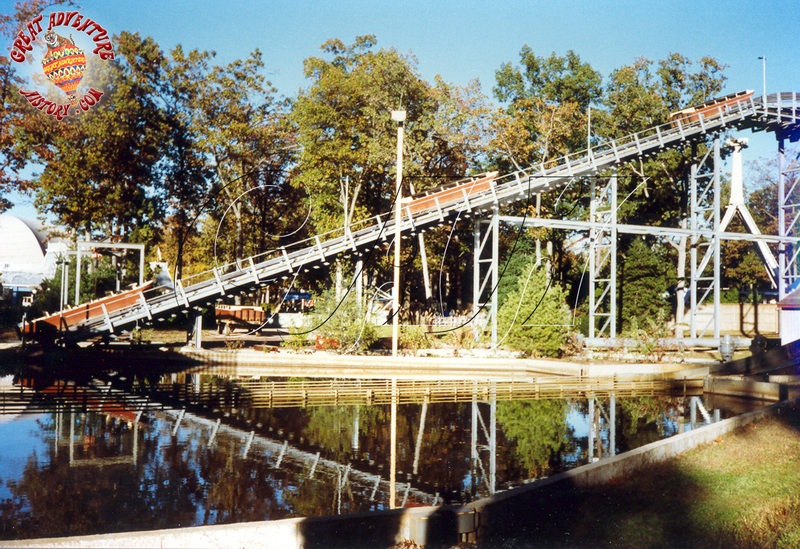 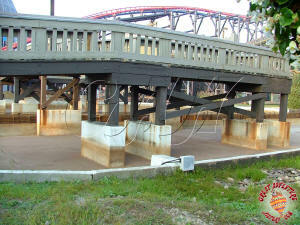 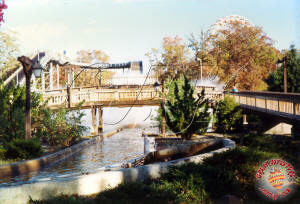 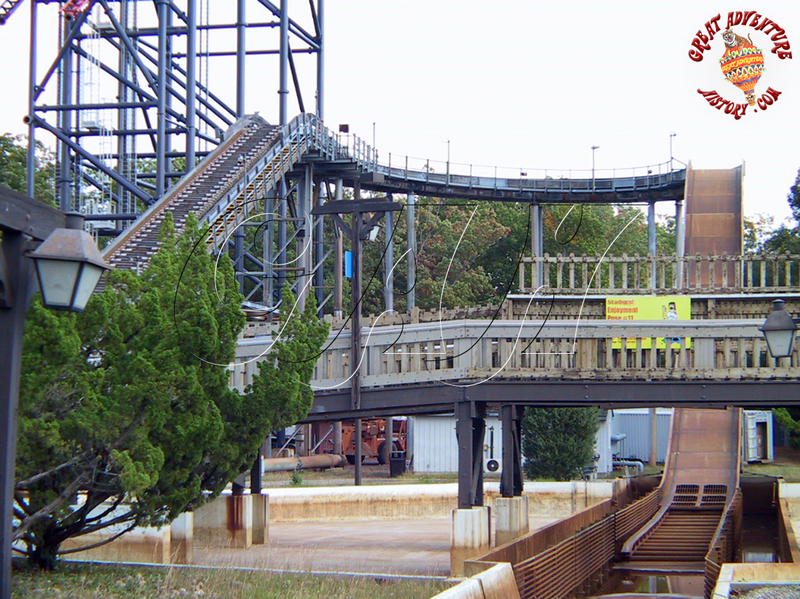 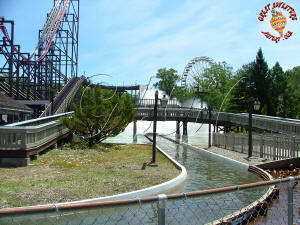 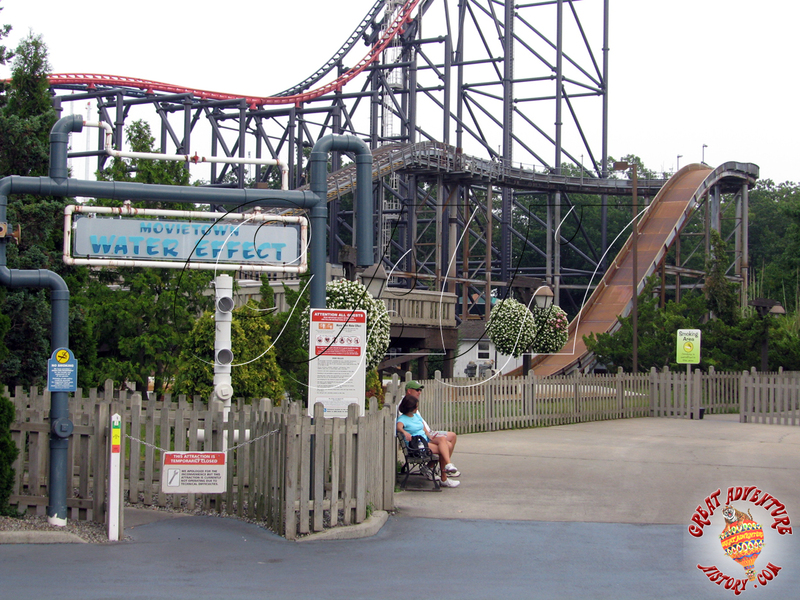 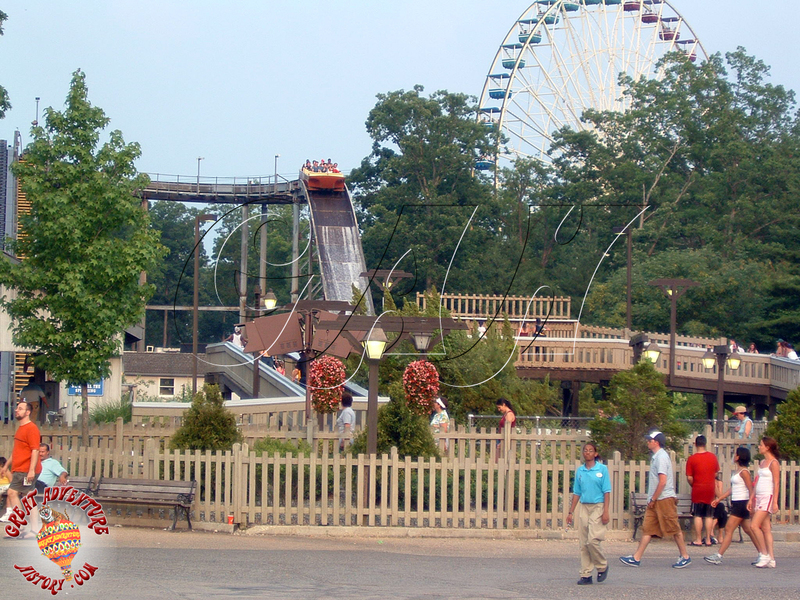 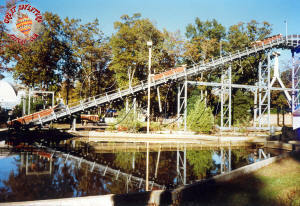 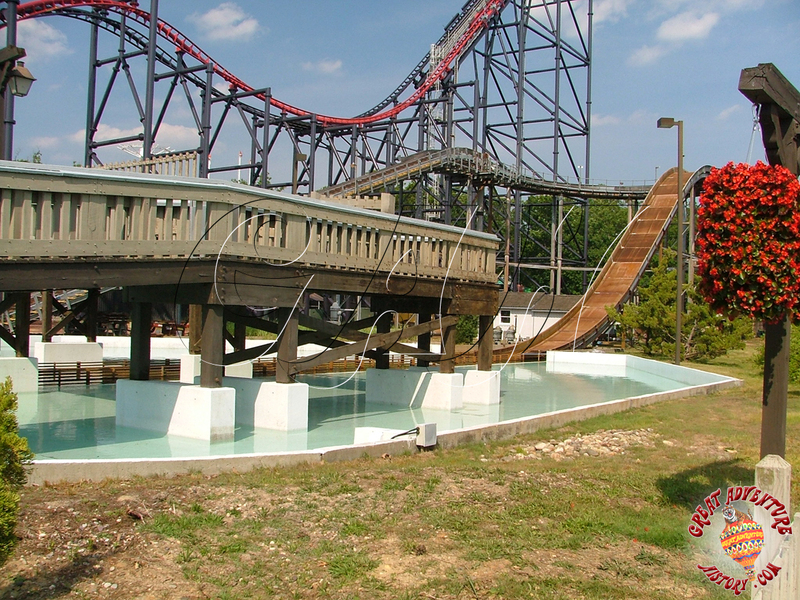 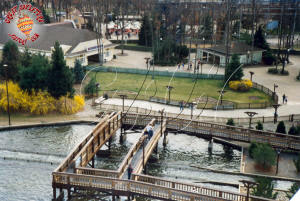 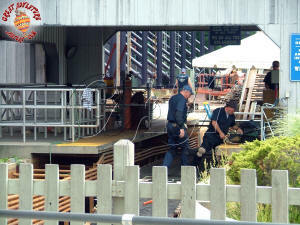 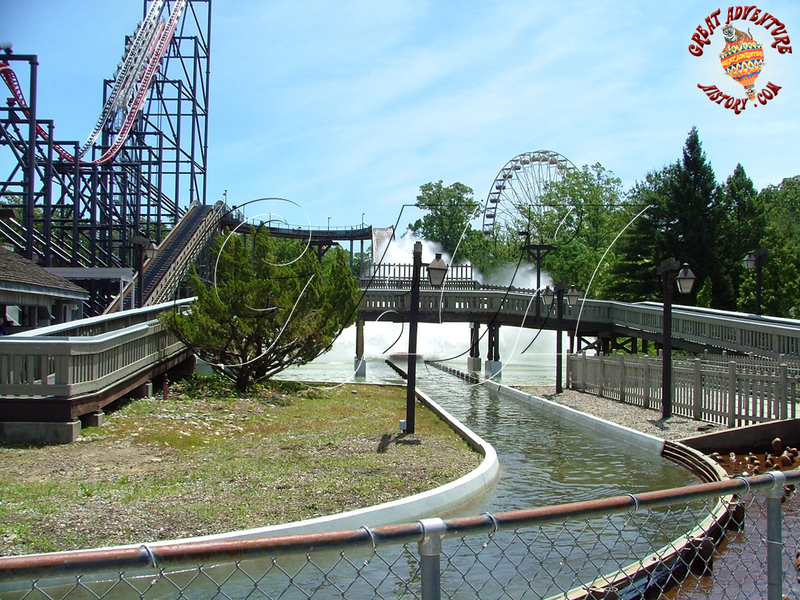 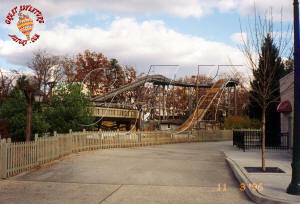 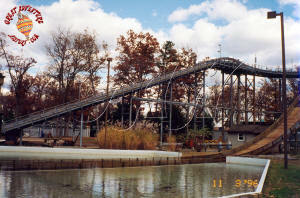 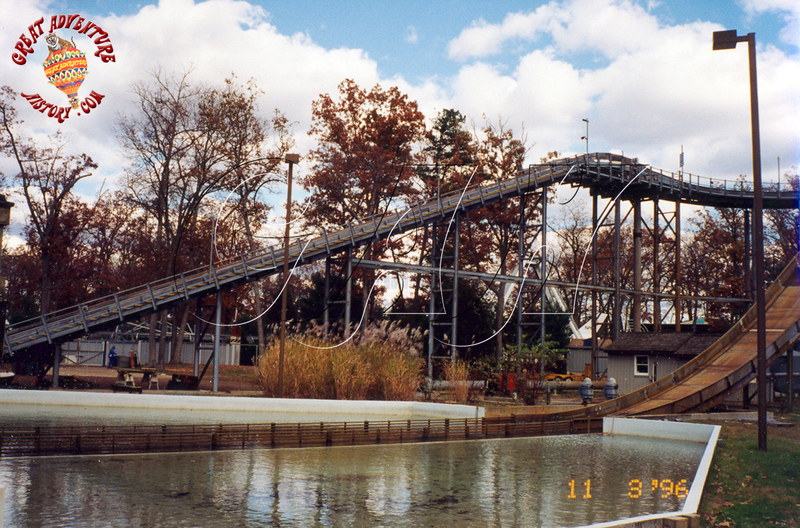 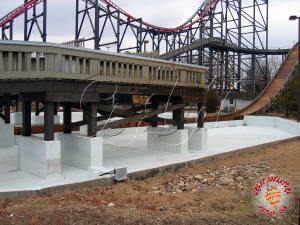 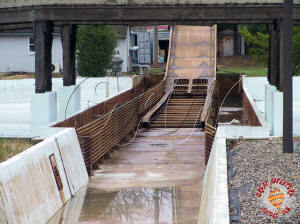 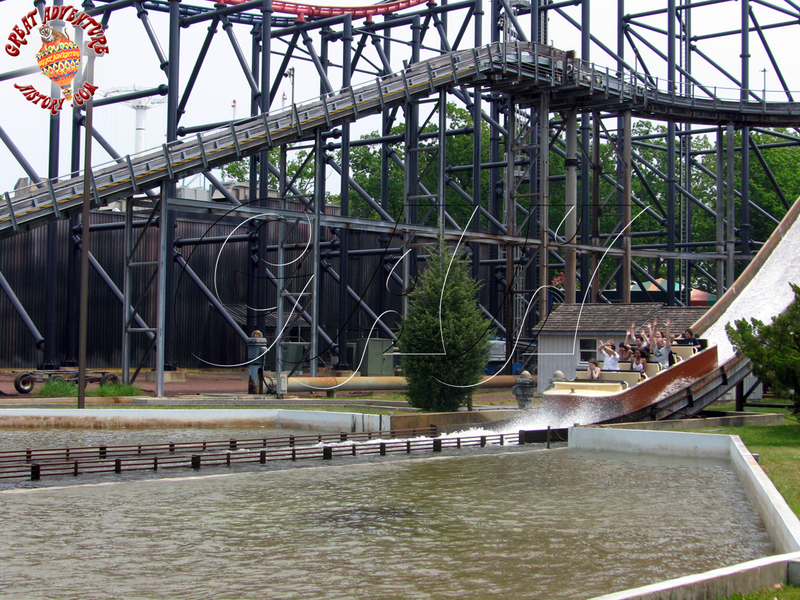 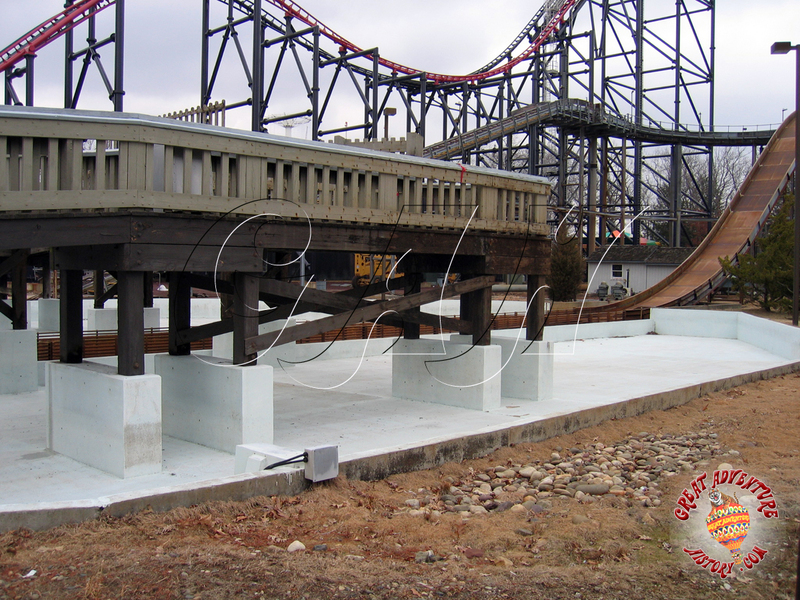 For the 2006 season SplashWater received a complete refurbishment with the aging station drives and lift hill mechanism being rebuilt as well as a complete resurfacing of the retention pond area. 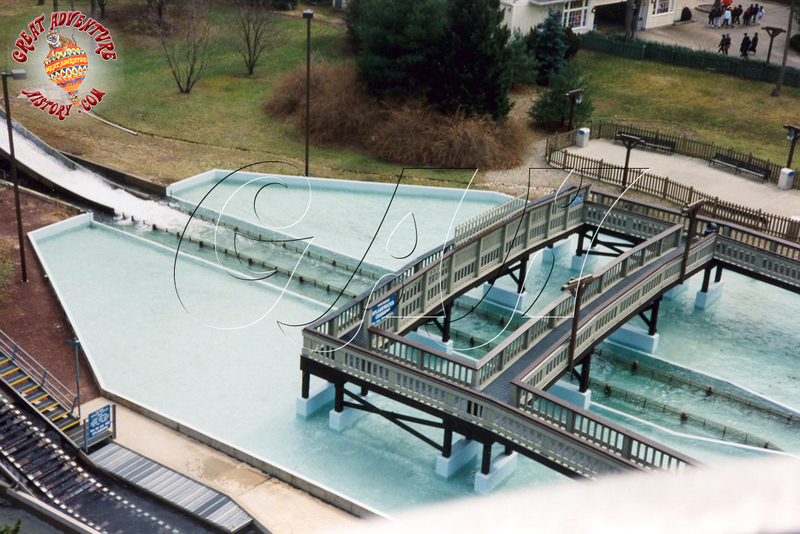 That same year one of the park's other water rides, the Riptide flume, was removed . 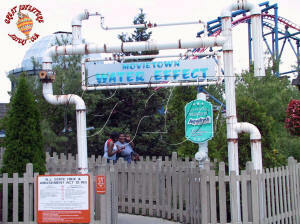 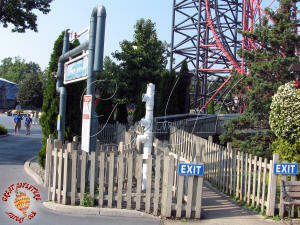 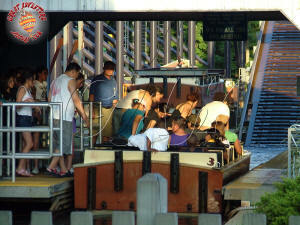 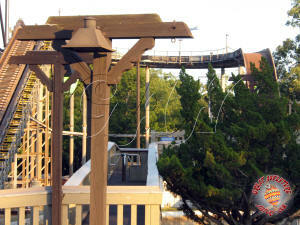 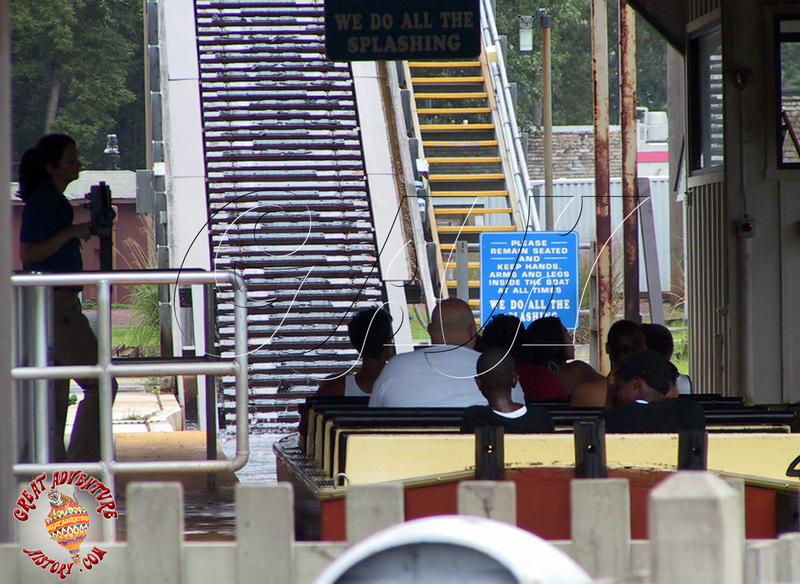 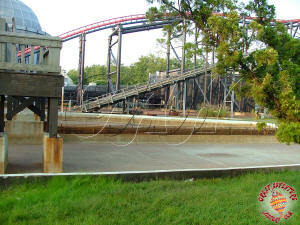 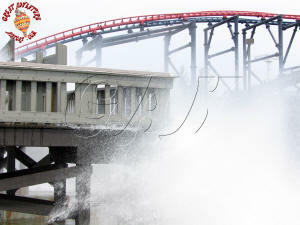 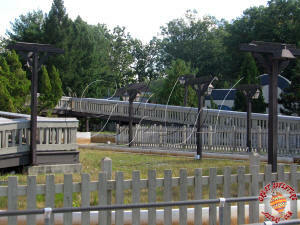 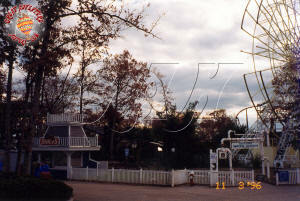 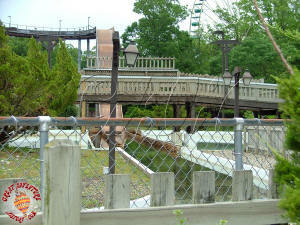 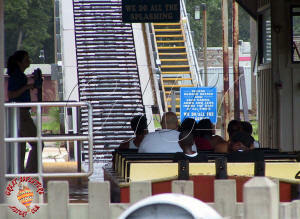 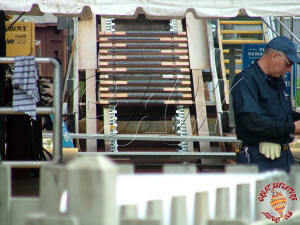 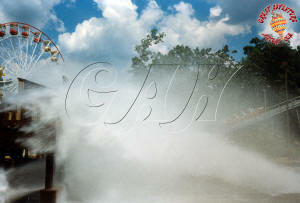 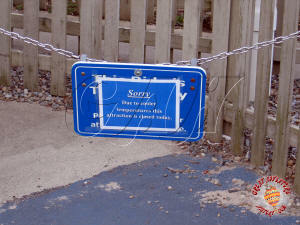 It came as a shock to many guests that the park would remove yet another water ride the following season in 2007. 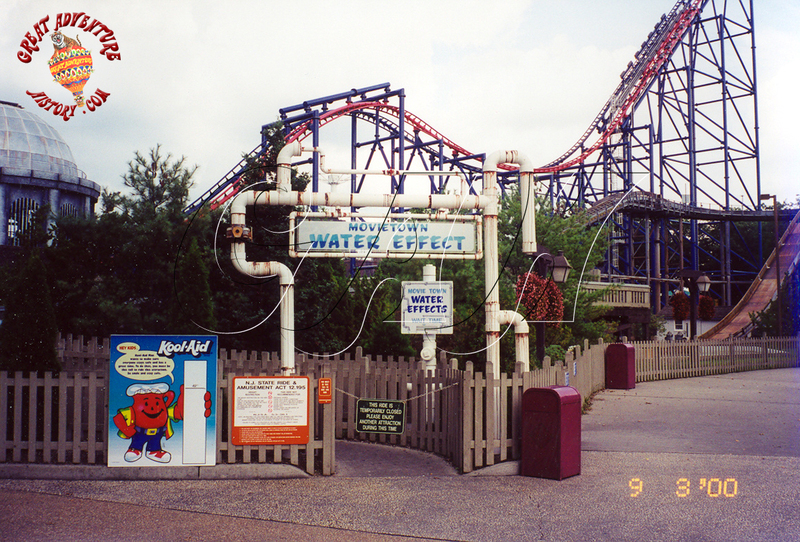 Over the years the once wildly popular water rides lost their appeal to guests as the more tame thrills gave way to the big coasters added to the park. 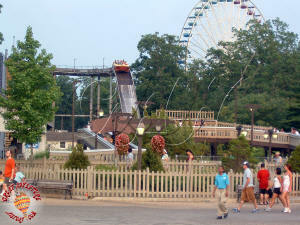 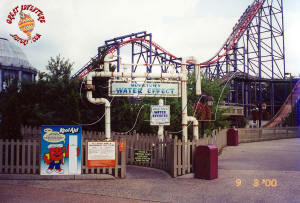 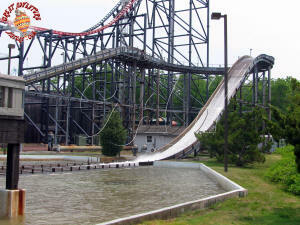 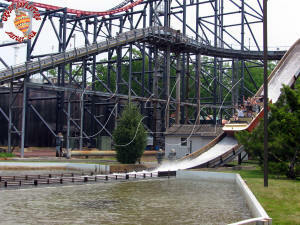 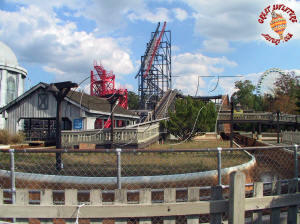 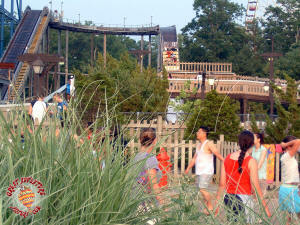 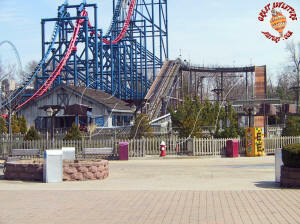 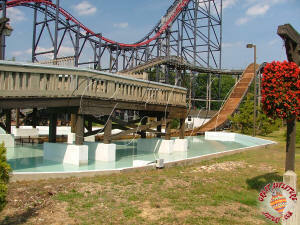 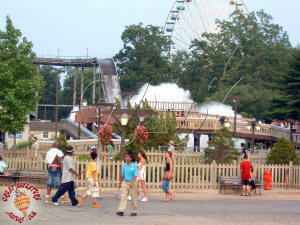 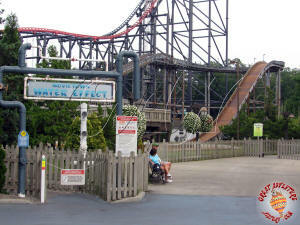 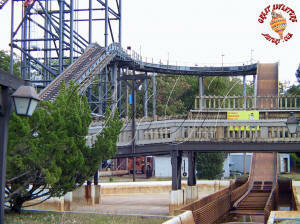 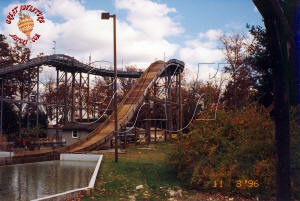 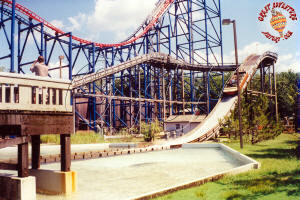 This combined with the addition of Six Flags Hurricane Harbor water park meant there was a lot less demand for water rides so it made sense to cut the number offered in the theme park to save the company money in operating and maintenance expenses while they were in a financial rough patch due to the debts acquired by the company. 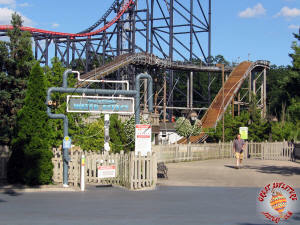 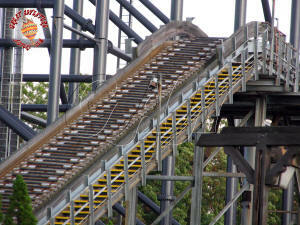 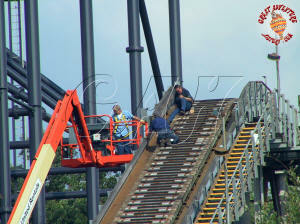 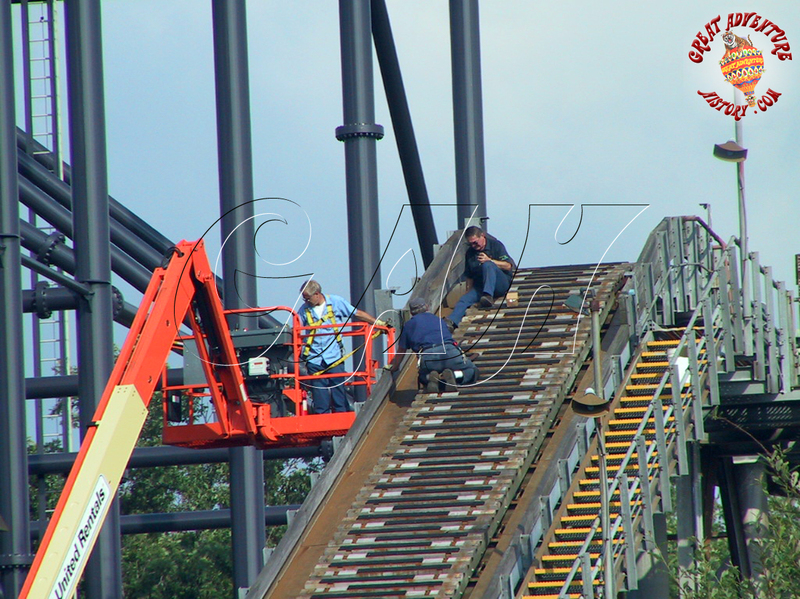 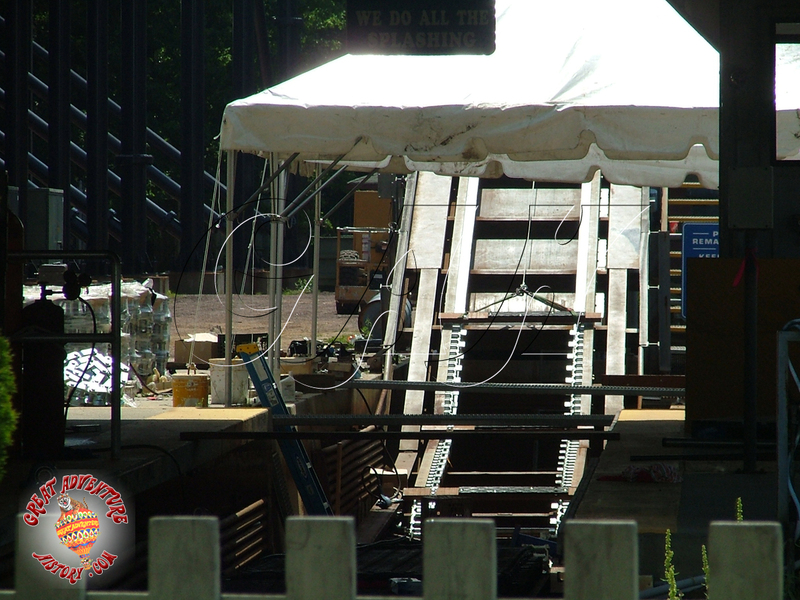 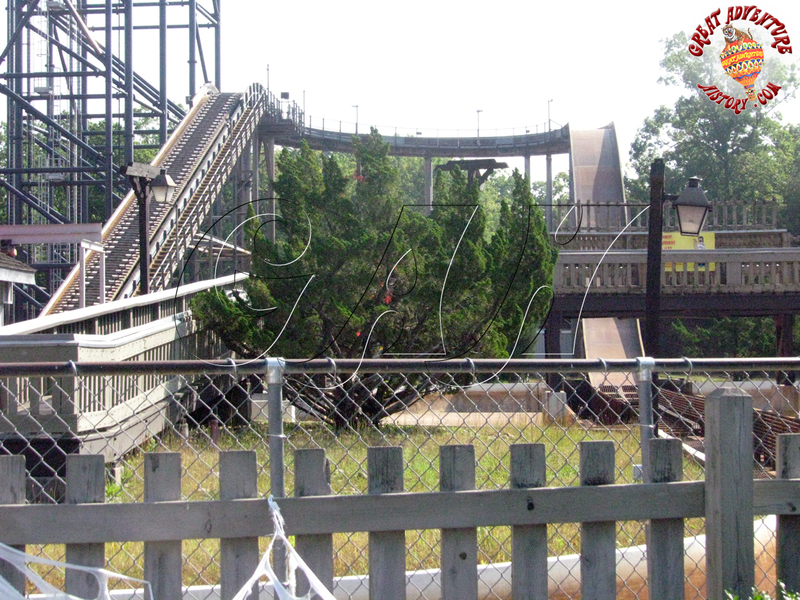 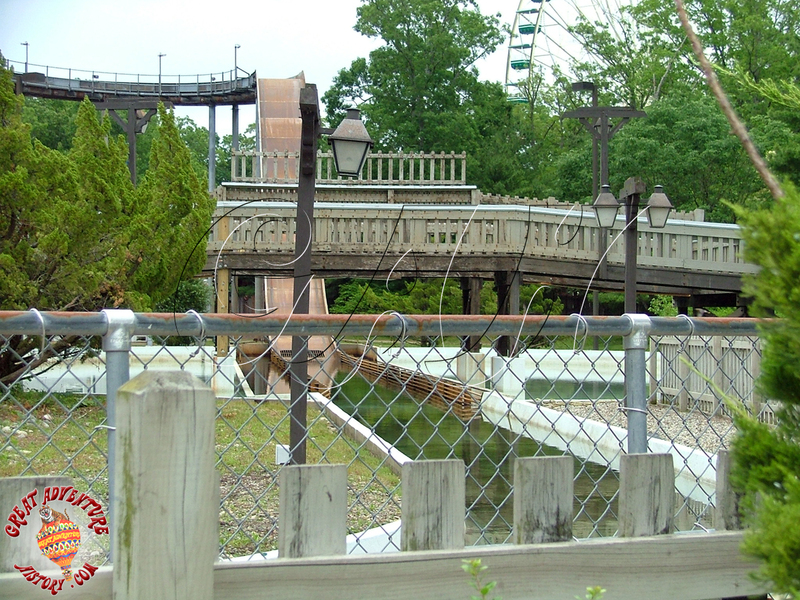 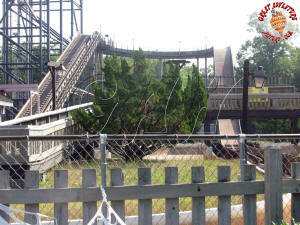 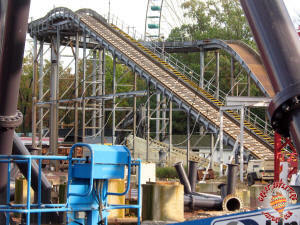 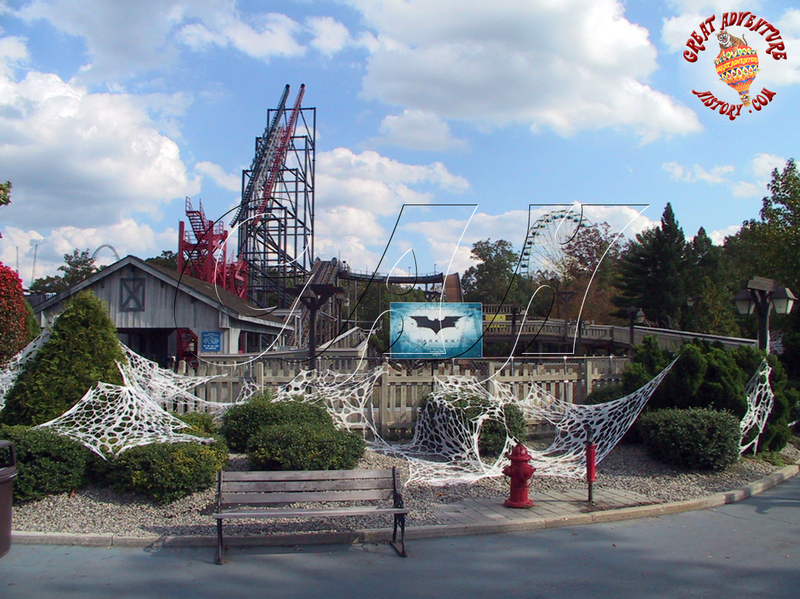 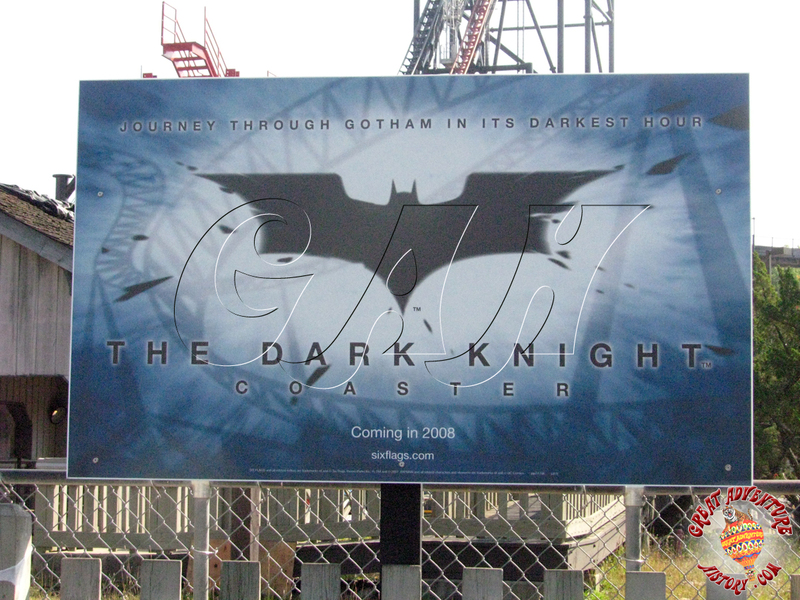 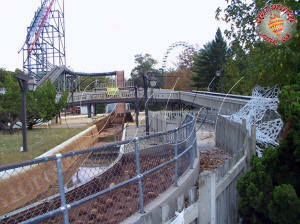 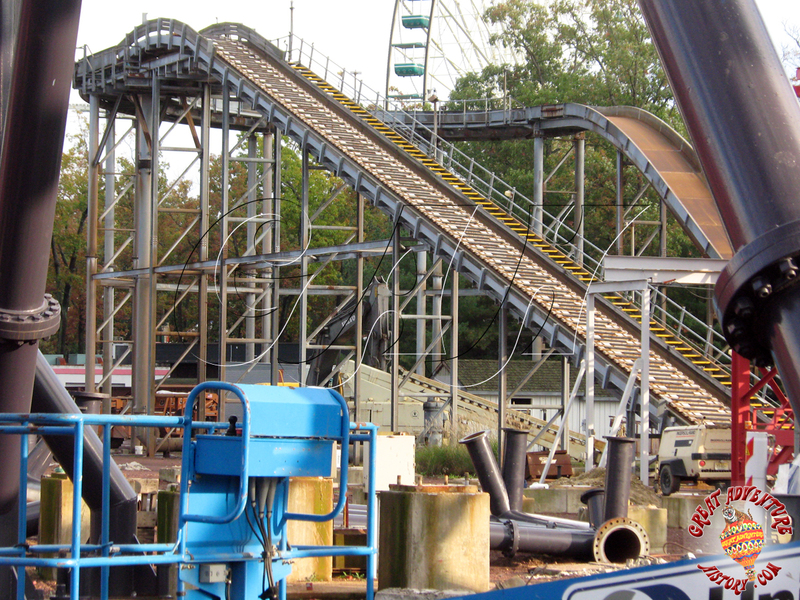 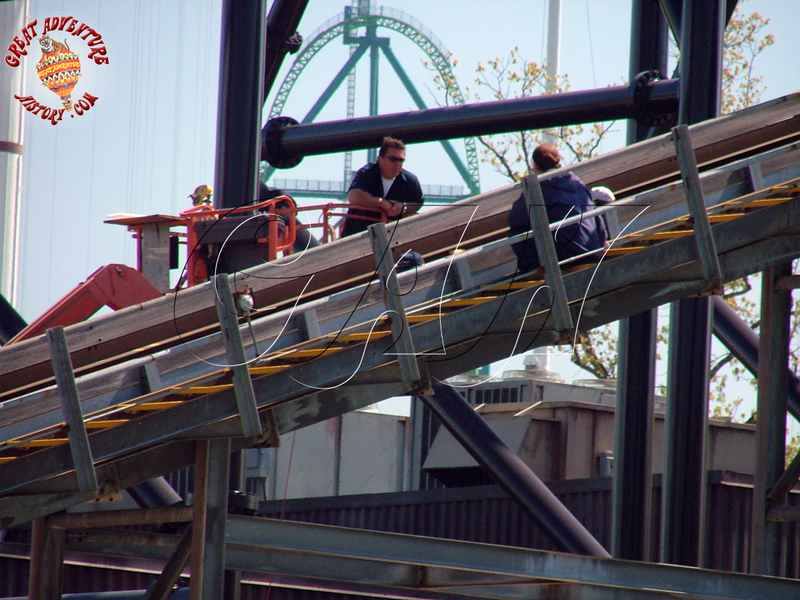 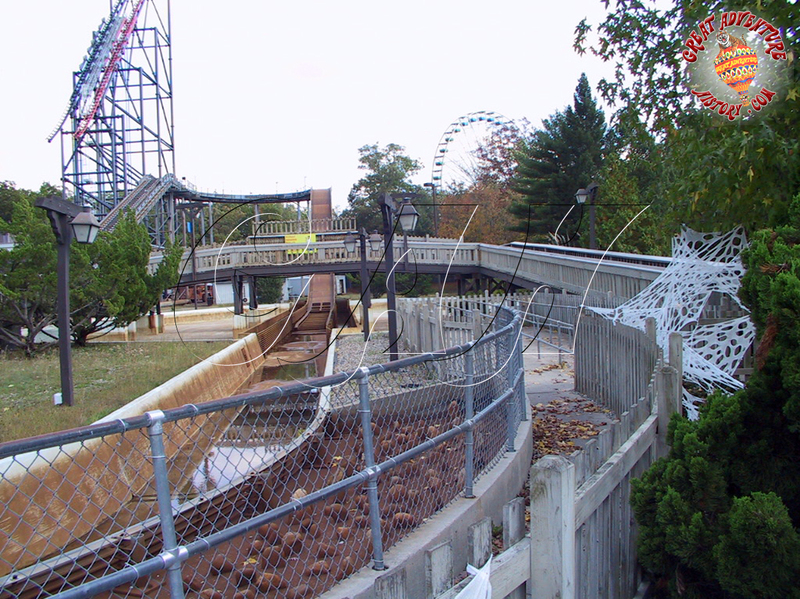 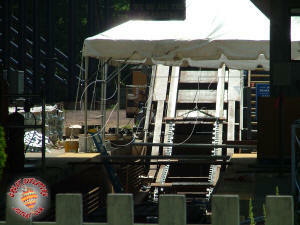 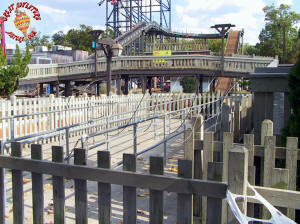 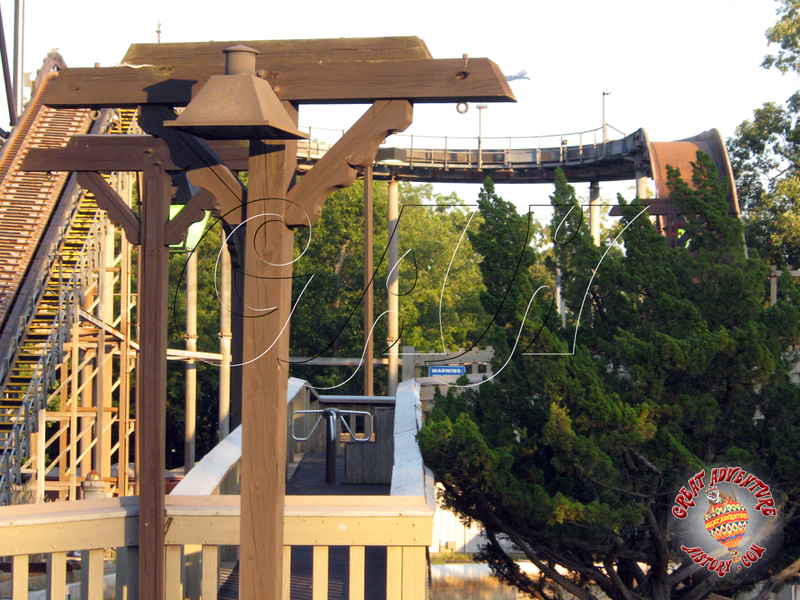 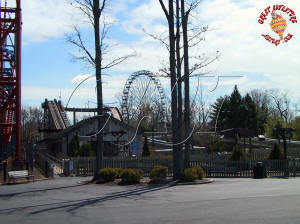 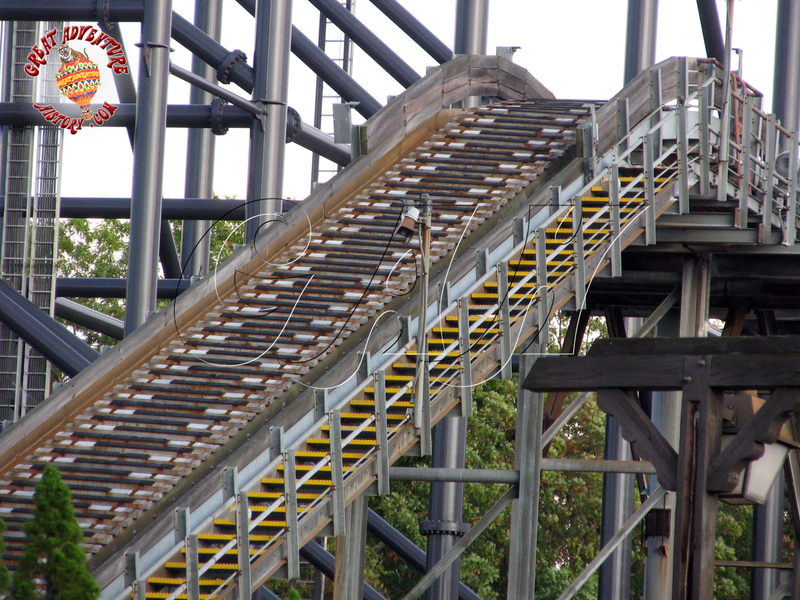 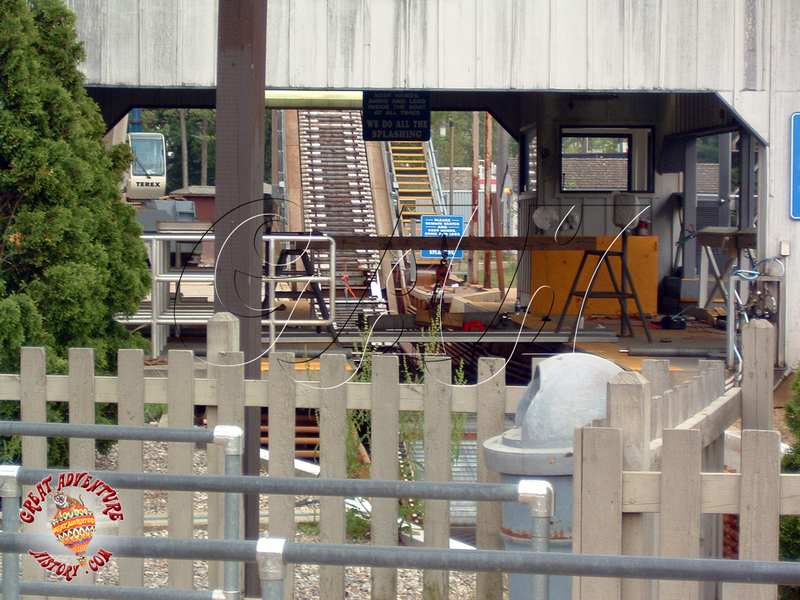 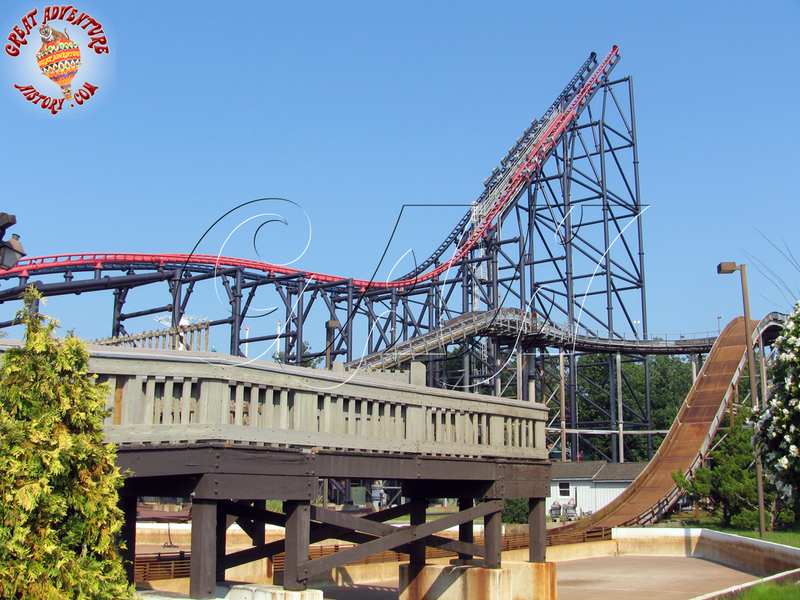 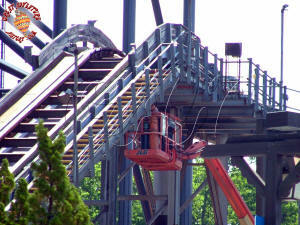 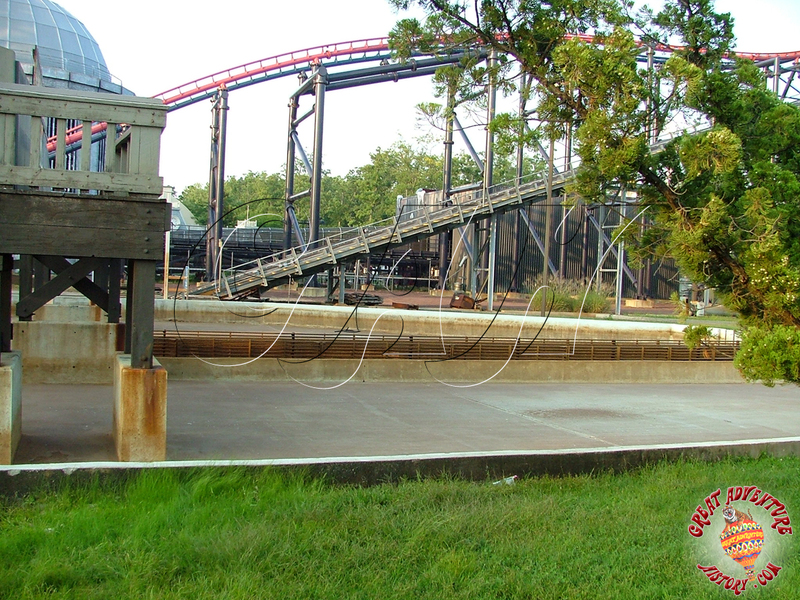 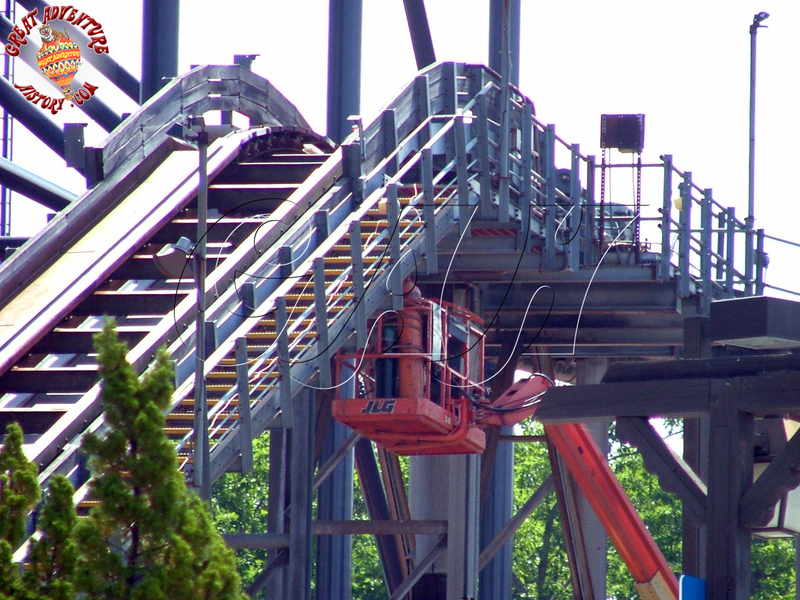 During the 2007-2008 off season SplashWater Falls was removed to make room for the new Dark Knight Coaster which would debut for the 2008 season. The age of SplashWater Falls and the fact that its manufacturer was out of business meant that the ride was scrapped rather than being relocated within the park or sold to another park. 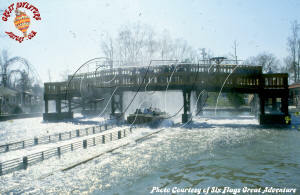 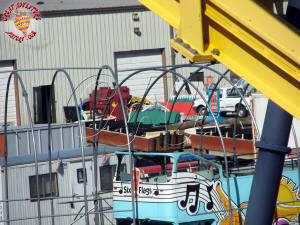 The steel track was sold as scrap metal and the fiberglass hulled boats were destroyed. 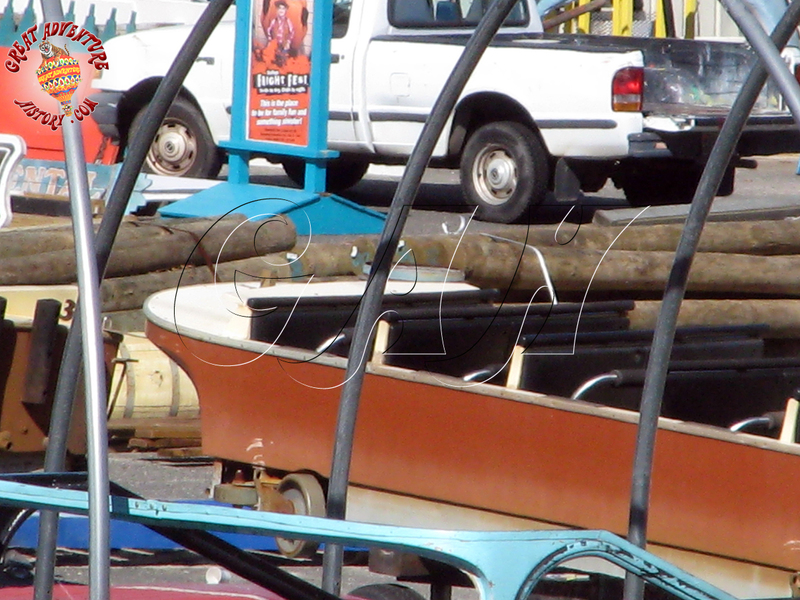 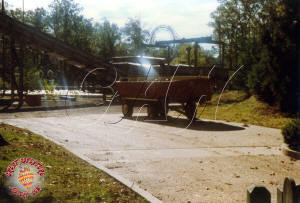 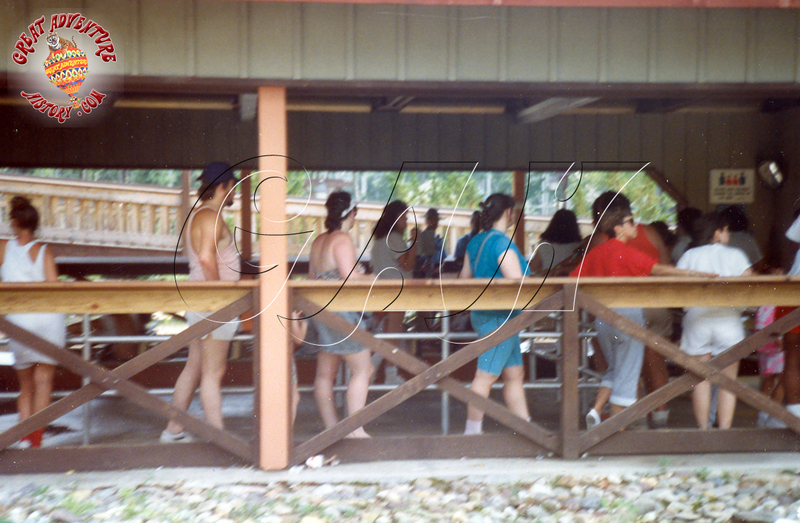 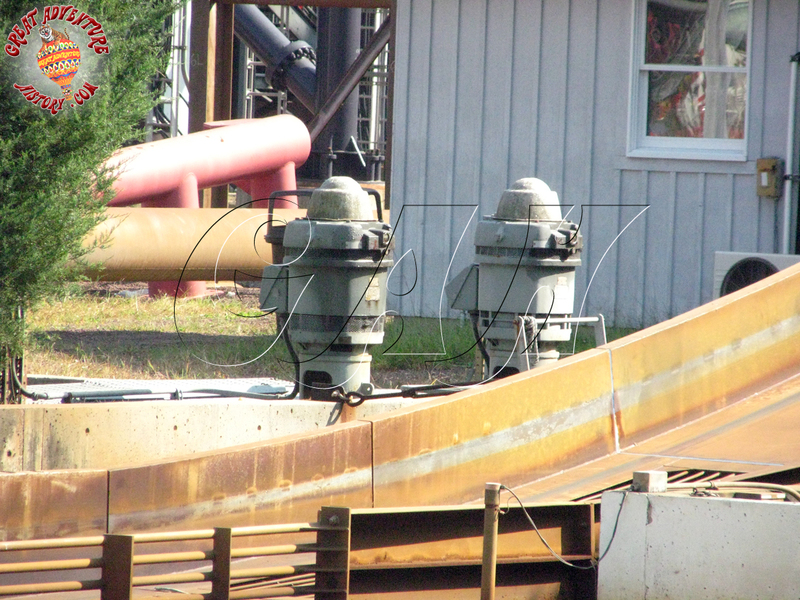 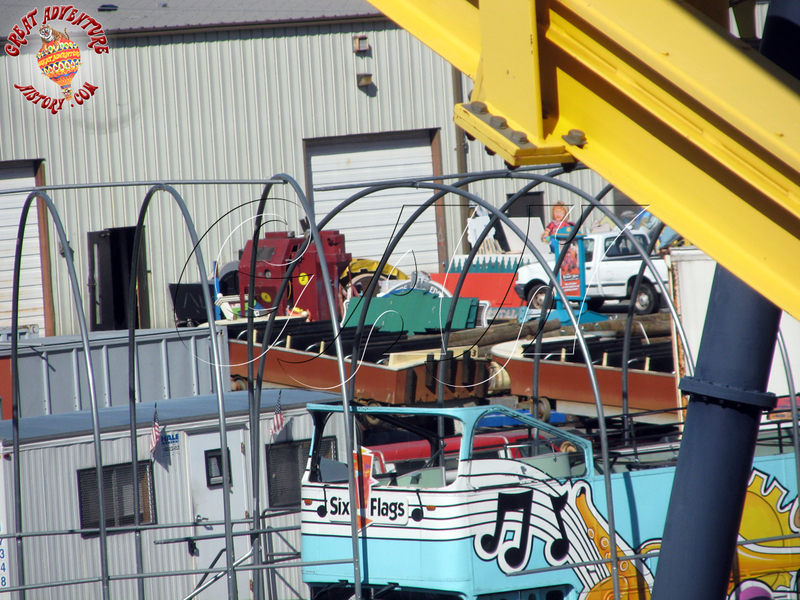 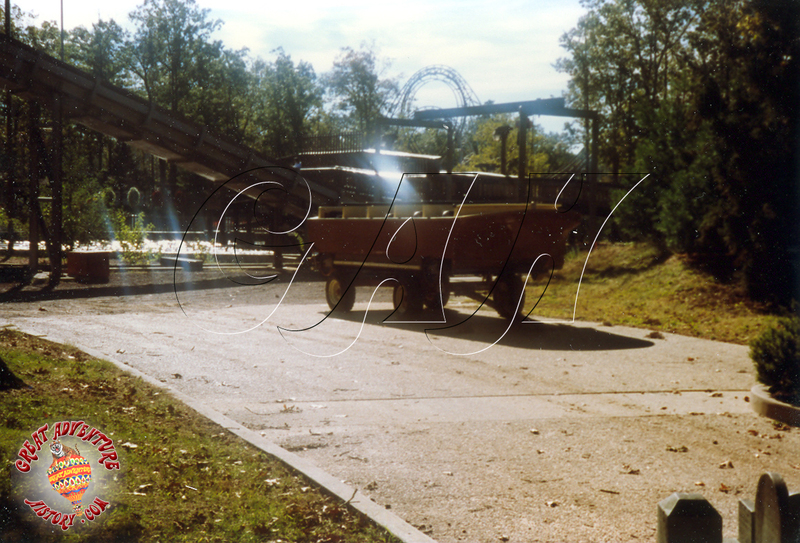 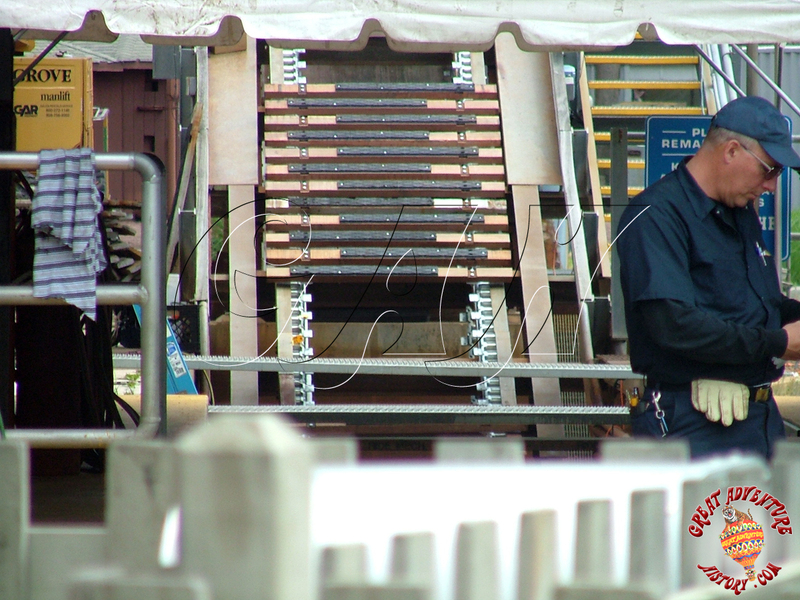 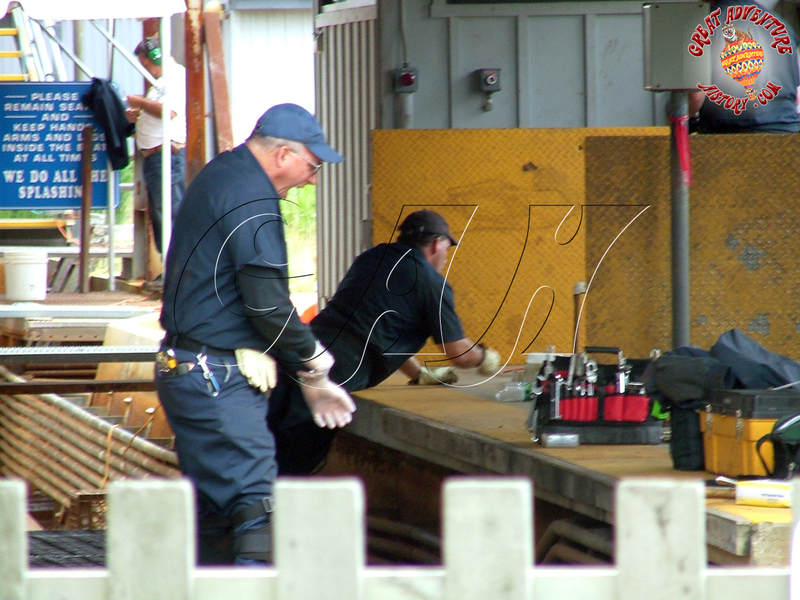 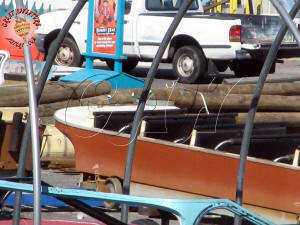 Along with the boats from SplashWater Falls, additional boats which had been moved to the park from Six Flags Astroworld as spares or replacements were disposed of at the same time. 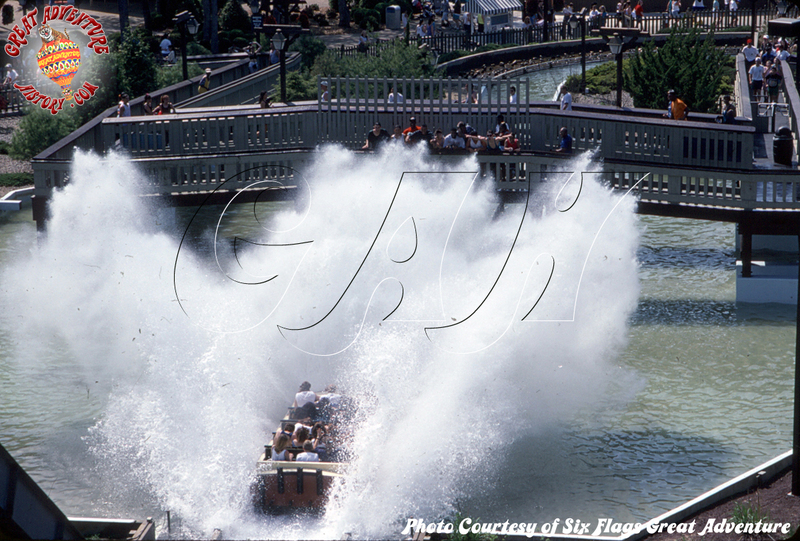 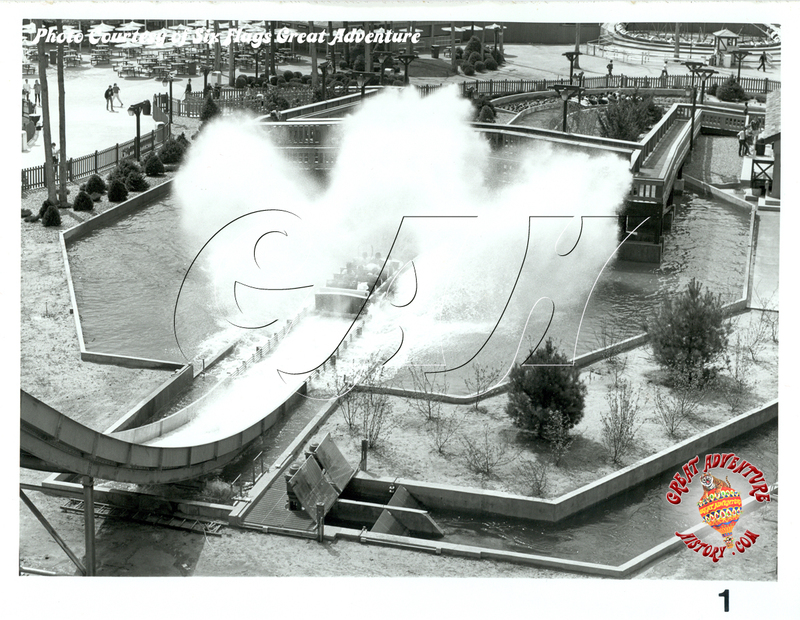 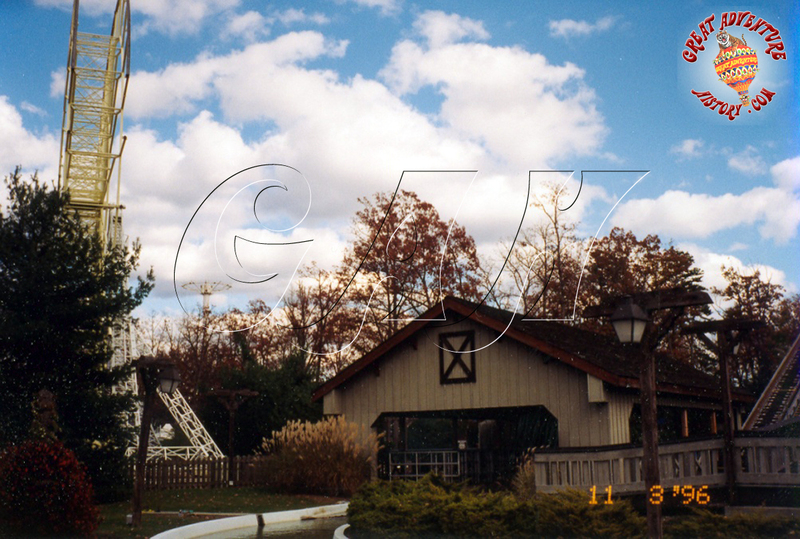 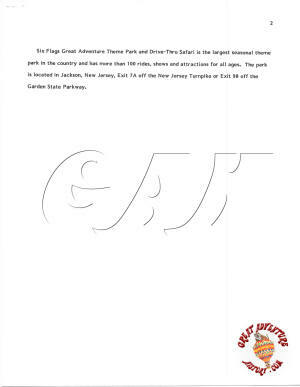 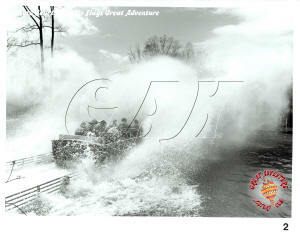 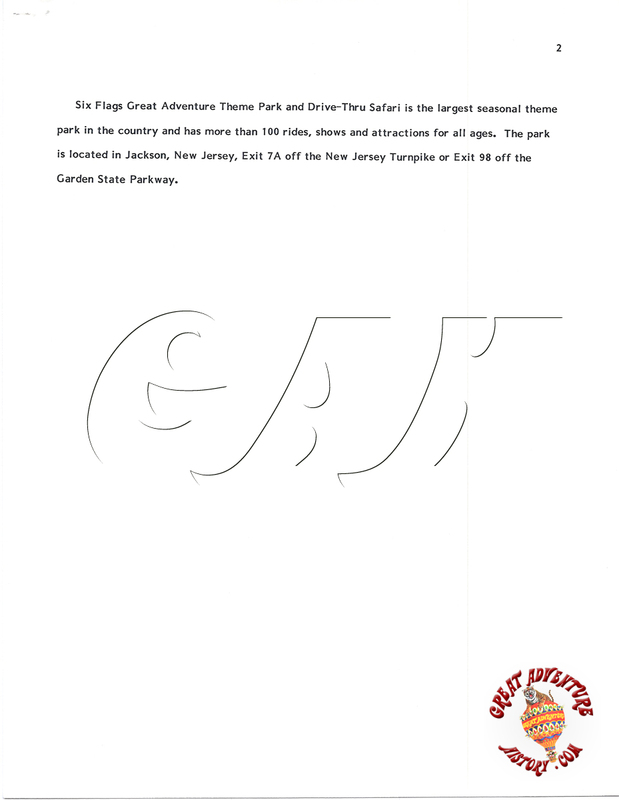 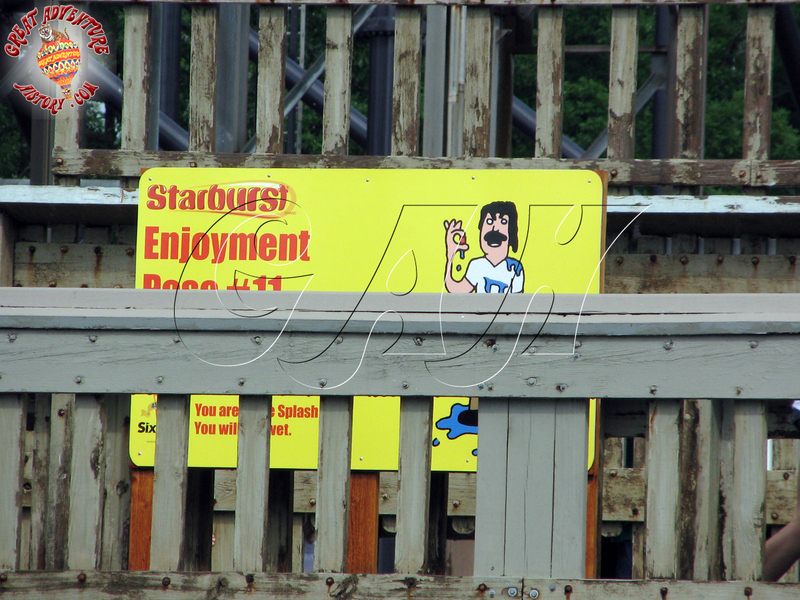 Great Adventure, a park which once boasted having the most water rides of any theme park with two flumes, a rapids rides, a shoot the chutes, and ten wet-dry slides, was now left with only two major water attractions.